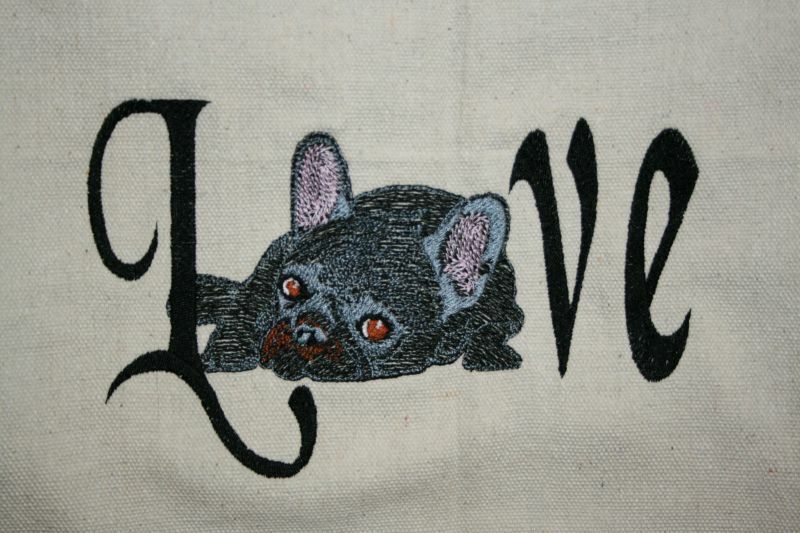 I love to do machine embroidery. 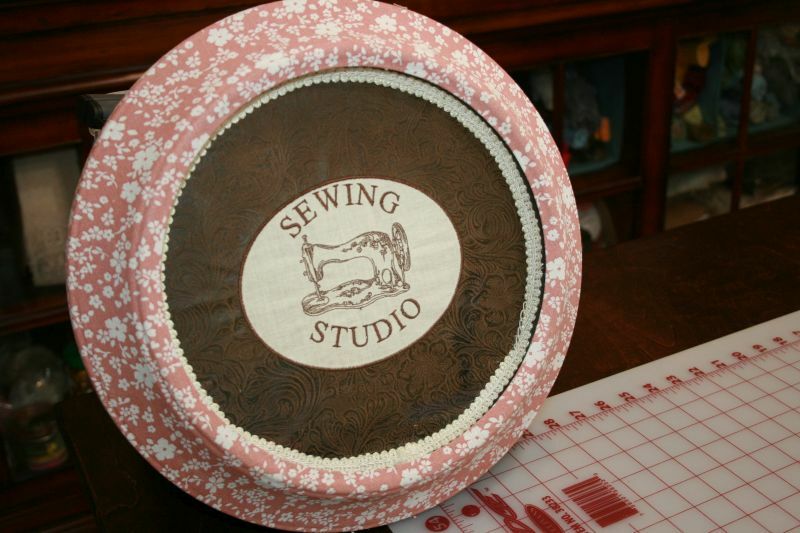 I think it is my absolute favorite part of sewing. 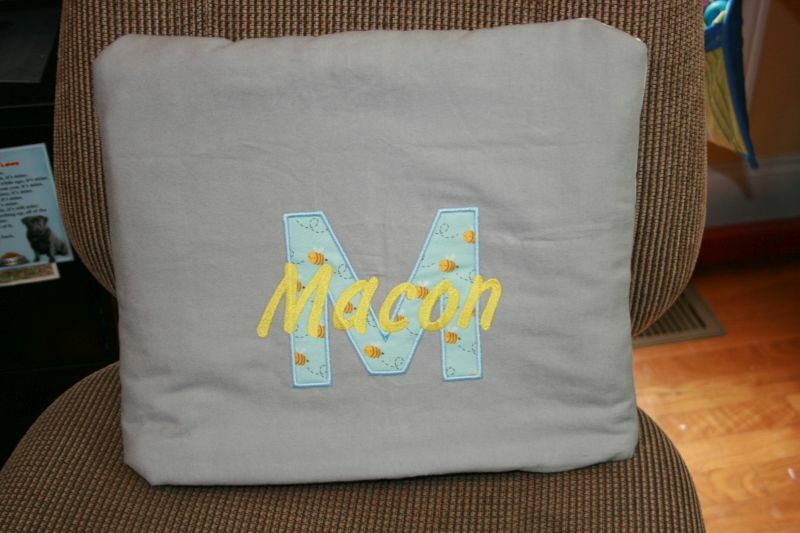 It is also very popular to add monograms or names to clothing and bags. 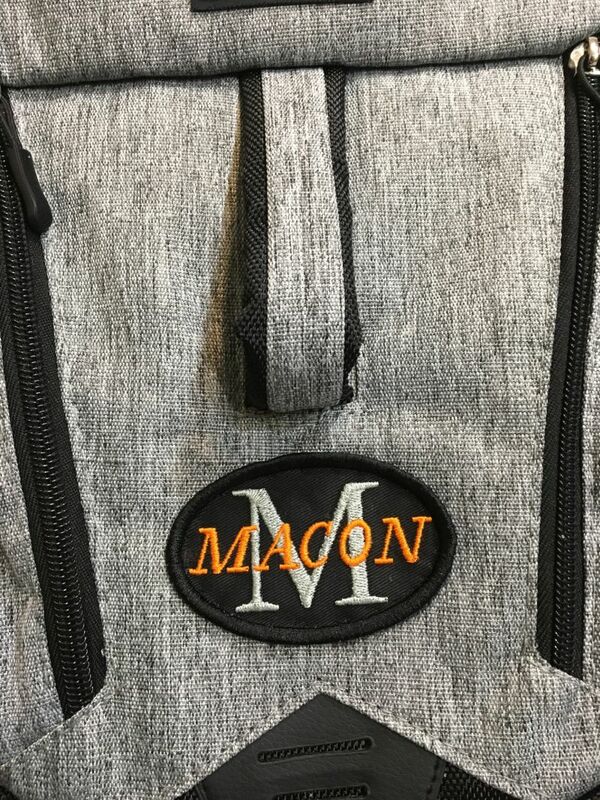 Sometimes, you may get a request to monogram an item that really should not be hooped. Now notice I didn't say "could not be hooped". I said should not be hooped. You can see from the backpack above, there are a lot of pockets. I have a multi needle machine and many different hoops. If I had worked hard enough, I think I could have gotten this loaded on my machine, crossed my fingers and hoped for the best. I don't like to work that way especially since this item was provided by the person requesting the monogram and I look at it as one of a kind. Here are the issues I had and what I did to solve them. The backpack is actually a diaper bag. Even though it had many different pockets, they were sewn and nested together on top of each other or had interior lining to deal with. 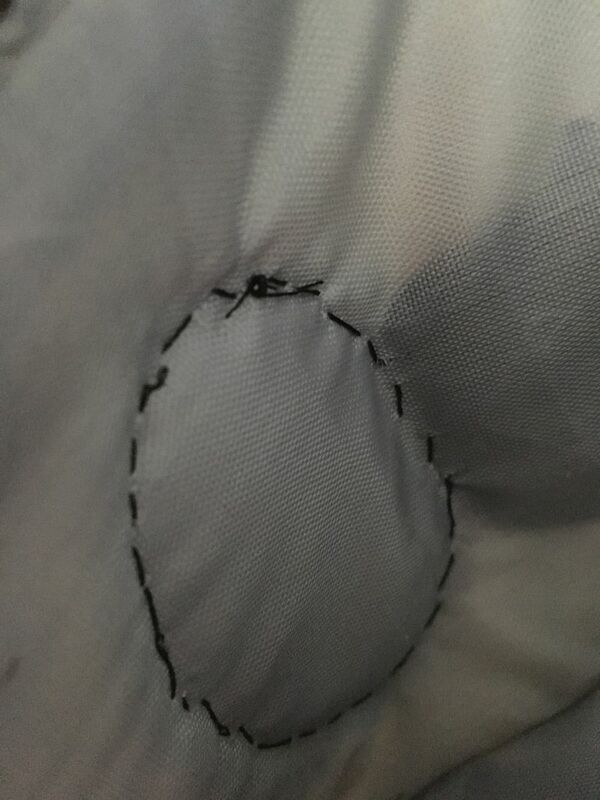 Sewing through the lining would make the pocket unusable. 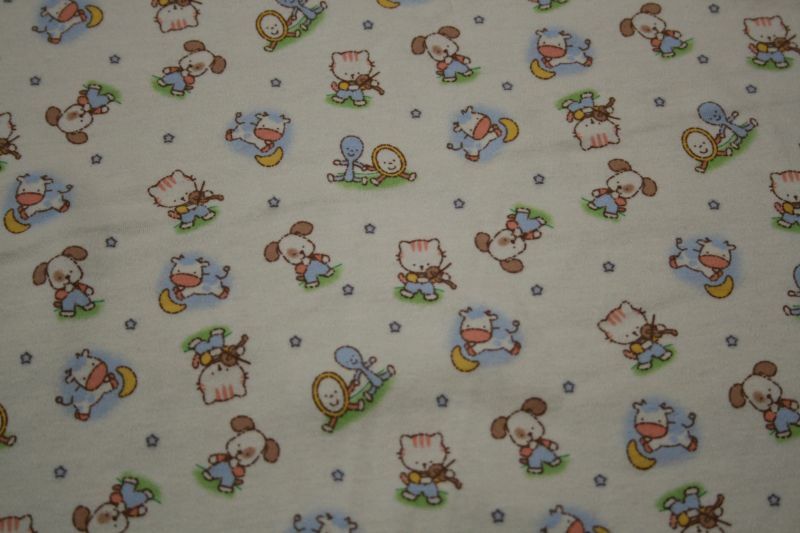 Babies have a lot of stuff so losing a pocket was not an option. Also, one of the larger side pockets might have been a great spot, but it was insulated so you don't want to sew through that and undermine those properties. The front pocket has an easy grab handle right in the middle, so it made getting a hoop stable kind of sketchy. I immediately thought of a patch instead of an embroidered monogram. One factor with most backpacks is the linings are often made of materials that melt easily. So doing an iron on patch was out of the question as I didn't know if I could apply enough pressure and heat to adhere a patch. 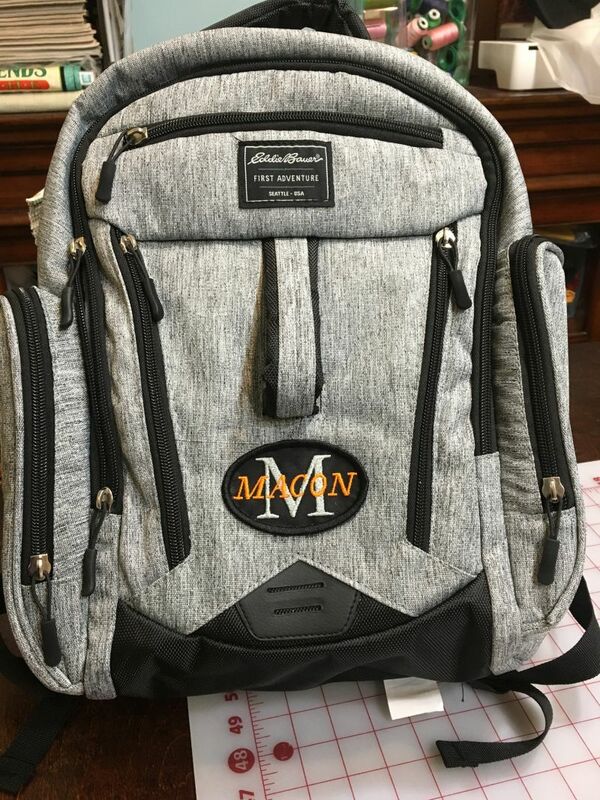 I did go ahead and digitize several different choices for the monogram once I had looked over the backpack; decided on my size constraints for the design and the best place to put it. I sent pictures of the potential sewn out patches to the soon to be parents with explanations and options before I did anything to the item. I can't stress enough the importance of doing all of this front end work and communication. People love to be a part of the actual design process and know they have choices. If you supply several different ways or ideas, they will be more satisfied with the end result. 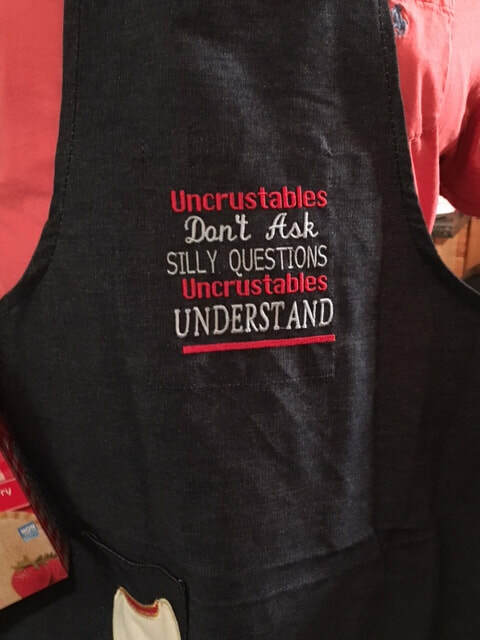 It will also help you manage any lead time because they know you are working with them and will be prepared to wait a little longer than with someone who just embroiders the item with no input from the client. 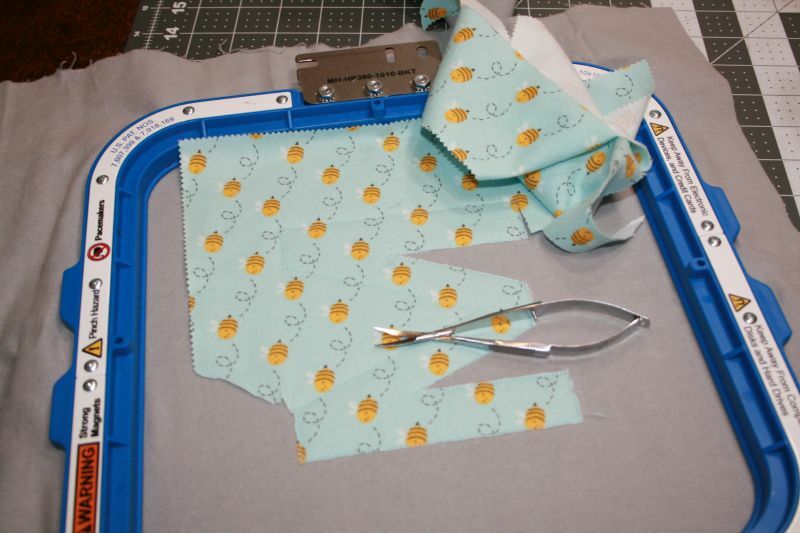 This doesn't mean you have to sew each design to a patch. 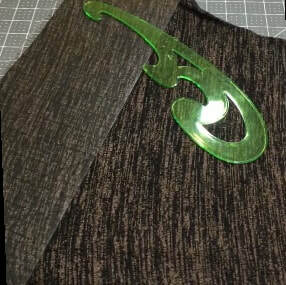 You can sew it on stabilizer to verify your design looks great and send that instead. Since I had the patches sewn I could send over photos of the final looks. Here is the final solution. The interior lining of these types of backpacks have to be very easy to wipe clean and deter bacteria. 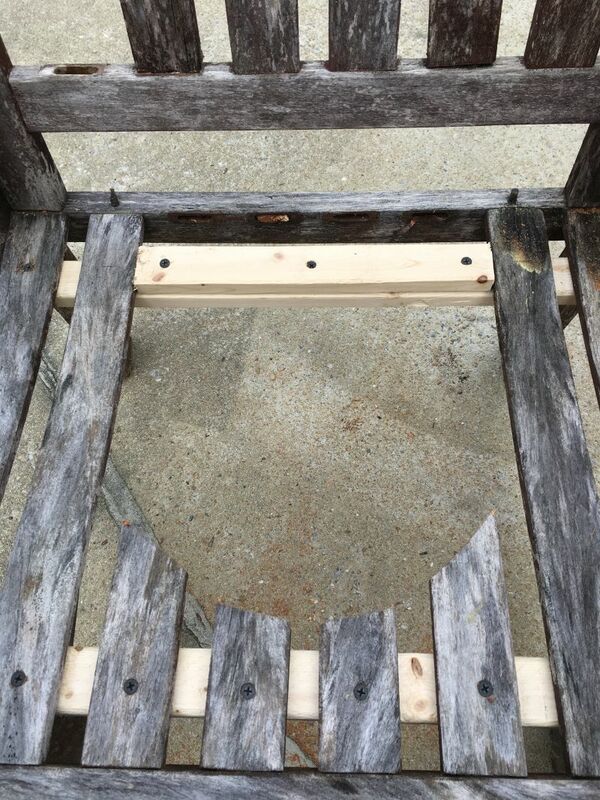 Using any kind of patch glue would not provide the stability over the long term life of the item. In fact, if you try to glue them, it may just wipe off. There is really no way to know exactly what type of chemical treatment has been applied from the factory. So I did an simple stitch using heavy weight thread and an upholstery needle. I could control exactly how many stitches I made and where they were executed. 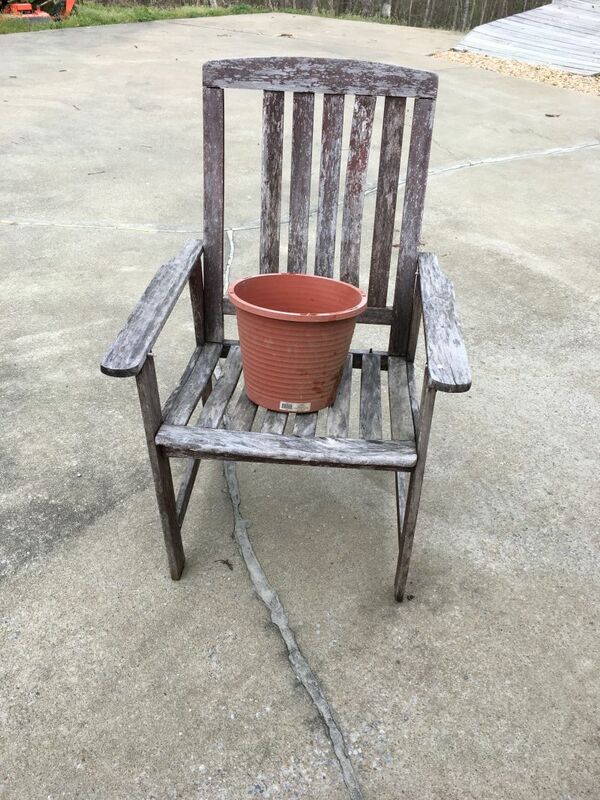 This method will guarantee that patch won't go anywhere. They loved the final result. It is unique and beautiful. 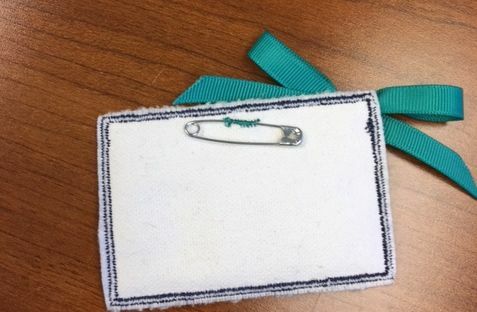 If you do something like this, you may also want to up sell any additional patches you have created for other potential garments, blankets etc. A very nice gesture would also be to gift them at the baby shower. I hope you have enjoyed this post, share what you learn and are generous with what you create. Someone will appreciate your hard work. I have been working on more activity mats to donate to my local retirement facility. 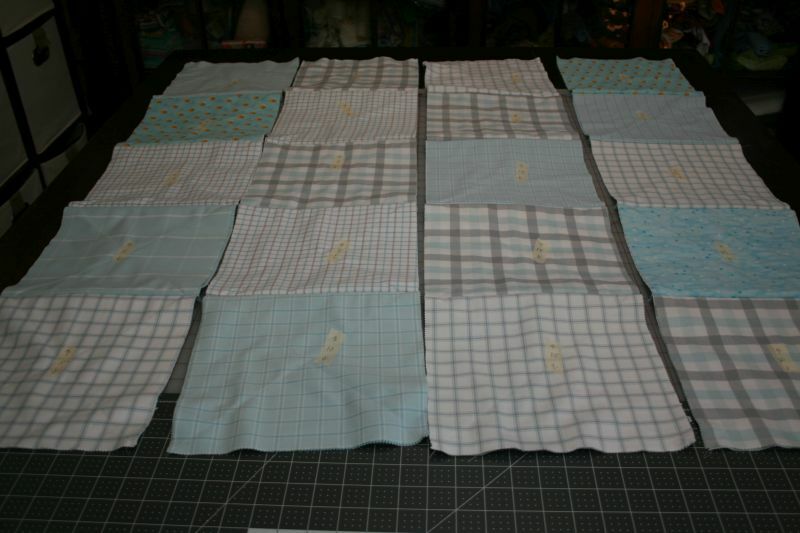 My first blog article showed how I like to construct the mats using dish drying mats purchased from the Dollar Store. You can revisit that post here. These projects are great because they fulfill two purposes. The first and best one in my opinion is connecting with your community. When you create something selflessly with someone else in mind; you are giving a gift that is very valuable. YOUR TIME. 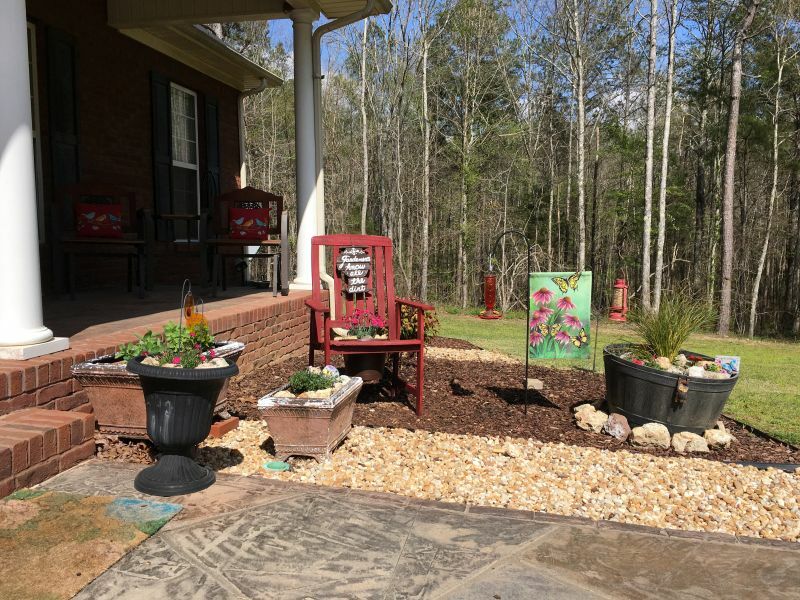 The second purpose in making these projects is they help me get centered when I am not feeling very creative. You know how you sometimes lose your way and feel a little disconnected from doing artistic work. 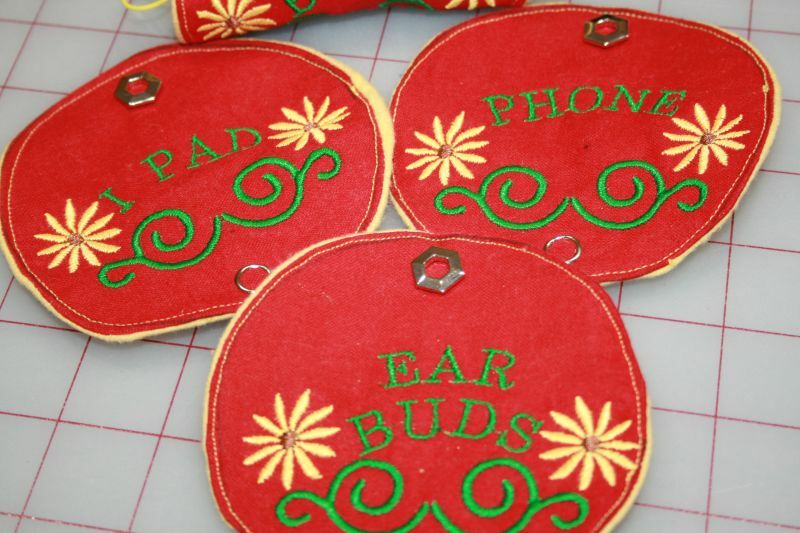 These are small enough to be completed in short bursts of activity. 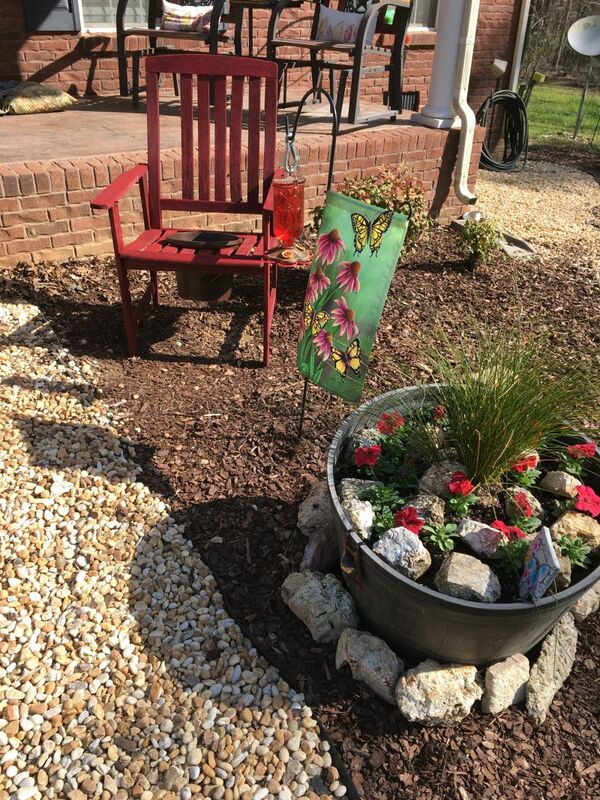 Also, end pieces, scraps of trims and endless choices make them relaxing as well as inexpensive. I did four different themes this time making sure to have designs for men and women. My thoughts also were on things or events that were common hobbies or pastimes of older people in my life. In each mat, I incorporated very simple textiles that resonated with that theme. 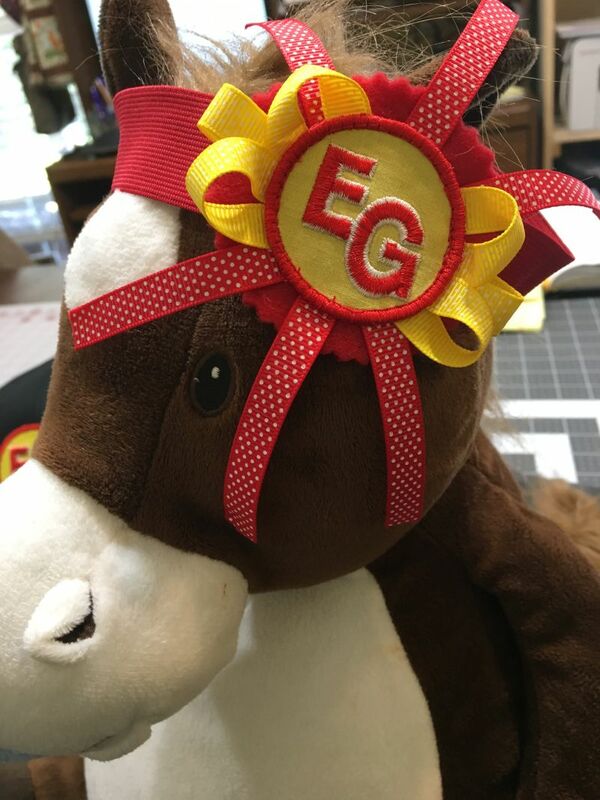 It might be a button, ribbon, elastic, ink stamp or embroidery. 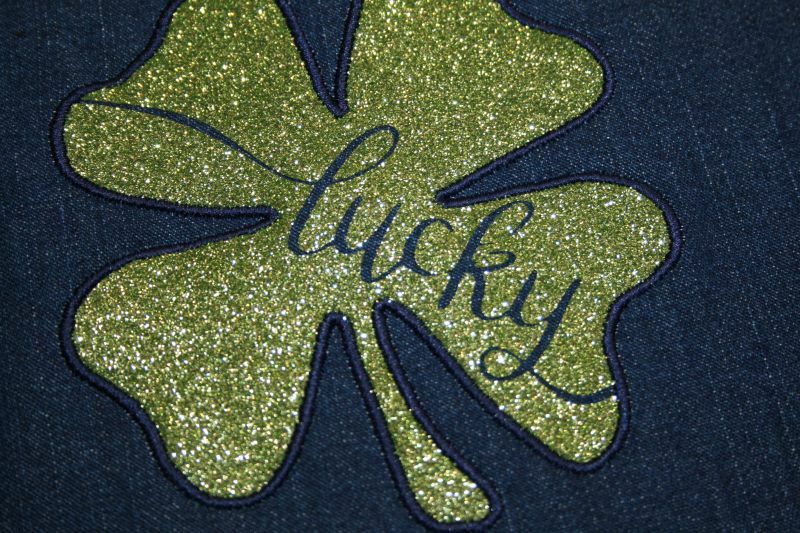 The back of the mats have an extra special embroidery done also so the mat is attractive from both sides. Also, working on one mat at a time instead of trying to do them all together made it more fun. Once I had one done to my satisfaction, I put it aside and when all four were complete, I delivered them to the facility. The smiles and thanks were like a breath of fresh air to me. I also brought several small tissue covers wrapped neatly in plastic baggies. They hold Bingo each week and said they would use them for the prizes. There are four slideshows below so you can see all of the pretties. I hope you have enjoyed this post and get inspired by it; share what you learn and are generous with what you create. Someone will appreciate your hard work! 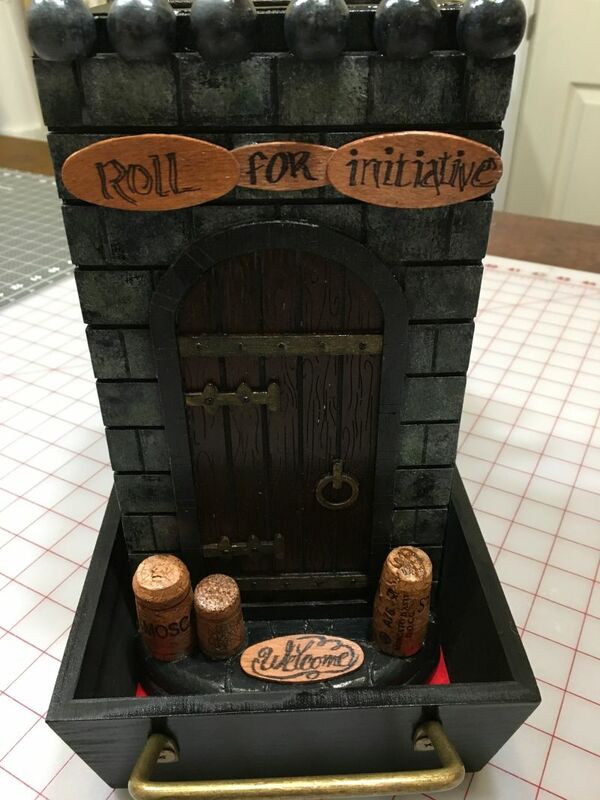 Do you have someone in your life who loves Tabletop gaming? 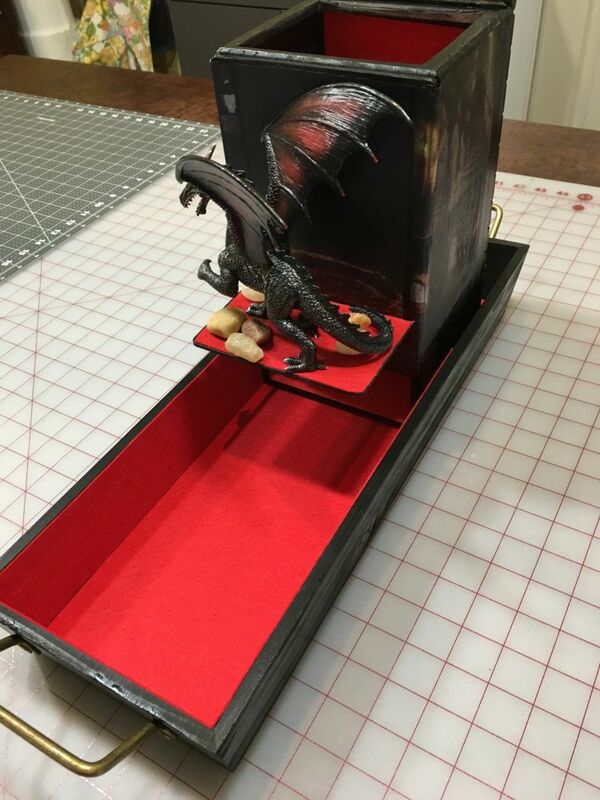 If so, they may be very interested in having a dice tower. 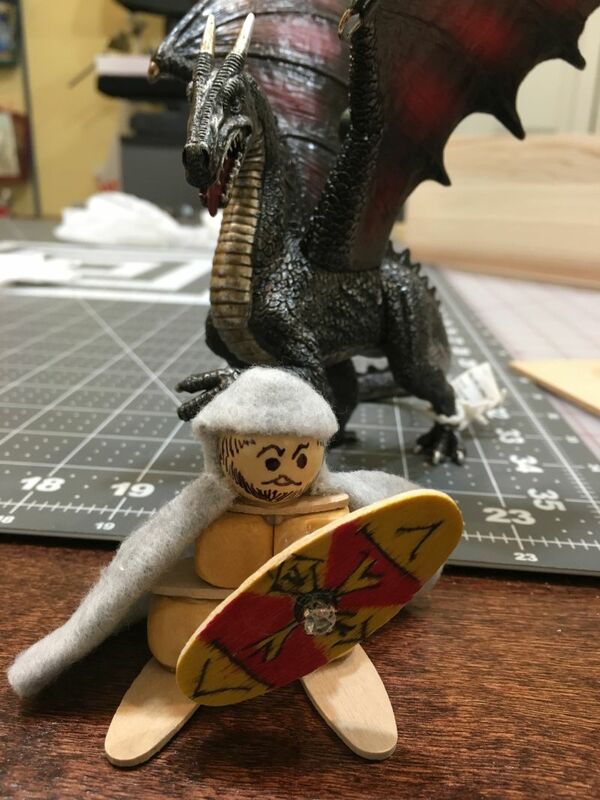 My sons love to play Dungeons and Dragons. I am telling on my age a little when I say I remember D&D from my childhood. 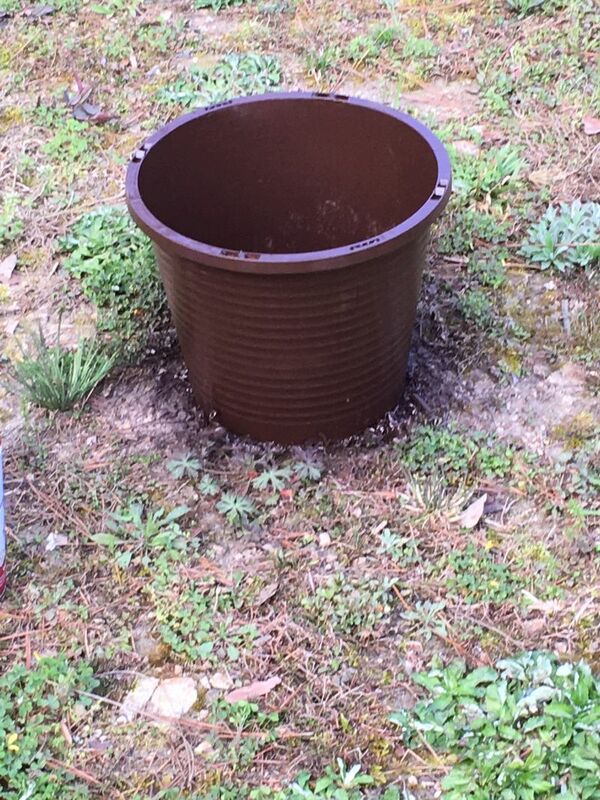 It has stood the test of time and is just as popular today. 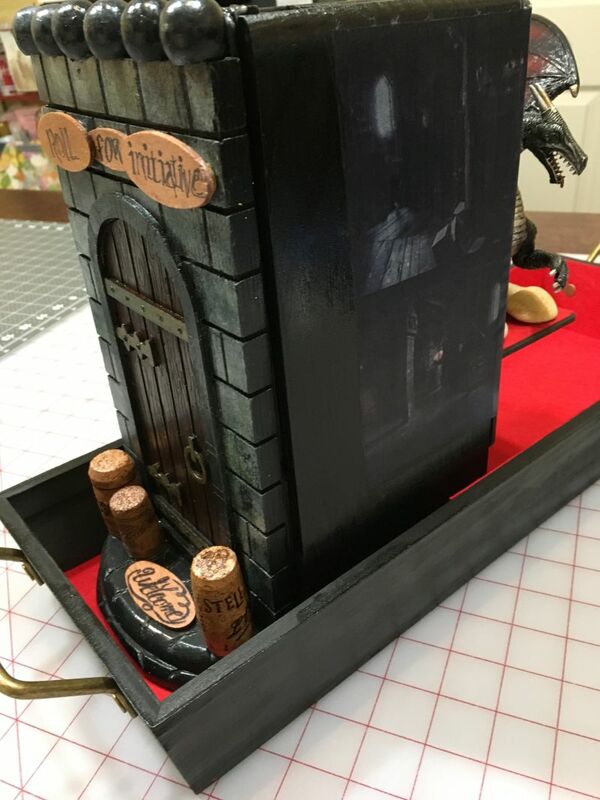 My husband and I wanted to make something for our boys that would be useful and help them enjoy their campaigns. 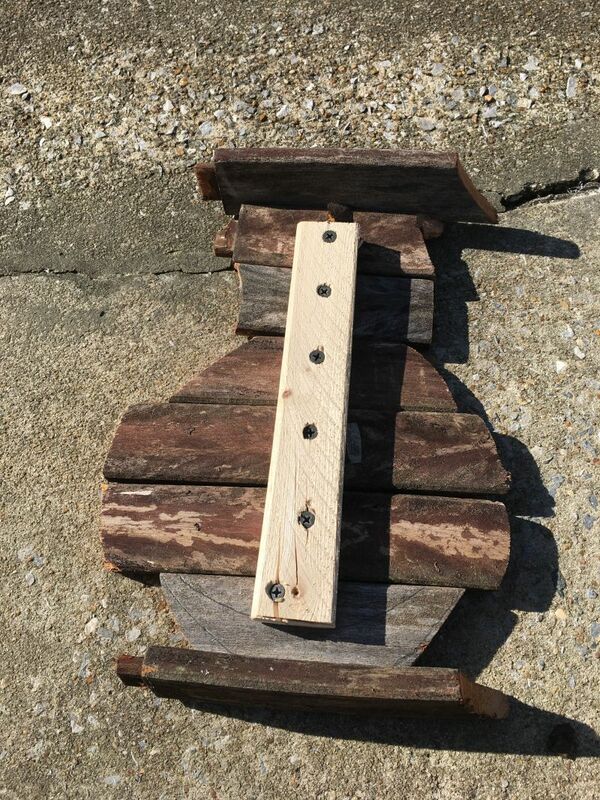 We made a trip to Hobby Lobby and walked around until we found some unfinished wooden items we thought would work. 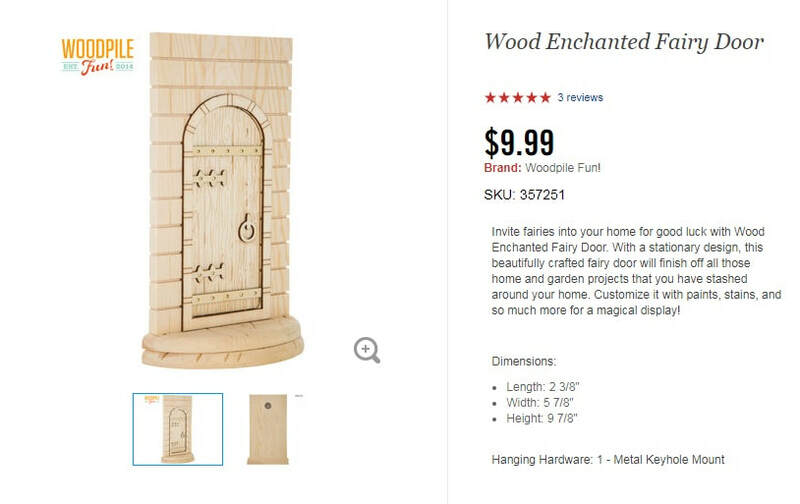 This little fairy door started it off. Doesn't it look like a castle door? 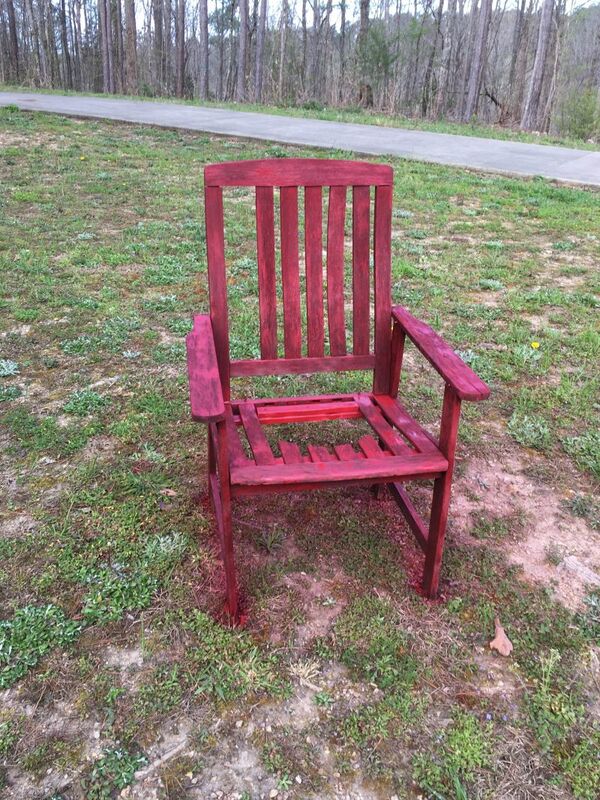 The addition of paint and other embellishments made it look like the entry point for players. 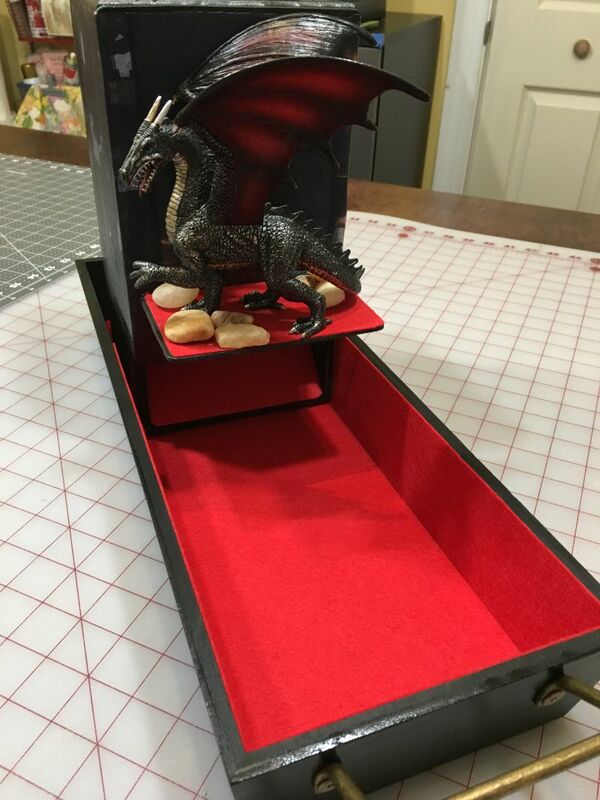 This tray served as a great base for rolling the dice into. 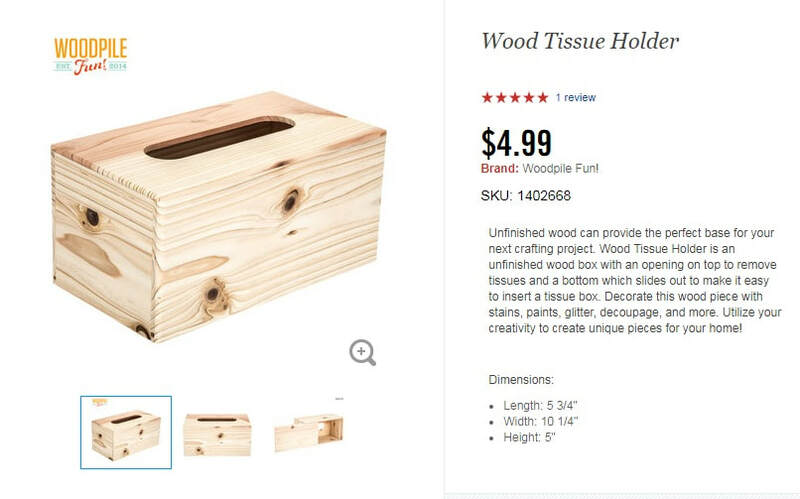 This wooden tissue holder was the perfect size. When you stand it up on one end, the base slides off. This made the entire back open and available to add the interior baffels. On the other side where the tissue hole was, we cut open a space for the dice to exit and then added a piece of balsa wood to make it look neat. Spray paint made everything one color and felt helps muffle the dice sounds. 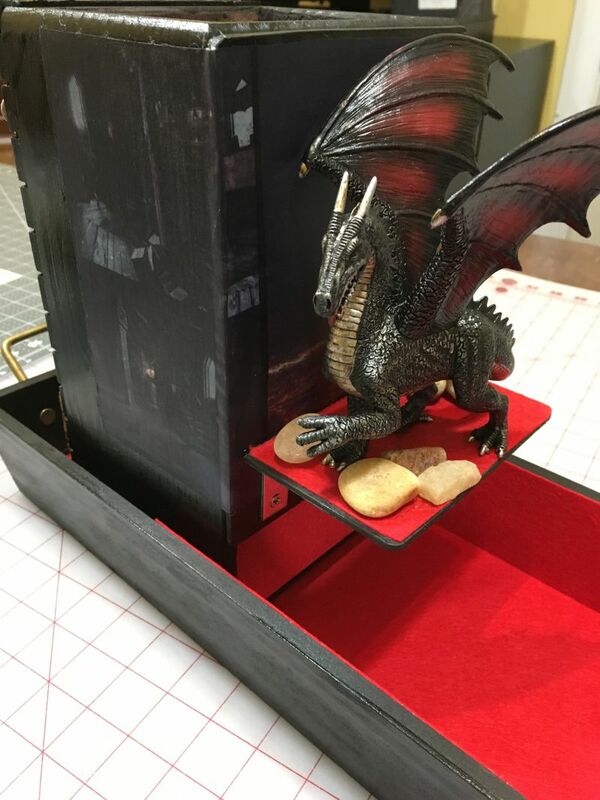 A dragon added to the tower with a few stones really sets a great gaming mood. We made a couple of characters out of the extra wooden pieces. We used Modge podge and some printed pictures to fill in the sides. This makes it seem like you are looking through the tower. We did a short youtube video with some more pictures of our process. You can view it below. Altogether we spent around $50.00 on the supplies. 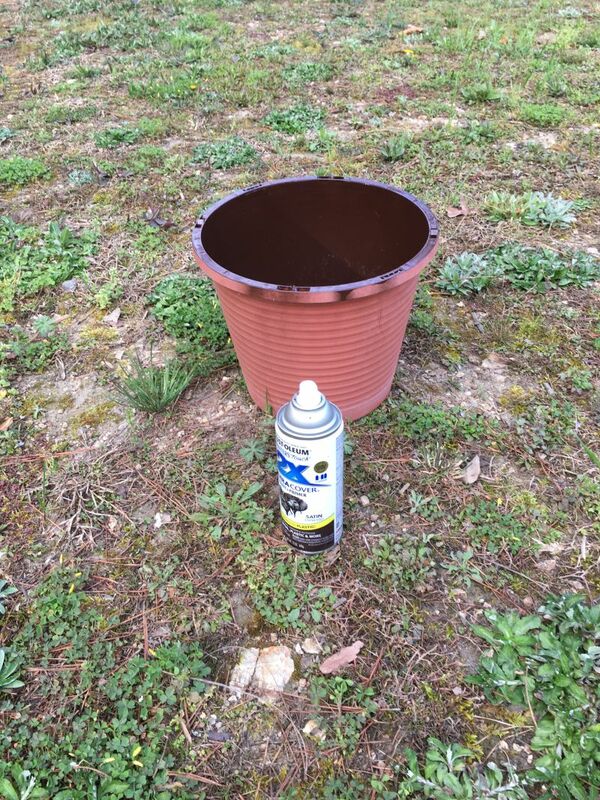 We did have some of the paint and glue already. A Dremel tool was really all we used to do the wood cuts. The items were very soft wood. I hope you enjoyed this post, share what you learn and are generous with what you make. Someone will appreciate your hard work! What a neat project I have for you today. I have been very busy creating lots of new embroidery designs and stitching them out. 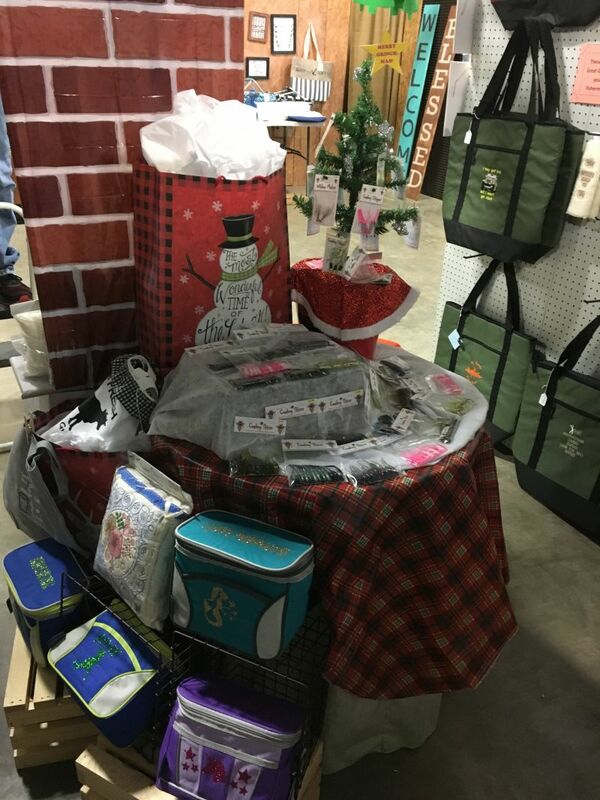 So busy in fact that I had to get a booth at our local flea market because my studio was getting way too full. 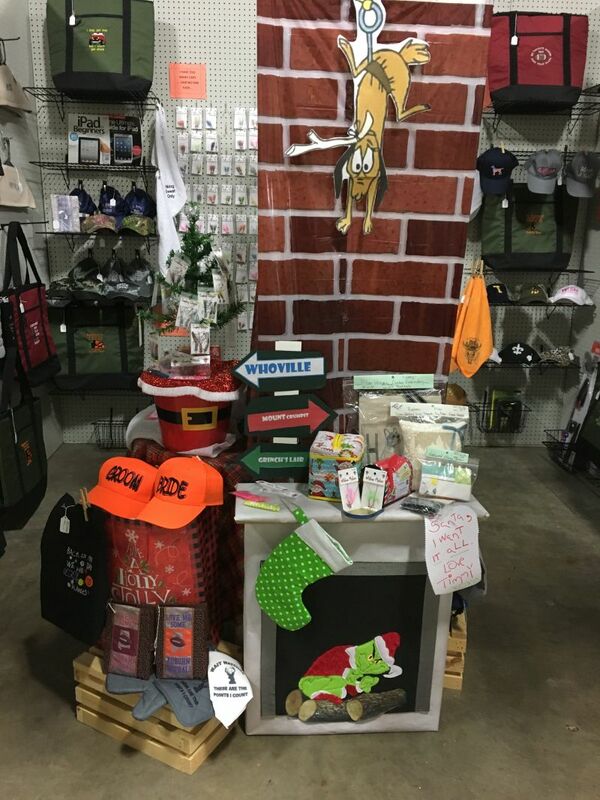 Since it is that time of year when the Holidays are right around the corner, and it is always good to decorate retail spaces, I decided to do something fun. 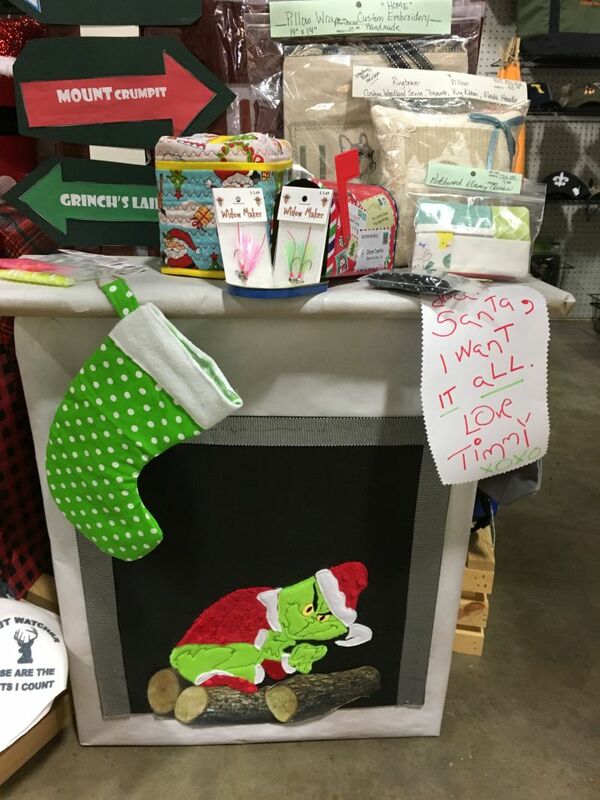 This little fireplace and all of my decorations were quick and inexpensive to put together. I made the fireplace from cardboard and wrapped it in white paper. The brick background came from the Dollar Tree. It is a plastic wall panel that I folded in half and taped to the back of the fireplace. The top of the plastic was wrapped in packing tape to stiffen it up and fishing twine secured it to the above rafters. 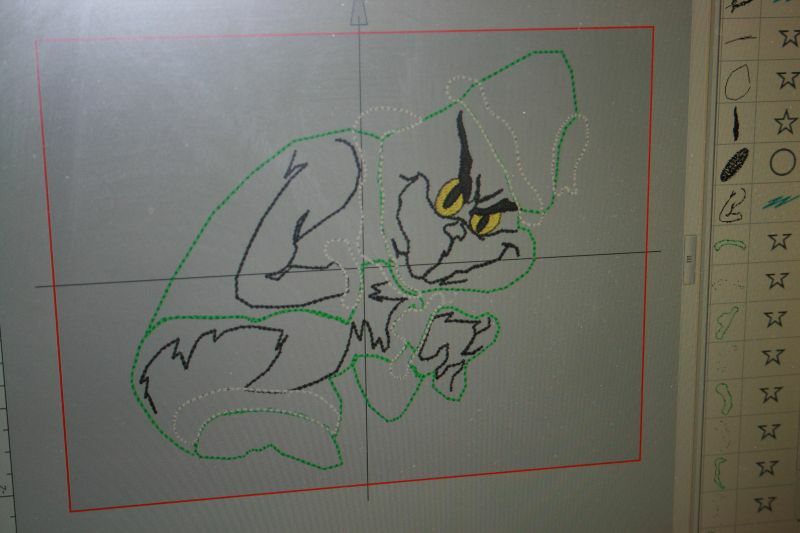 The Grinch's dog "MAX" was just printed on computer paper. 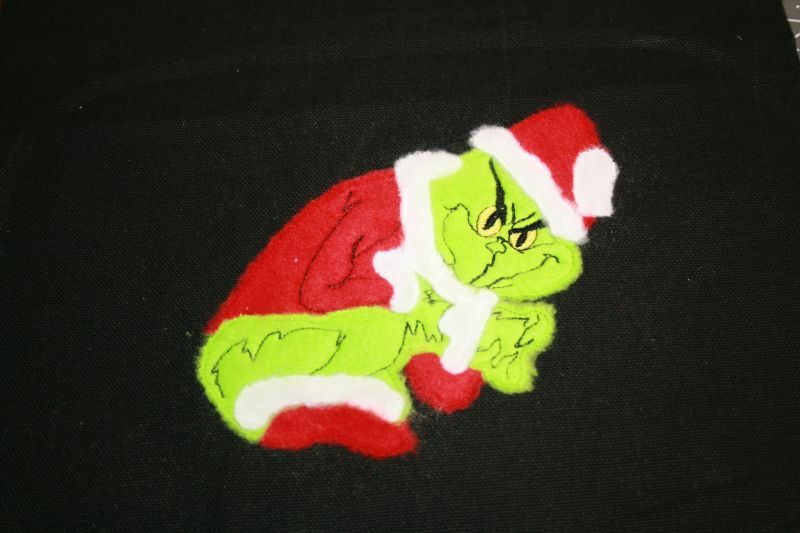 The Grinch was machine embroidered and then glued to the front of the cardboard. Grosgrain ribbon around the edges makes it look like a fireplace insert. A small table was placed behind the fireplace so it would remain stable and I also put a couple of bricks inside of it just in case. Look at all of those embroidered bags hanging on the wall. 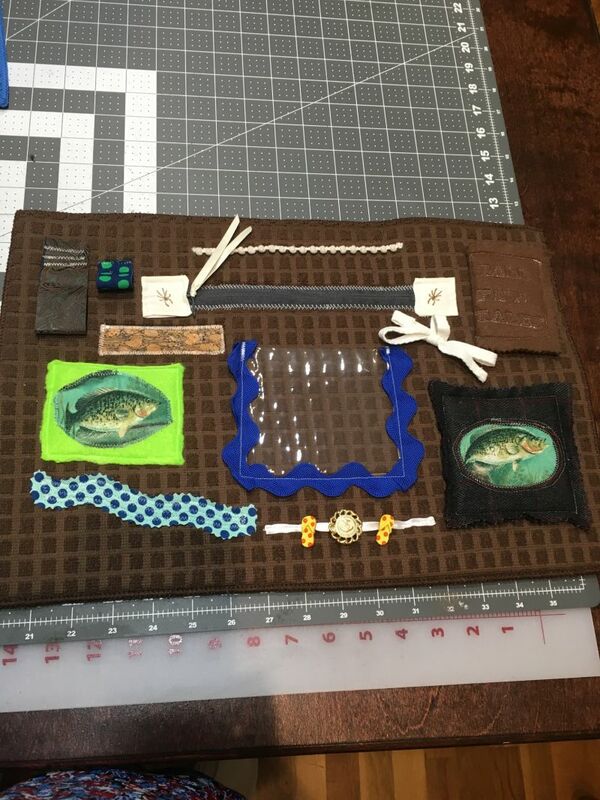 There are also several vinyl projects, caps, tissue holders and my husband's handmade fishing lures. If you would like to see his handy work jump over to Cowboy Tackle. 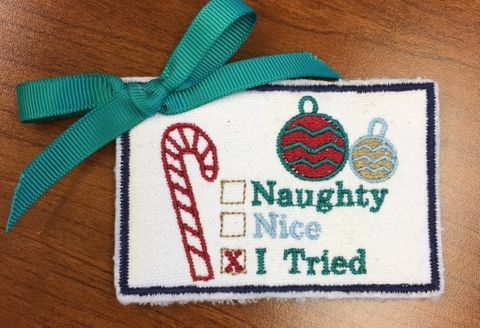 The Grinch is actually an applique project. 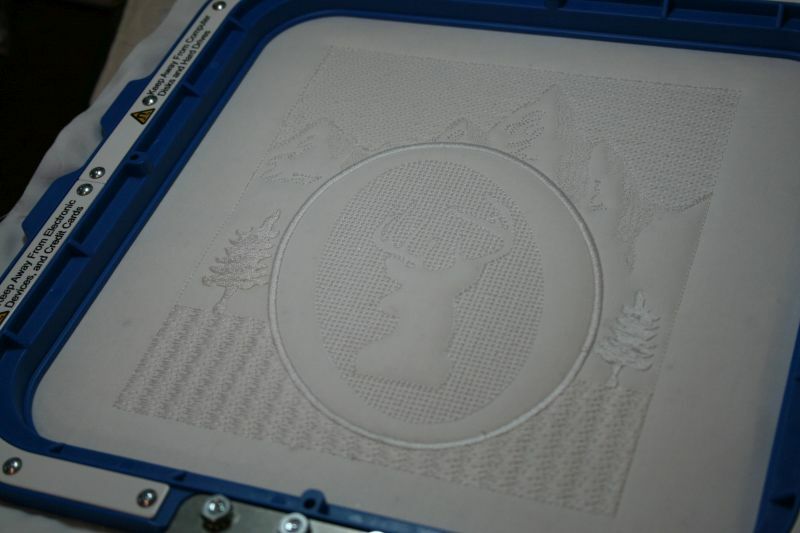 I used my multineedle machine because it has a large 12x12 hoop and I wanted to make it as big as I could. 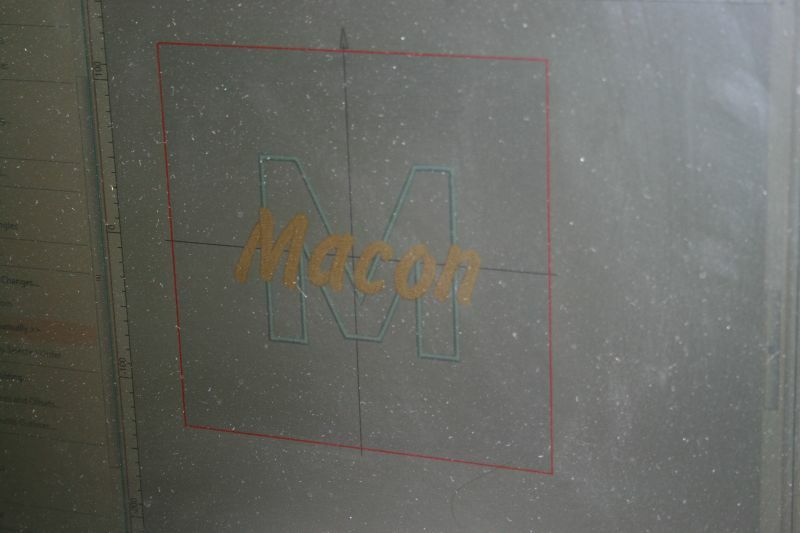 The design was digitized in the Wilcom Hatch program. I love that software so much. Each time I open it up, I learn something new and I am never disappointed. 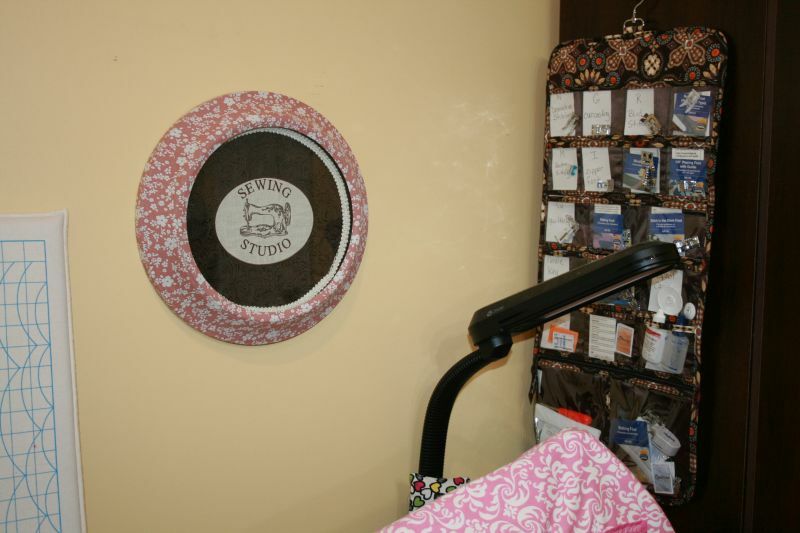 If you would like to try this project, I digitized a smaller version that should fit into most 5x7 hoop sizes. I also have instructions that you can download to follow along with. Since the Grinch is trademarked this design will need to be used for personal projects only. It is very intensive with a lot of trimming but I know someone out there might love to put it on a pillow, purse or even a sweatshirt. The addition of text would be very cute also. I have several different machine file types in the zipped file and I hope you will be able to use one of them. Also check out my You tube video below showing each step. ​I hope you have enjoyed this post, share what you have learned and are generous with what you make. Someone will appreciate your hard work! Joyeux Noel! Patches have kept me pretty busy this year. I have spent the better part of it educating myself on their design and construction. 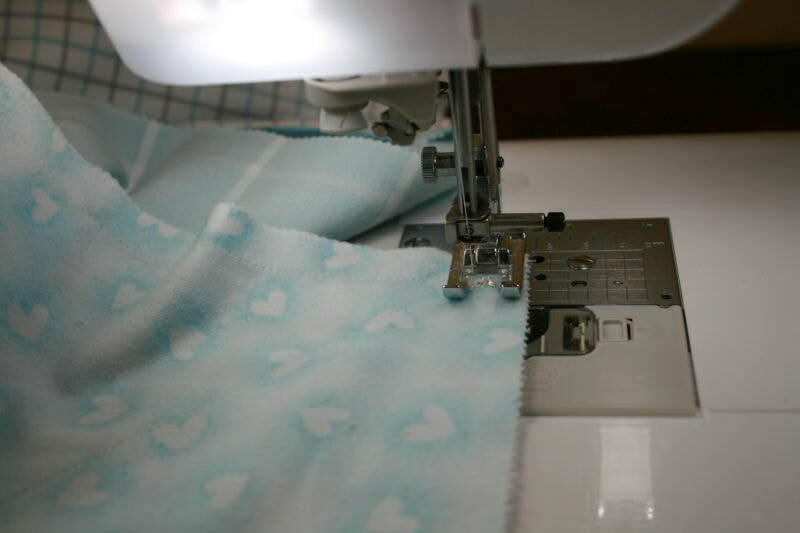 There is a lot of information out there and if you are not interested in sewing or embroidering them yourself, many commercial production houses are available. 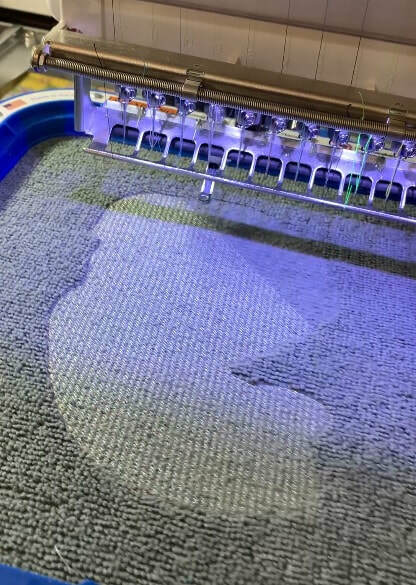 You do have the option of designing the patch and having them assist you in turning your artwork into stitches if you are not familiar with digitizing software. *Note* they will charge you a digitizing fee in addition to producing patches for you. Usually small changes like resizing and stitch out corrections are free. If you make larger changes, they will most likely charge extra fees which is understandable. So go into your collaboration with them once you have a specific design in mind to save time and money. I have used Hatch by Wilcom for all of my digitized designs. After trying several different brands of software, Hatch is by far the one I now use predominantly for all of my design work. My first patch was a re-branding for a local volunteer fire department. They approached me to assist them in creating a patch for their turnout gear. They sent me some original artwork to work from and we tweaked it over a few weeks to come up with the finished patch. I also designed some alternate color combinations since they have different ranks in the department. The colors would help distinguish that. The gray and orange was the main patch and here is a gray subdued patch the officers chose. 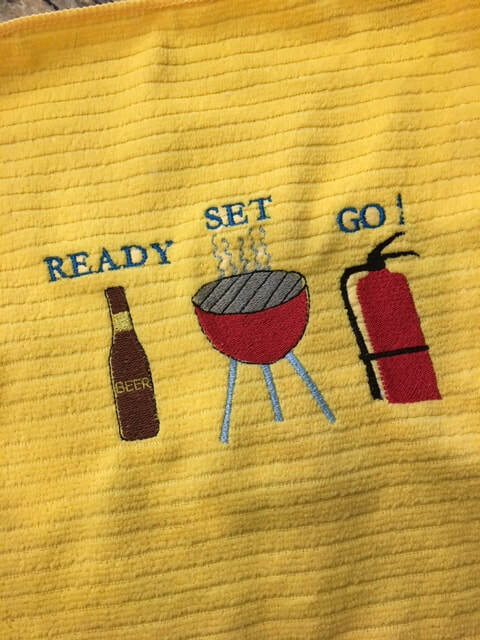 I will advise you that if you are going to work with a fire department, you will need to research their equipment before you sew anything on them. 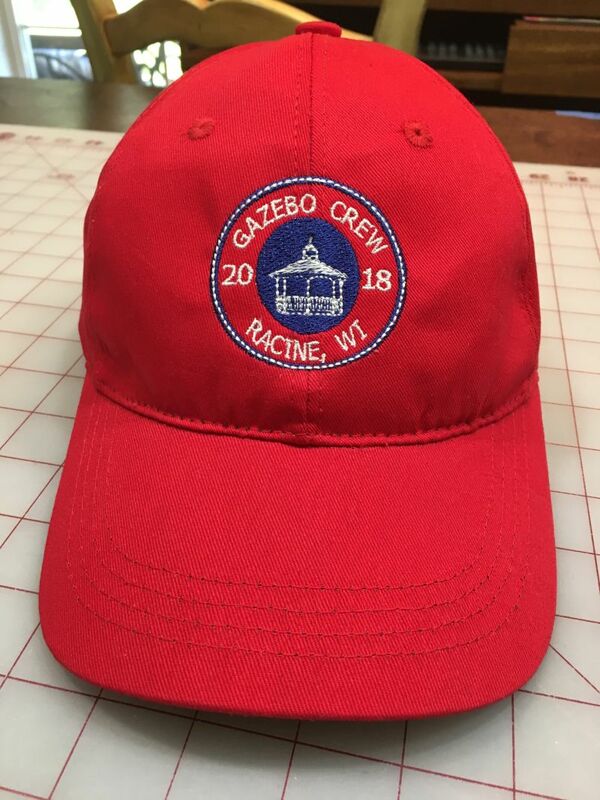 Although they originally requested the patches for their turnout gear, we ultimately sewed the designs on caps and polo shirts for them because the gear needs to be fire rated including anything that is attached to it. There are fire resistant patch materials and threads that need to be used for that purpose. Also, there is a warranty that comes from the manufacturer of that gear and it can be voided if someone alters it who is not authorized by that manufacturer. So it is best to go through a company that does that as part of their regular services. These companies clean and inspect that turnout gear also to ensure the firemen are safe while going through their duties. 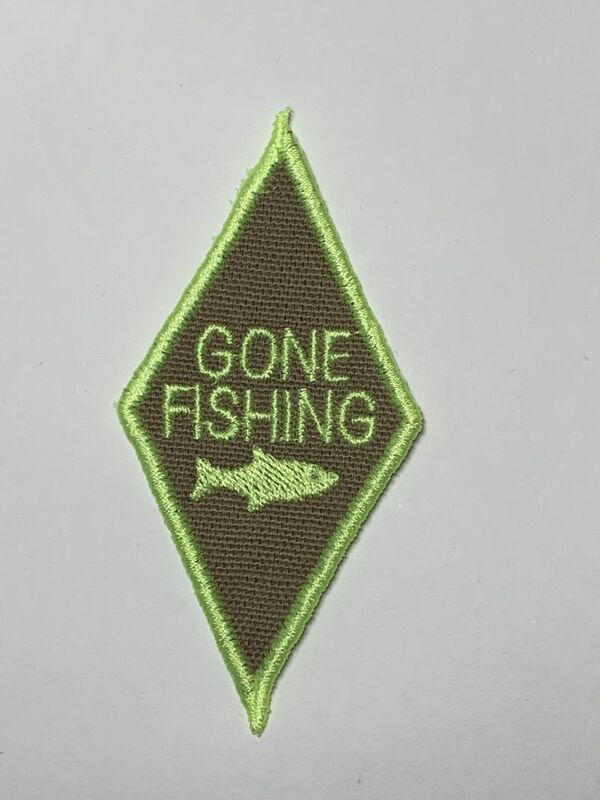 You could still design the patch for them and have a production house sew it out for you then contract to have the fire rated patches sewn on. 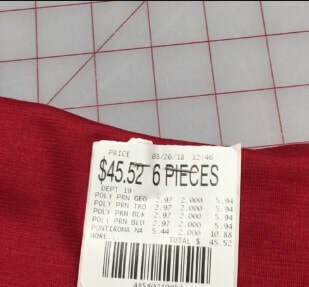 Just be very careful in altering any of their gear without first speaking to the manufacturer and make sure you use the fire rated materials or advise whoever is producing those patches for you to do so. In this case, the caps and shirts were a great way to help the department update their look. Another re-branding I worked on was for a local grocery store. Earlier this year, our area was hit very hard with tornadoes. This grocery store was forced to close for several months while re building. While their store was being brought back to life, I helped them come up with a new logo and then tried a few designs for patches on shirts. I also worked on adding a vinyl application to T Shirts for their employees because they wanted something a little more casual. An extra "Lagniappe" bonus was this little headband for their daughter to wear for the Grand Reopening. Too cute. 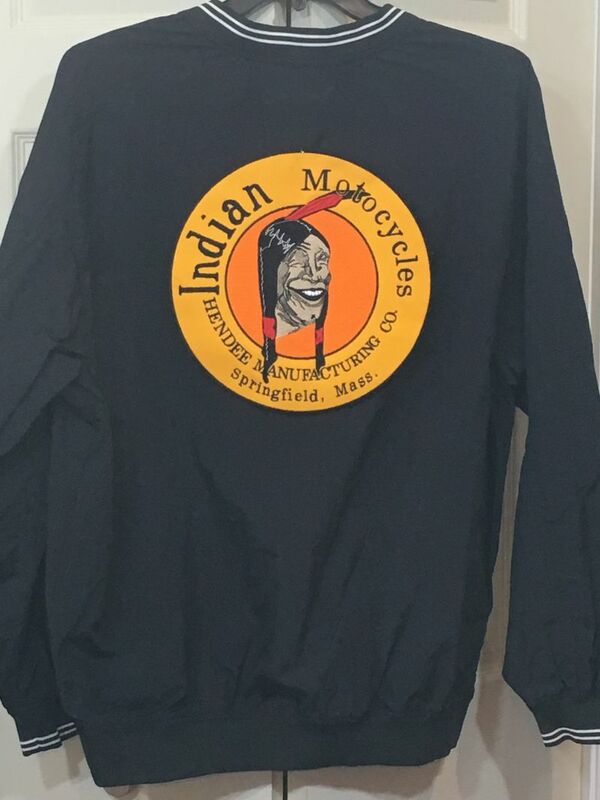 Motorcycle groups are usually great admirers of patches and many collect them at every event or dealership they ride to. I worked with a small group to design a custom patch for a ride to Racine Wisconsin. They were attending an event and wanted to commemorate it. Although I didn't have any artwork for this design, I did have specific colors they wanted. I worked on the design and once they approved it went into full blown production. 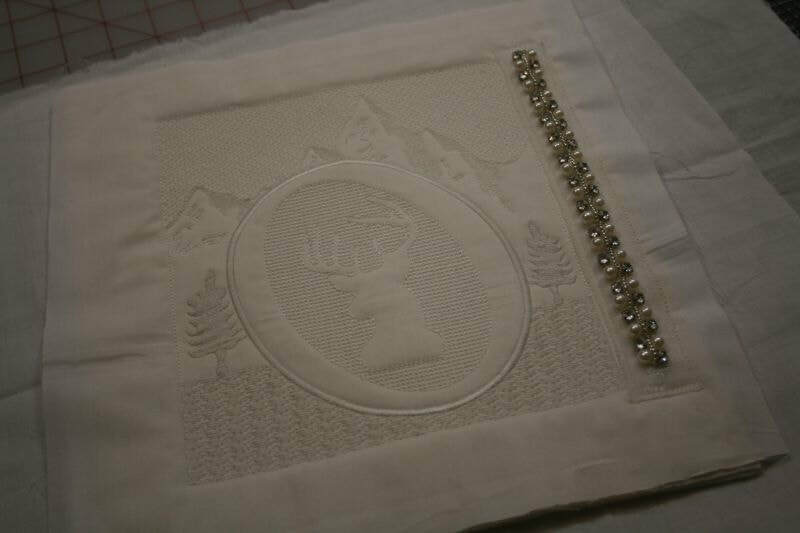 I have played around with several different border design thicknesses as well as backings while embroidering patches. For me I found that on a free standing patch, going at least 3mm wide on the border helps to fully cover the edges of the material. You can go wider than that depending on the look you want to have. I tried both a mesh washaway stabilizer backing and a heavy duty plastic washaway. Both worked really well. Also, I found that stitching the design first, trimming away the excess material, re-hooping and then doing the border works quite well. It is a little more labor intensive but makes beautiful patches. 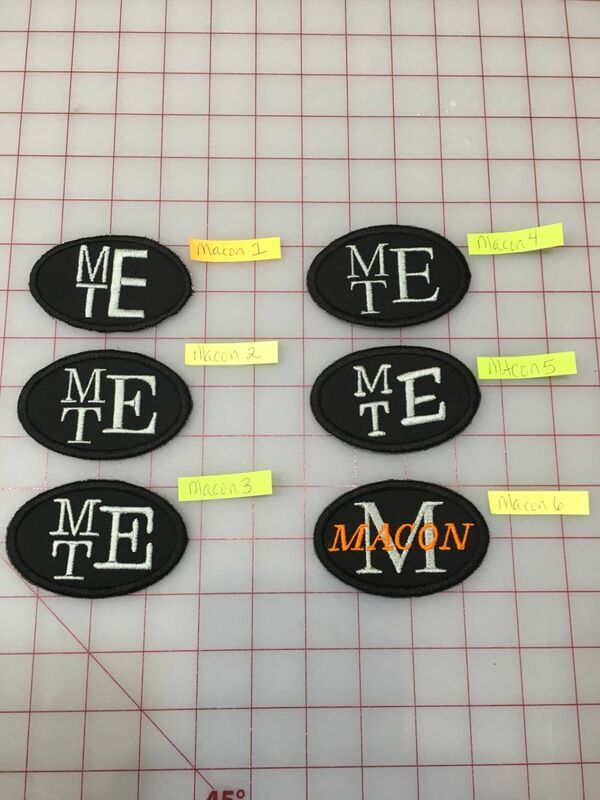 In production houses, they use huge metal dies to cut the patches out after stitching and then they use merrowing machines to individually sew each patch border. 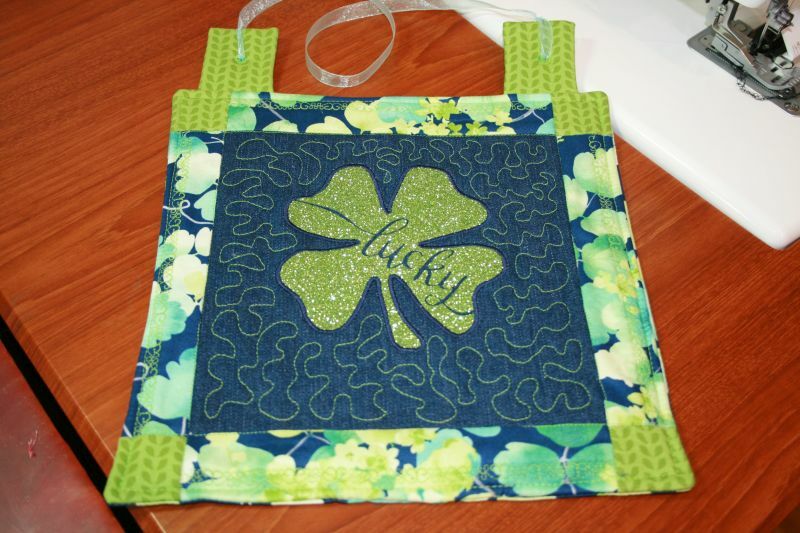 The trick in using an embroidery machine is to mimic that merrowed edge. The next time you purchase a patch, please know that although small, there is a lot of love that goes into each one. Some of my designs also worked well to stitch completely with a single hooping if there was not a lot of dense stitching in the design. 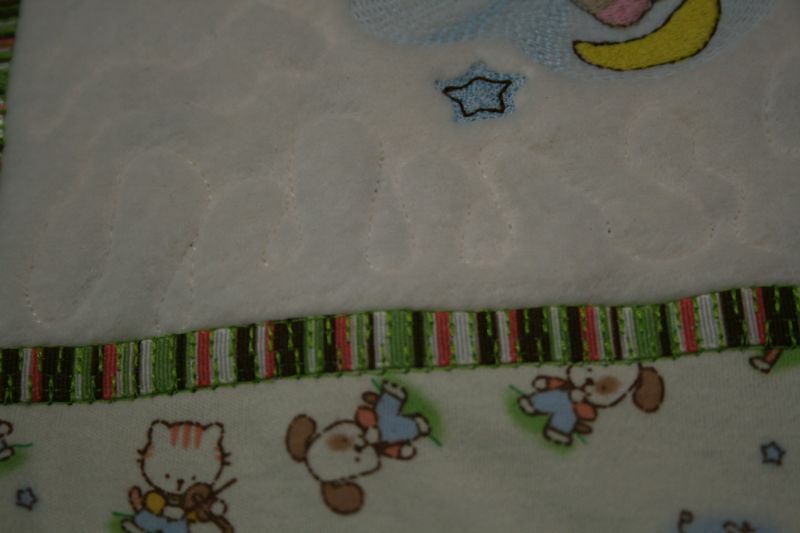 If there were too many stitches, by the time the border sewed out, the entire patch would be torn away defeating the purpose of the stabilizer. So the registration would be off on the design. You will want to do some trial and error with your designs if you want to try and get a complete patch sewn out in one hooping. This design came to me from one of the motorcycle riders who is also a family member. 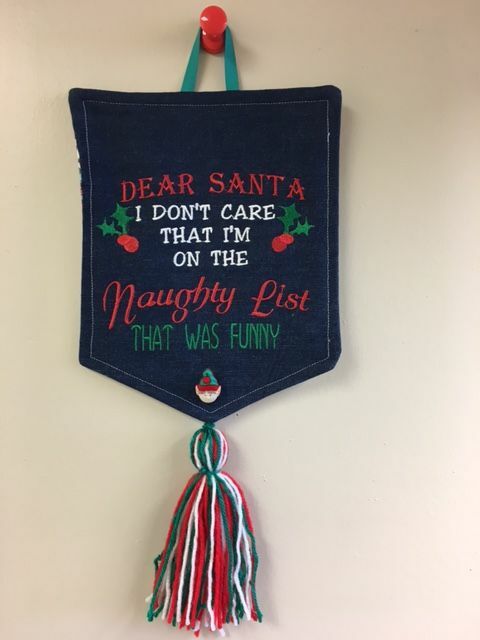 They wanted to give this patch for Christmas. I worked on the design and it is probably the one I am am most proud of. 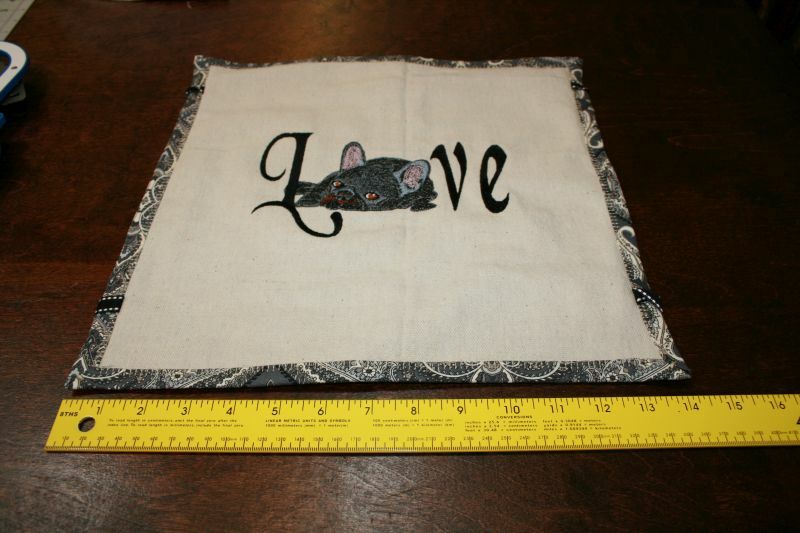 I made the patch as big as my largest hoop would sew out so it is about 10 3/4 inches wide. Just for informational purposes, this patch takes about 1.5 hours to stitch out because of the size. It is about 50 % to 60 % covered in stitches. 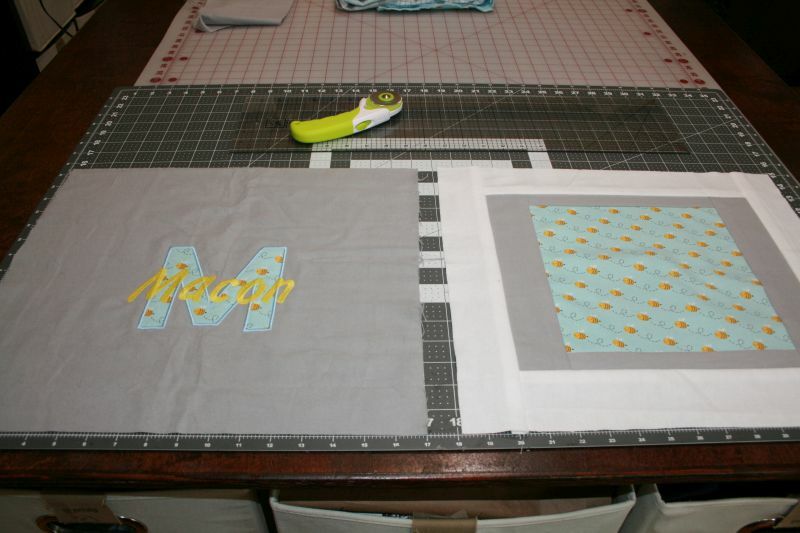 The yellow background is actually fabric so that cuts down on the stitch time. So if you are thinking about producing patches as a profession and have a single head machine, each one will be time consuming even if you gang them up in one hooping. 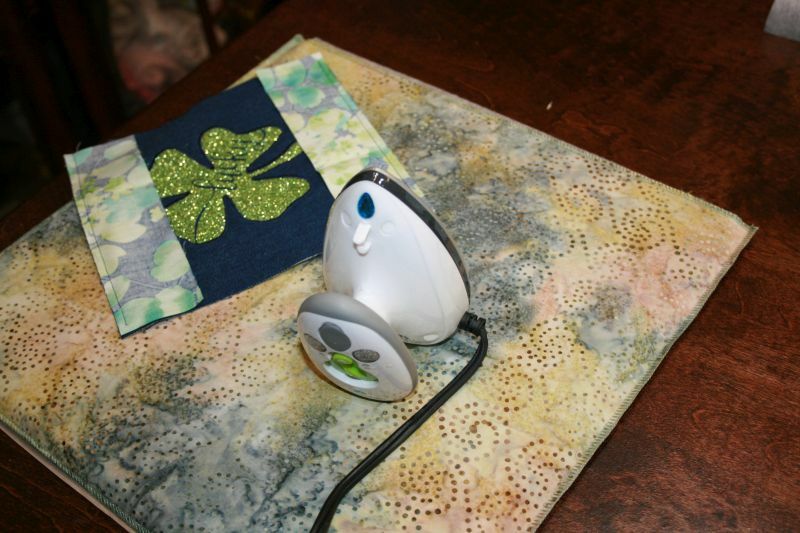 You may want to invest in either several machines or a multi head once you get up and going.The background fabric is a duck material which I have found is really great for patches. 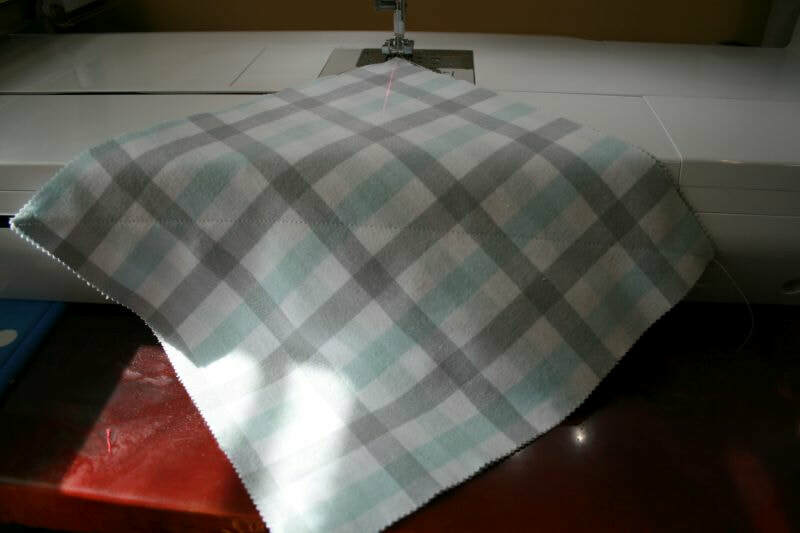 The cross weave is dense enough to hold all of the stitches and keep it's shape. It is also washable so depending on what they sew it on they should be able to launder. 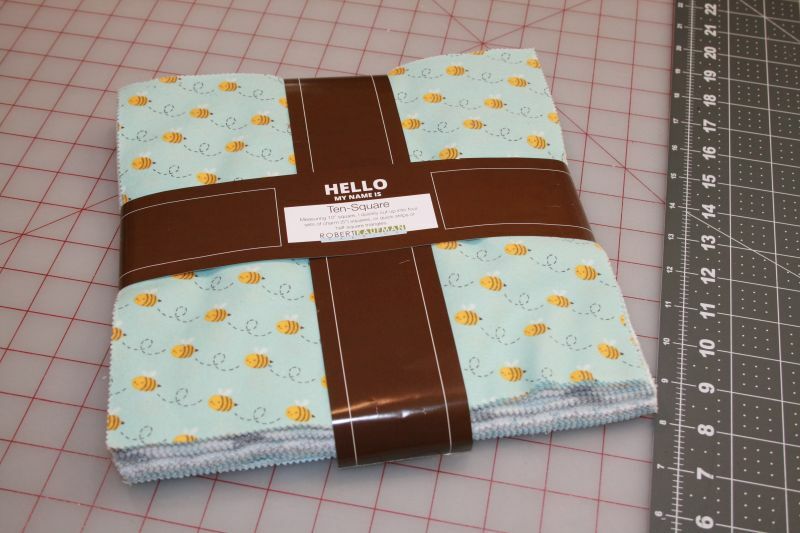 Another fabric on the market is called "twilly". It is similar to the duck fabric but has a diagonal twill weave with a ironed on backing that keeps the patch material stable while stitching. I have tried it also and it works well also but has a lighter feel than the duck. Felt is another fabric that many patches are made of. 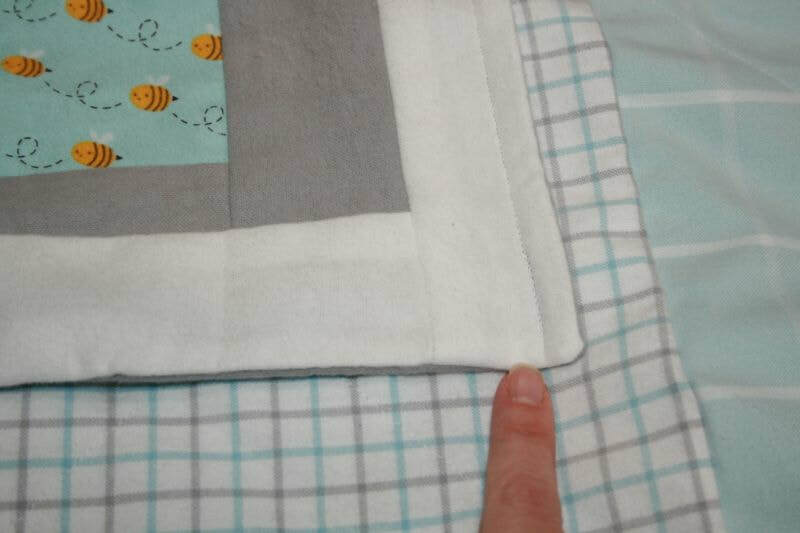 If you look in stores notice the edges are not always sewn with a border because the felt does not ravel. 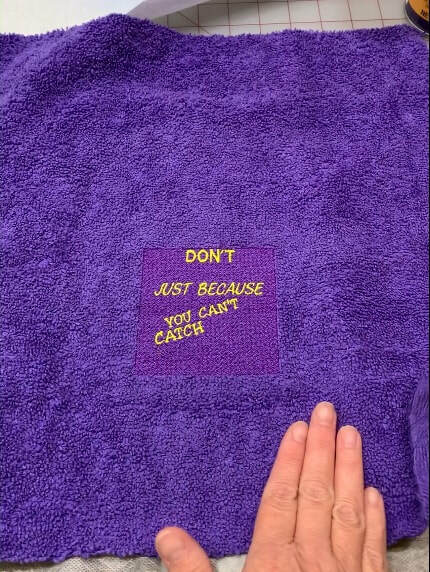 If using this material I would advise you to preshrink the felt before you stitch on it so your finished product can be laundered and it does not degrade your design with shrinkage or twisting. 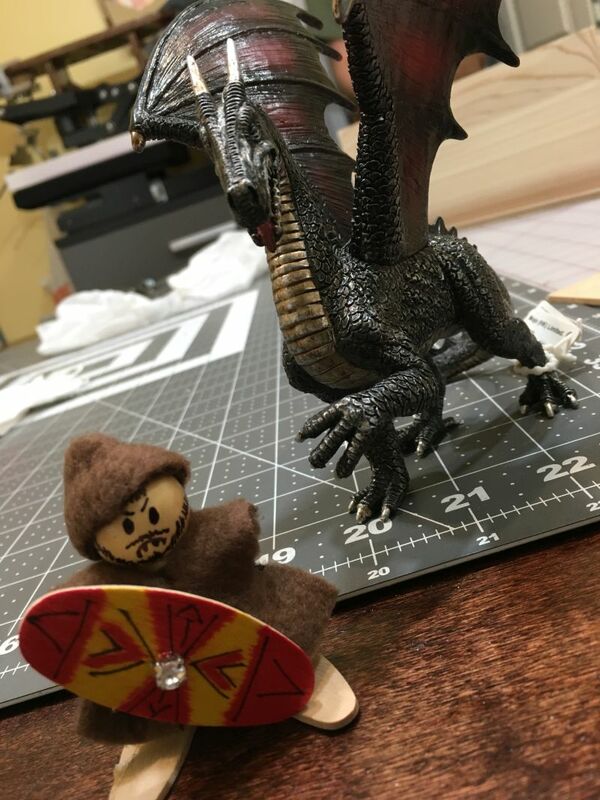 If you purchase felt from a hobby shop, you can't always determine the materials. 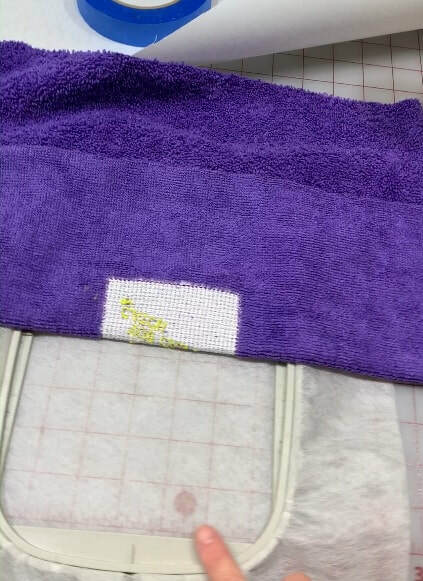 A good practice would be to also stitch out a test patch and run it through your laundry just to see how it performs. 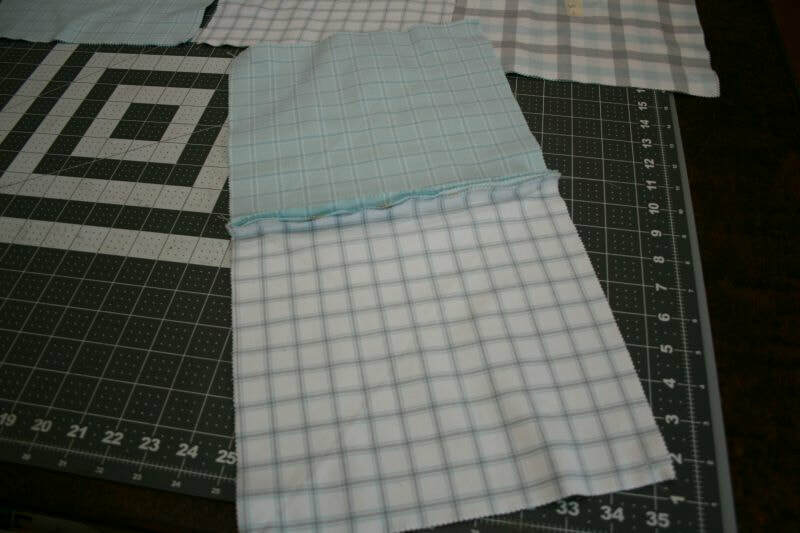 This will help research any probable issues and it is fun to experiment with different fabrics and techniques. Here it is on a jacket back. I think it looks really nice and that yellow color is just beautiful. If you do any designs like this one, be careful of any copyright issues or trademark infringements before designing and selling. 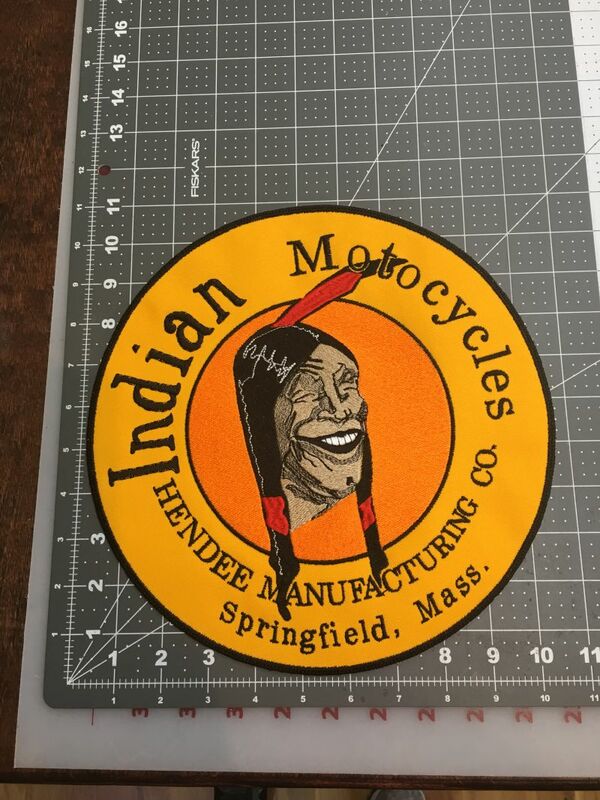 When I digitized this patch, I did some research on the "Laughing Indian" just in case. I know the person I did the patch for is giving it as a gift and will not be reselling so I felt safe in using the original design for them. You could also get permission from the original artist if they are available to ask. A great place to research is the US Patent Office. You can search by keywords and see if something has been registered or even expired. There is usually information on who applied for the trademark which may make it easier for you to contact them. Not all designs are registered but still have trademark rights so keep that in mind also. 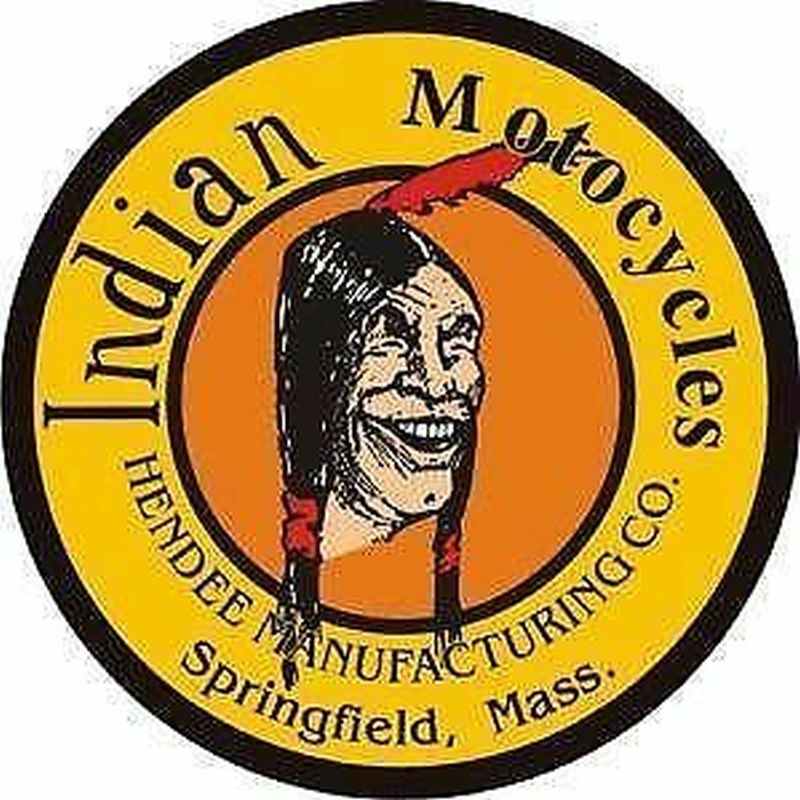 Pretty interesting to read through the Patent site and with this design I would make contact with the Indian Motorcycle Manufacturer or Polaris if I wanted to make several of them to sell instead of one for a family member.. Here are just a few other original designs I am working on myself. Once you get started, it is kind of addictive with patches. Each one gives you the opportunity for a small piece of artwork. Then knowing that someone will think it's good enough to wear makes it really satisfying. Other advice I might tell you is to research whether you will need any kind of adhesives on the patch backs. 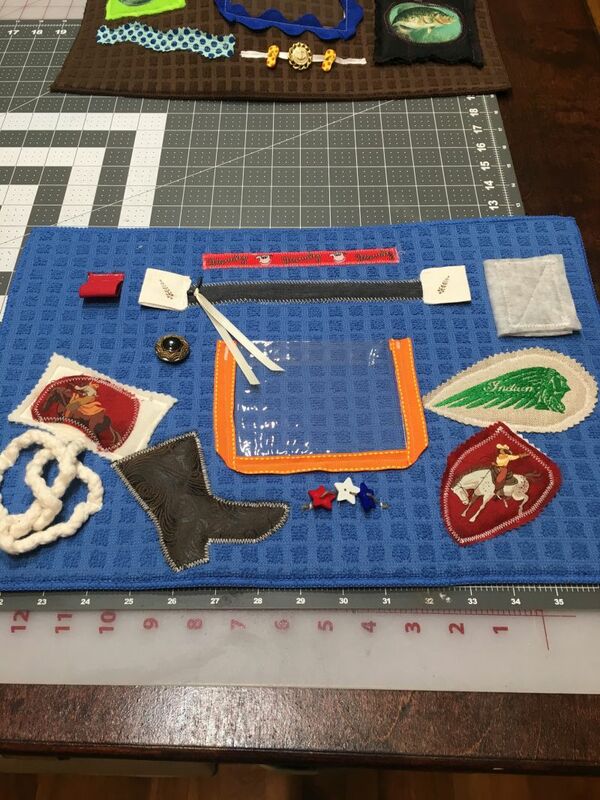 All of the ones I have constructed were going to be sewn directly on garments or caps. 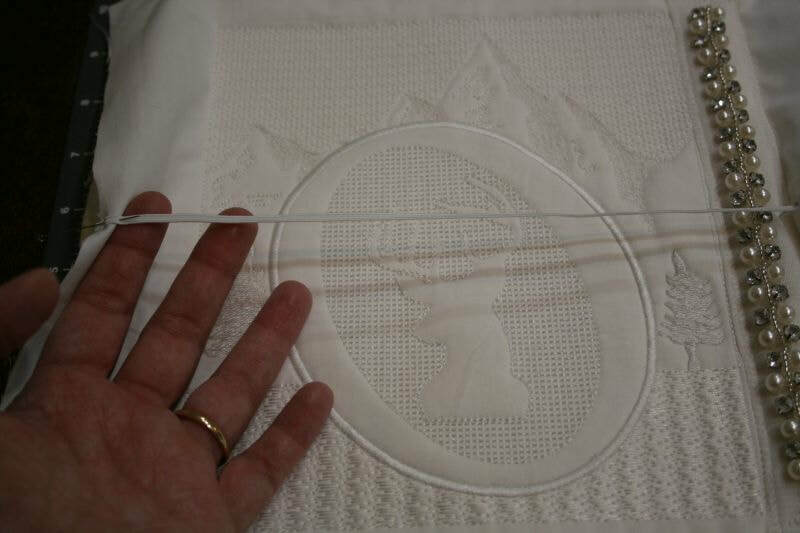 There are many different ways to adhere the patches with irons or heat presses. 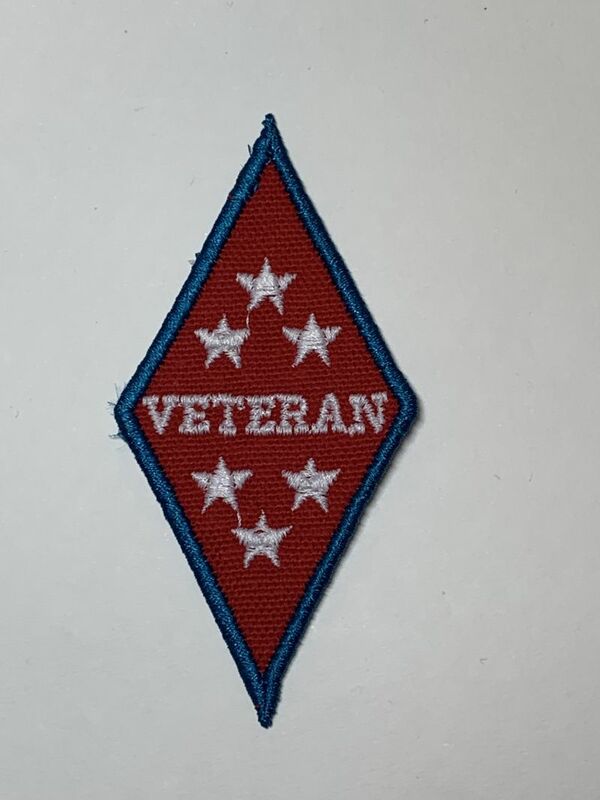 You will want to ask about that if designing patches for someone because there are adhesives that are not meant to be sewed through. 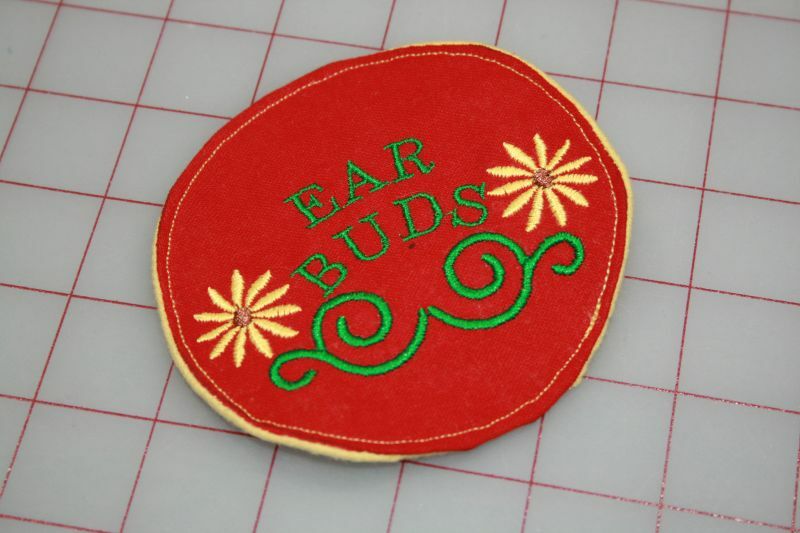 If you have a difficult item that can't be hooped and embroidered but can be ironed, a patch might be an alternative. I hope you have enjoyed this post, share what you have learned and are generous with what you make. Someone will appreciate your hard work. 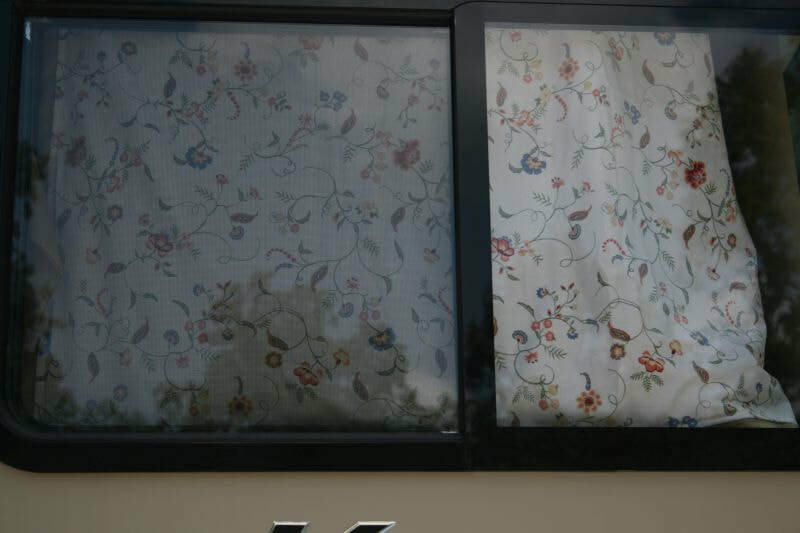 We took a trip recently in our motorhome and noticed that the lining was beginning to tear on the privacy curtains. 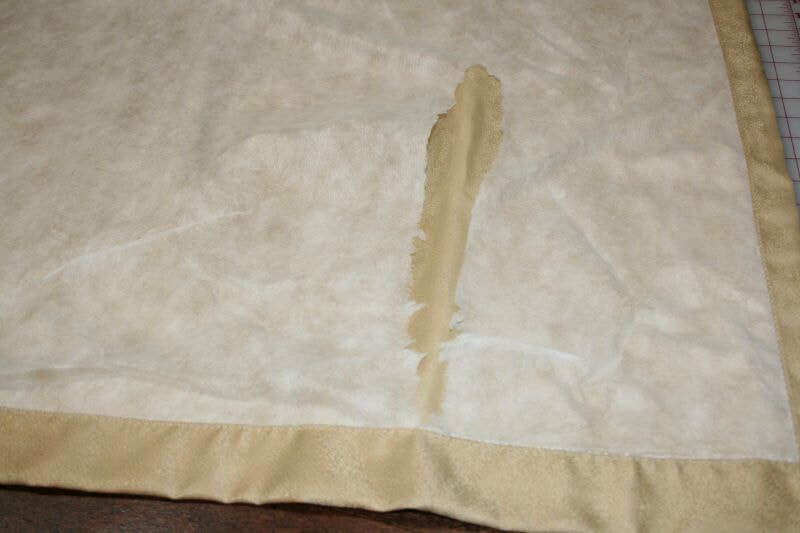 I had never really looked at the quality of the curtains, but the material used for the lining is actually not very sturdy. This wouldn't be a problem except the tears are very visible when you close the curtains and if you have ever stayed in an RV park, you know people like to walk at night and see each other's rigs. So this needed to be fixed or I knew it would bother me while on the road. Once the curtains were taken down, I was able to see how difficult it would be to make the repairs. I really didn't want to take the entire seams apart. Here you can see the corner and when you look at them from the front, they are actually put together with what looks like a blind seam. 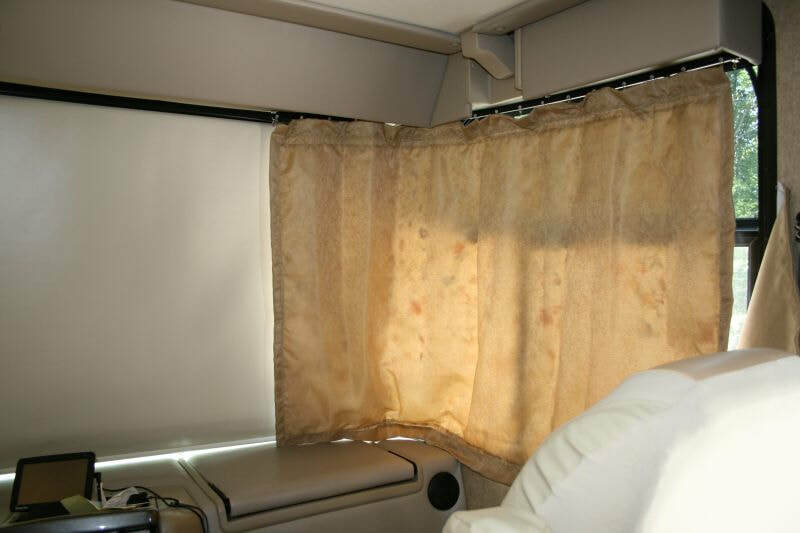 In addition to the inferior lining material and the blind hems, there is a trim that is used to hang the curtains. I didn't want to disturb this either. 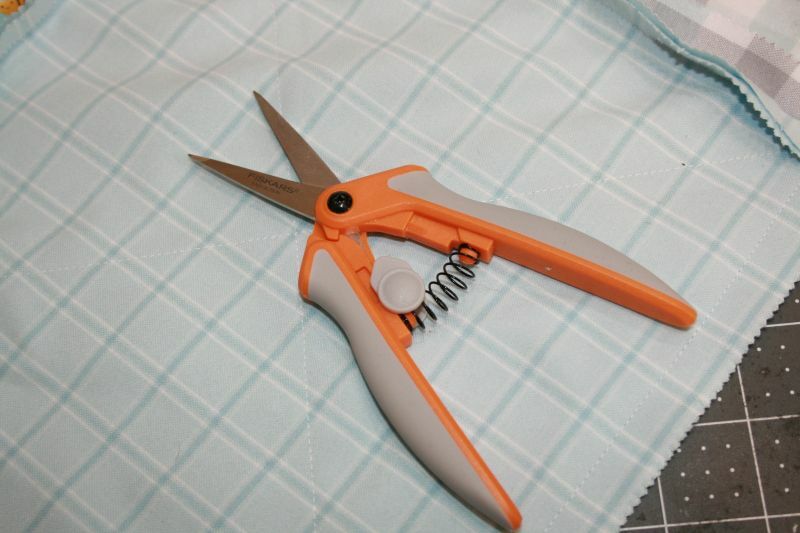 Looking at all of the materials, I was worried that using any kind of seam ripper might damage the curtains. I went through my stash and found a brand new set of twin sheets that I purchased at my local thrift store. 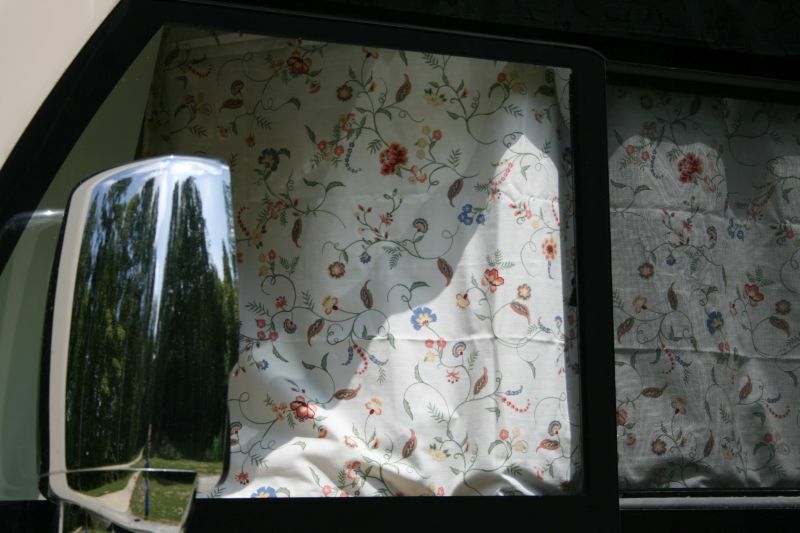 The curtains were 54 inches by 36 inches each, so I would have more than enough fabric using the flat twin sheet. 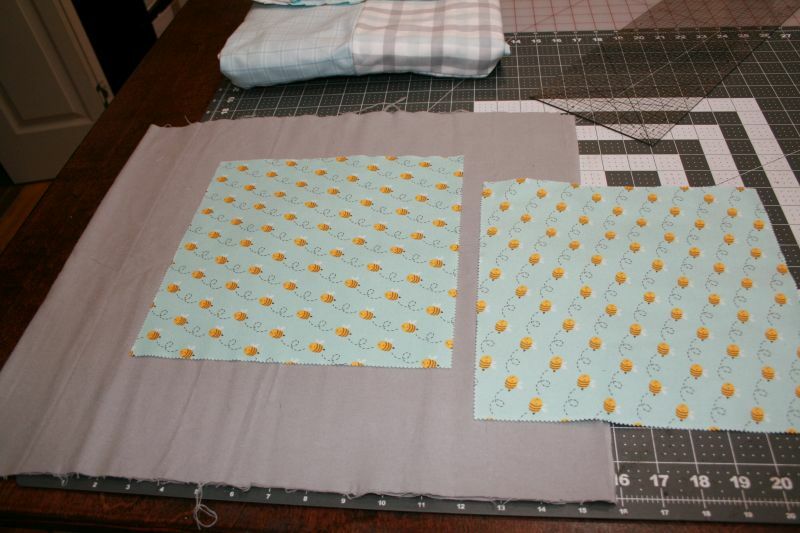 After taking my measurements, I cut the curtains one inch wider all the way around. I will tell you that there was a slight curve to the curtains on the sides so if you do a project like this, give yourself some extra fabric. 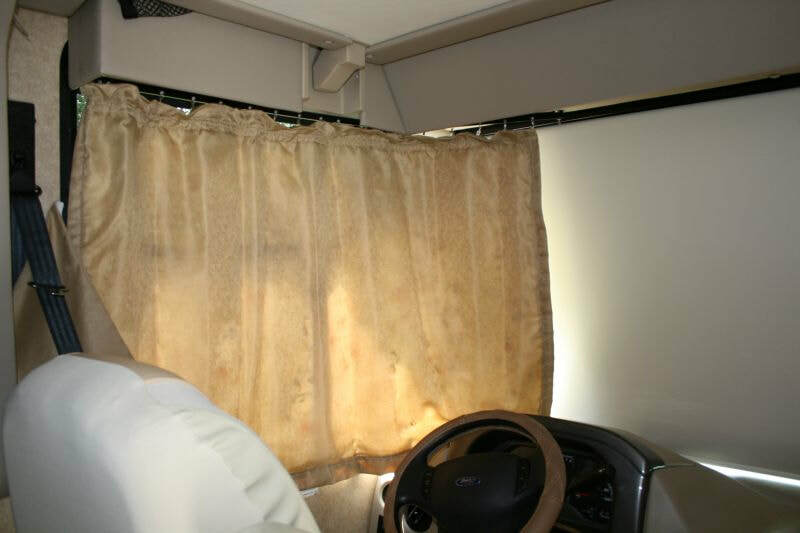 The travel of the curtains on the sliding system in our motorhome does curve so I expect this variance helps them hang better. 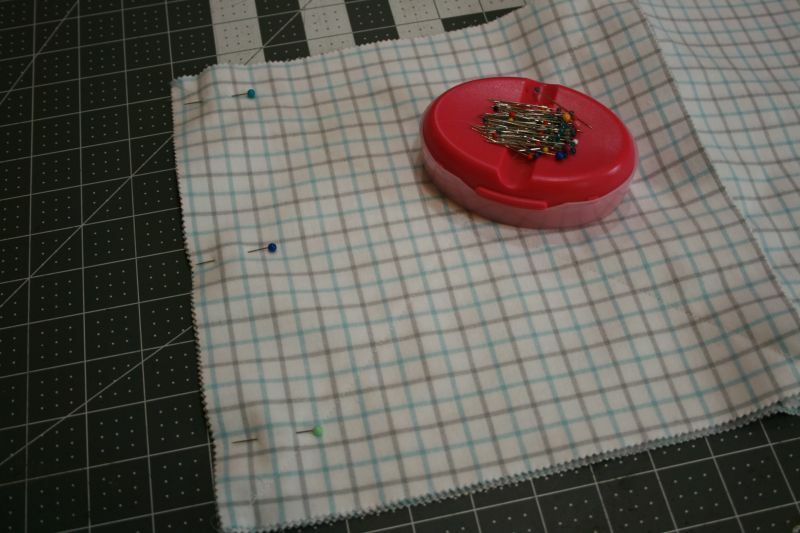 You can always trim a little bit or take up your seams as you pin. 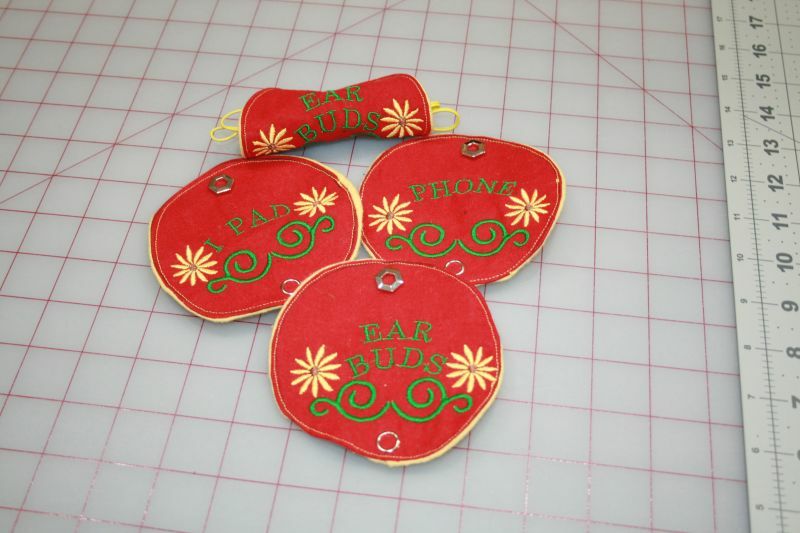 I used my iron and seam press tool to do two 1/2 inch turns on all of the sides. I pinned them well and then laid the sheet and the curtain wrong sides together because once sewn, the right side is what you will see when the curtains are closed. 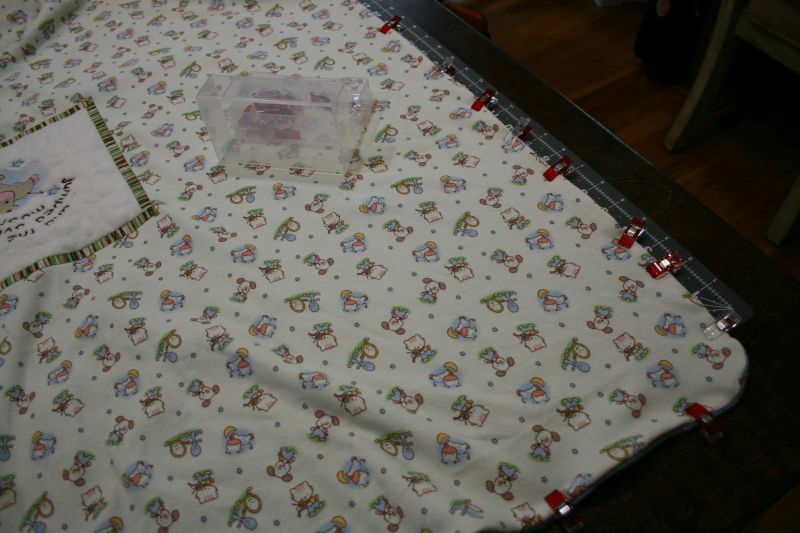 I worked around the curtains taking the pins from the ironed hem and transferring them to the curtains. You can see that I butted the lining right against the hemmed areas of the curtains. This also allowed me to adjust that ironed hem as I went around the perimeter. 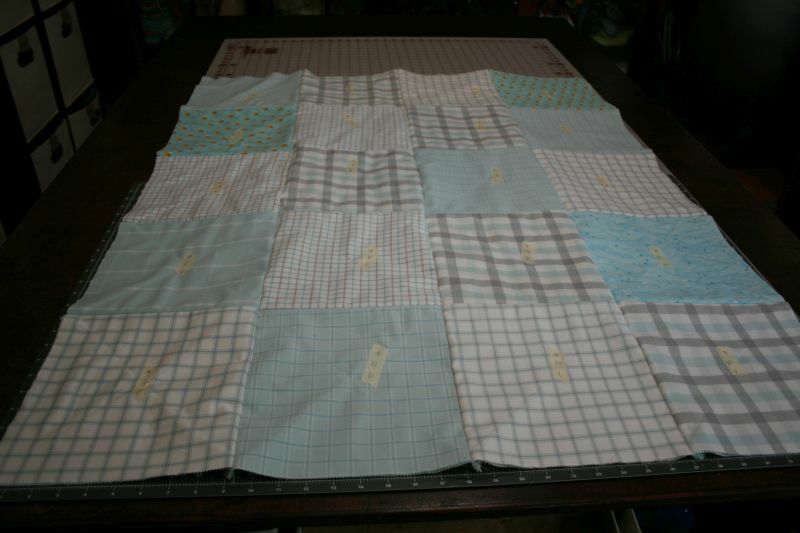 Here is a view of the lining pinned and ready to sew. I knew that the seams were going to be visible unlike the existing blind hems. 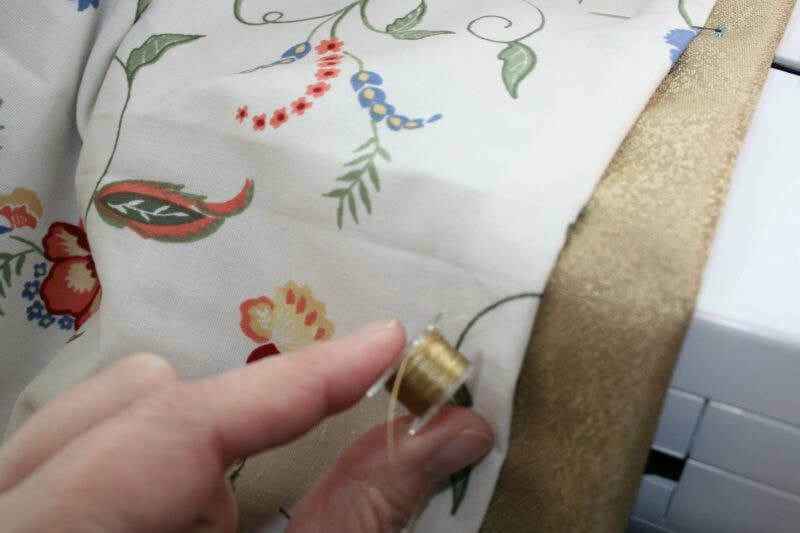 An easy way to help hide them was by using a bobbin thread that matched the curtains. 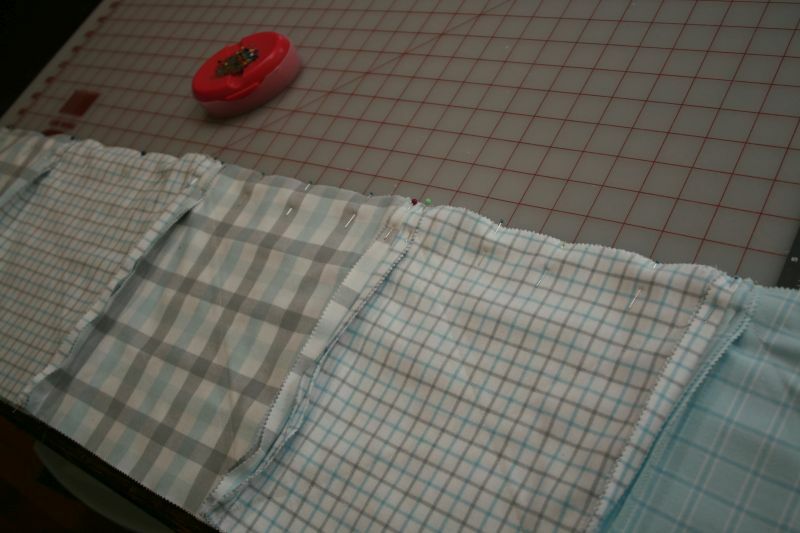 This way I could sew from the lining side and watch my seams, as well as hide the bottom thread as much as possible. 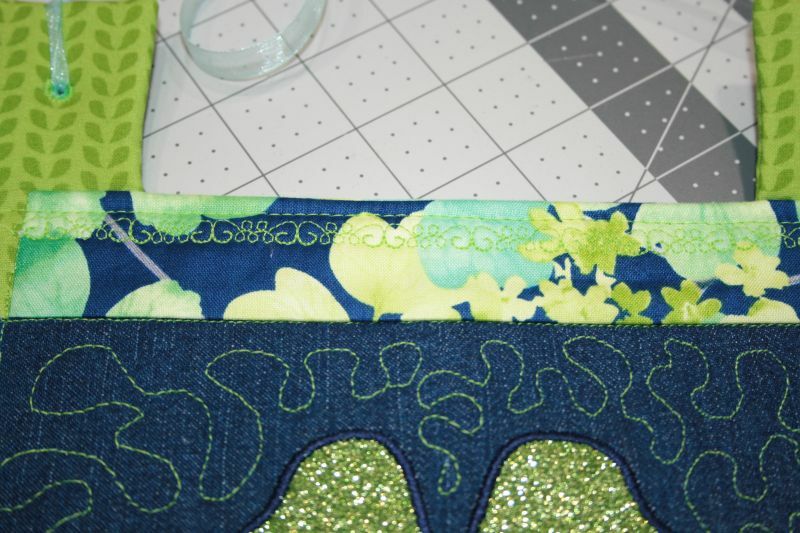 Here is a picture of the seam once completed. As you can see the bobbin thread matches the curtain material and unless you knew to look for it, the new lining fits well. 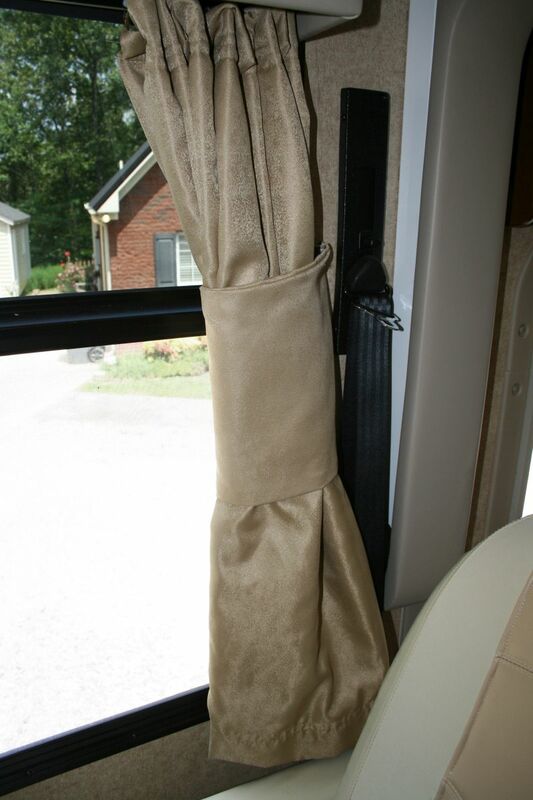 Here is a picture of one of the curtains hung in the motorhome and drawn. Here is the other side. They hang just the same as they did before. The only exception is a slight pattern because of my fabric choice. Here is a view of them from the outside. Now instead of torn linings, passersby will see beautiful fabric. 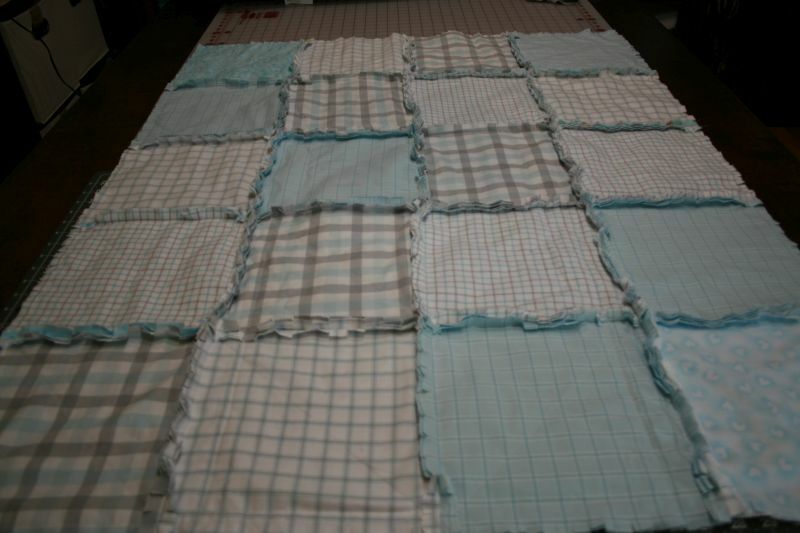 I am going to also estimate that the weight of the sheet will help insulate much better than the factory material. Here is one if the curtains pulled back. 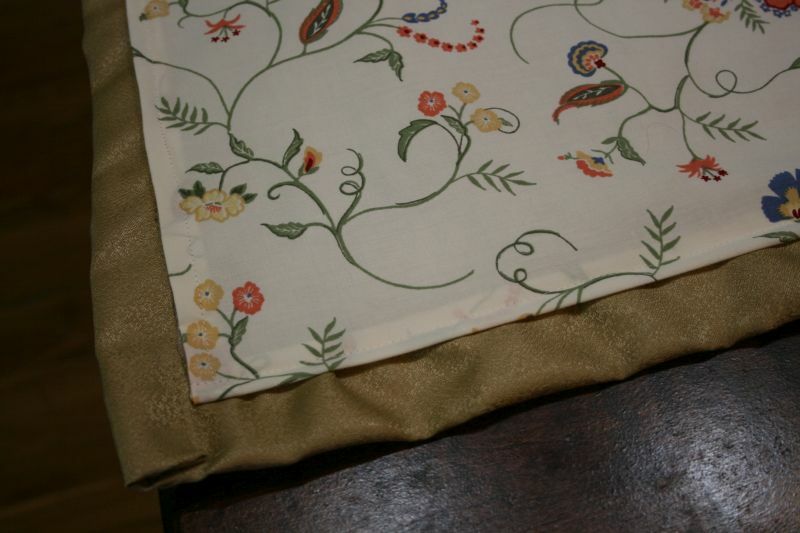 As you can see, the fabric lining doesn't impede the tieback or make it look bunched up at all. So privacy has been restored. Now all we need is a road trip! I hope you have enjoyed this post, share what you have learned and are generous with what you make. Someone will appreciate your hard work! I have been working with my digitizing software this week working on some new techniques and I am so proud of how they turned out. I wanted to try my hand at Trapunto quilting on my embroidery machine. Most of the Trapunto work I have seen is done mainly with White fabric or some type of Satin so you can see the negative space clearly on the fabric. 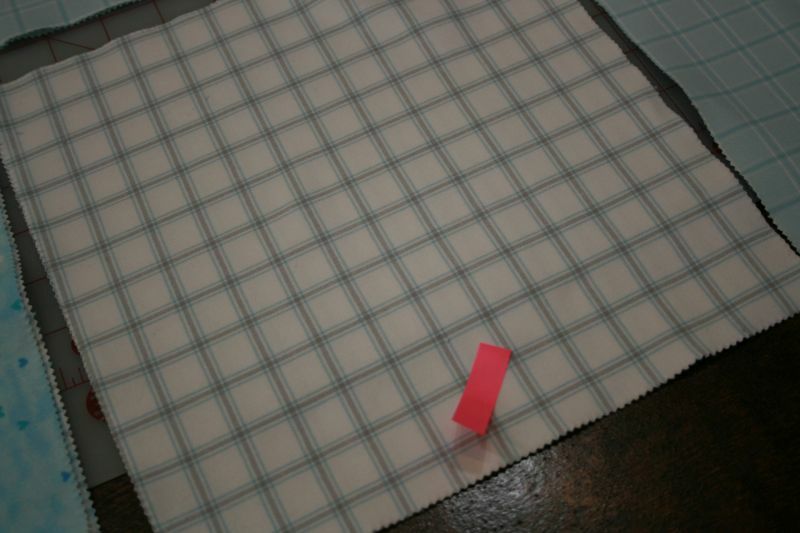 An extra layer of batting is used to make those areas very puffy. 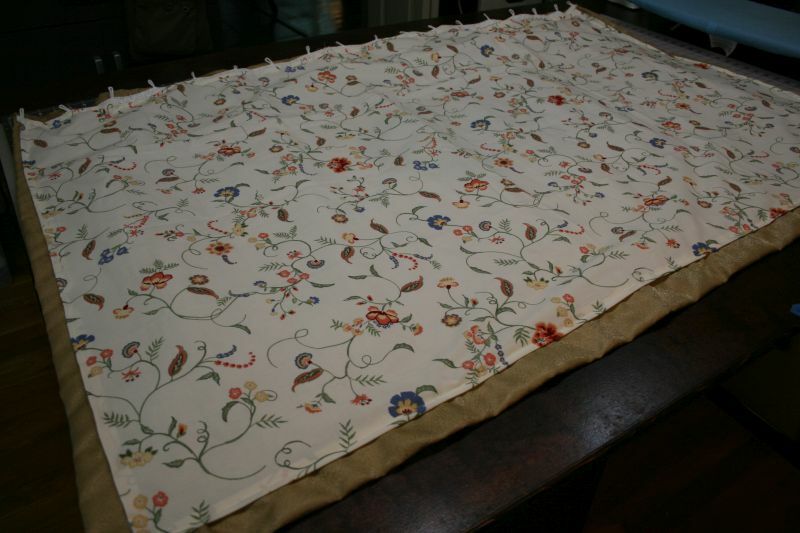 Here is the work on my machine just after it has stitched out. Inspiration to design and sew for me more often than not happens one step at a time. I usually keep quite a stock of materials in my stash so I can work when I get an idea. That is what happened here. I wanted to do a design that leaned more toward a masculine feel. 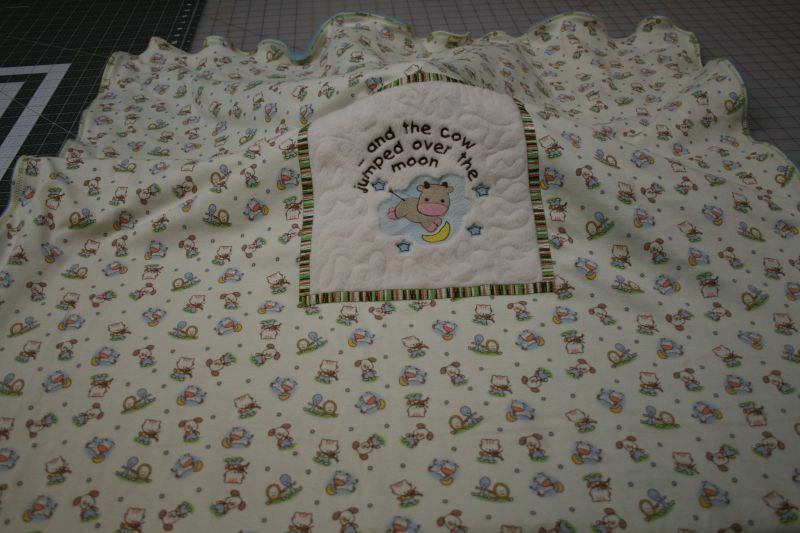 Once it was embroidered, the white fabric was contrary to the design and I love it. I also challenged myself to use some of the trims I found in one of my fabric grab bags. Here you see just using a little bit makes all the difference. Layering is a wonderful trick and even in a small area it can make your work look luxurious. 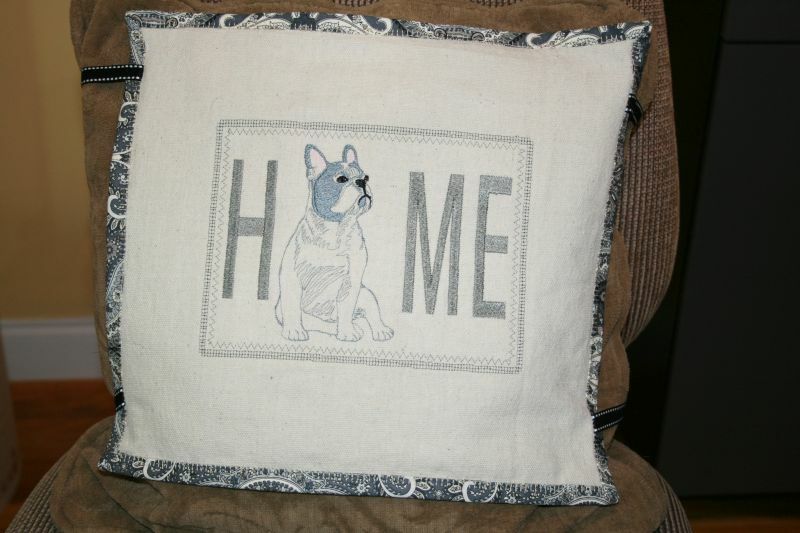 So by now in this project I had pretty much decided to make a pillow, but not just any throw pillow. 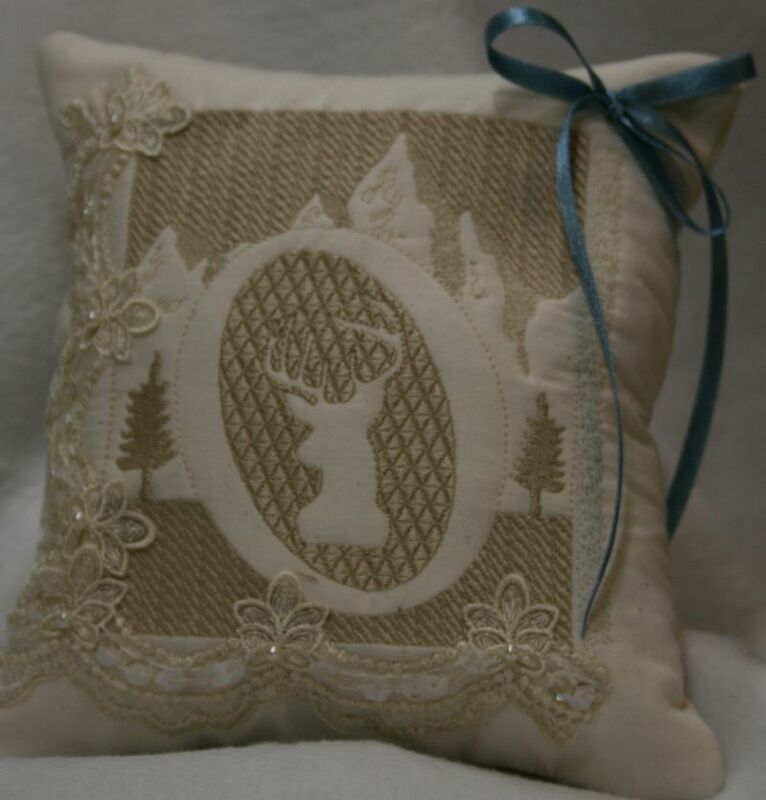 I thought a ring bearer pillow with a woodland theme would be very unique. 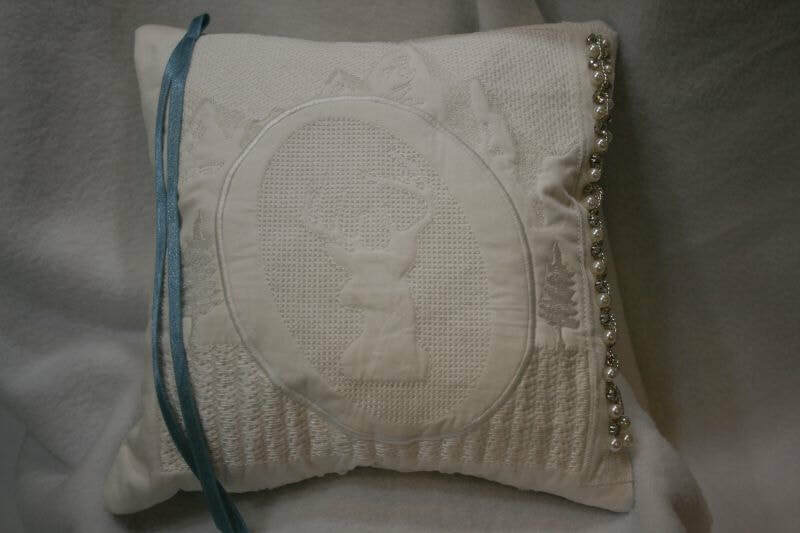 Most of these little pillows are silky satin material with lace and wind up in a hope chest after a ceremony. I wanted to make something that would be loved by the wedding couple and hopefully used after the vows in their home. The addition of elastic will make it easier for the item to be held and not dropped by the ringbearer. Here is a view of the finished back. I love that it is cotton batiste. The additional batting really makes it feel substantial. 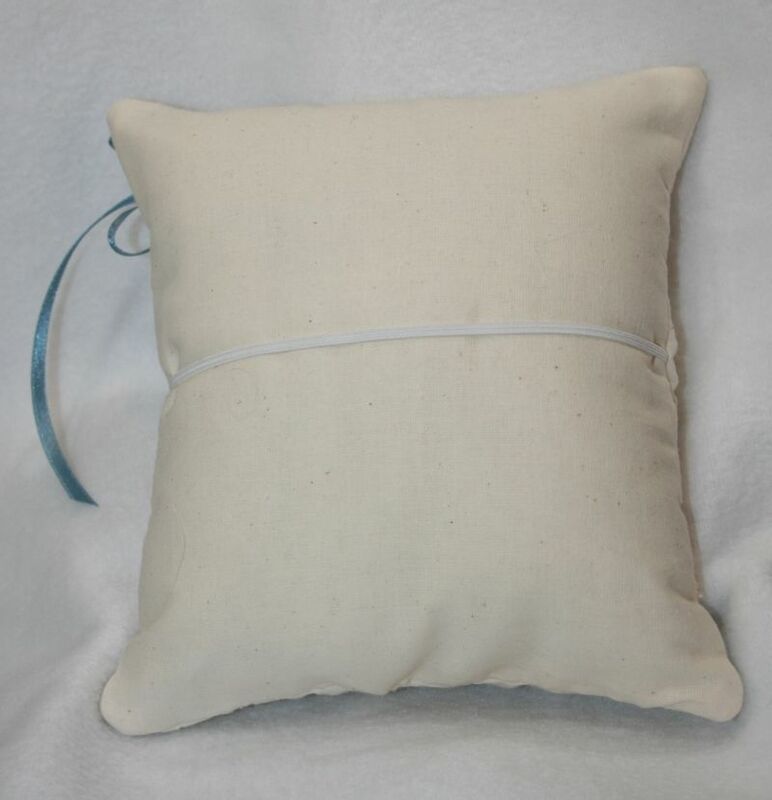 Of course the white color is traditional and very pretty but I wanted to see what another pillow would look like in a more vintage color scheme. 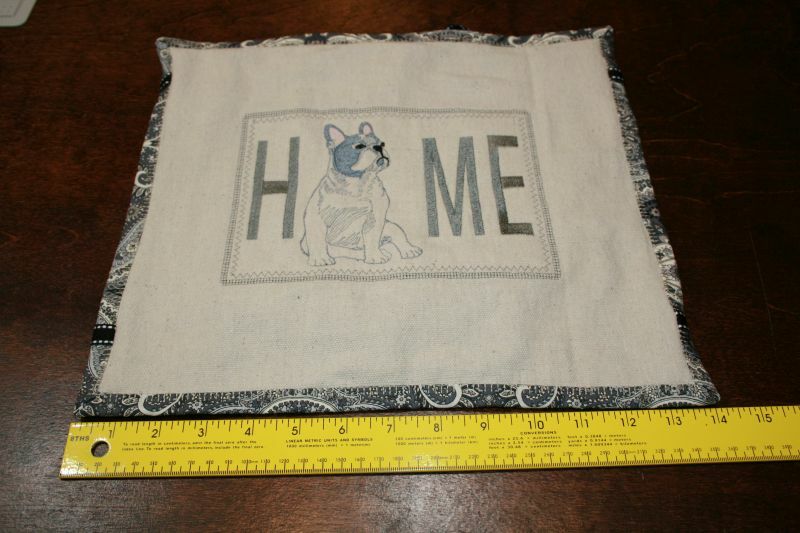 This one has a similar design with more detail stitching and a different trim. 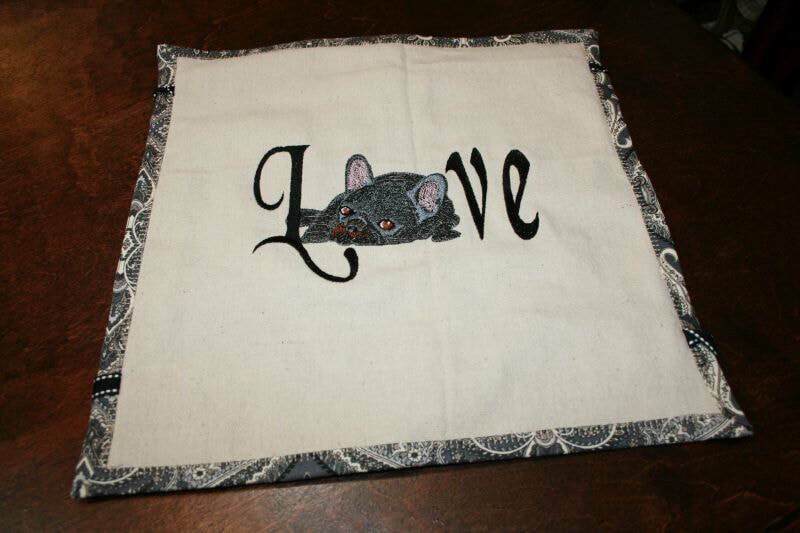 It is also a little smaller than the first pillow but with the addition of the extra embroidery, it still makes a statement. 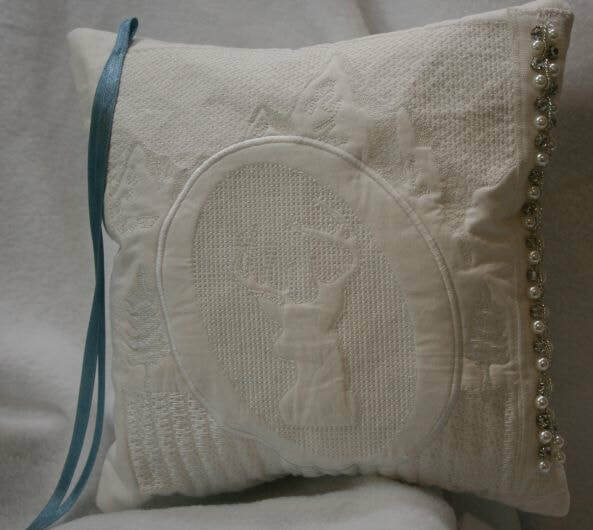 On both of the pillows, the addition of a blue ribbon will help cover the something "new and blue". Elastic was added to this one also. There are many tutorials on the internet on how to tie the rings to the pillow so I simply tacked them to the front so the bows can be untied and used for that purpose. 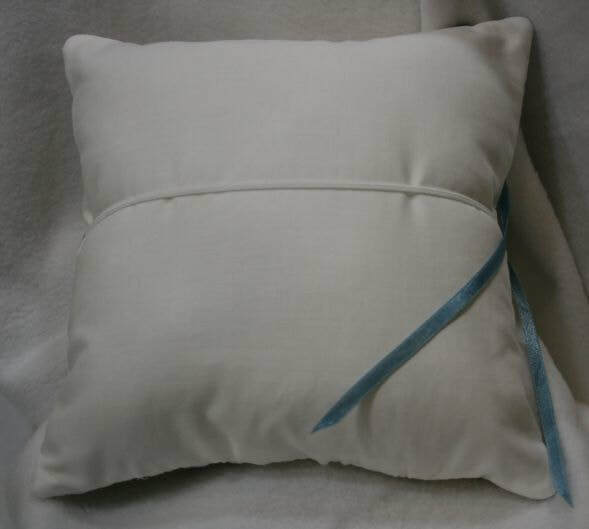 An off white ring bearer pillow might not be traditional but I can imagine this fitting into a less formal affair or even a re-commitment ceremony. In our area, weddings held in barns and rural settings are very popular also. These were so much fun to make and each one is unique. I hope you have enjoyed this post, share what you have learned and are generous with what you make. Someone will appreciate your hard work. 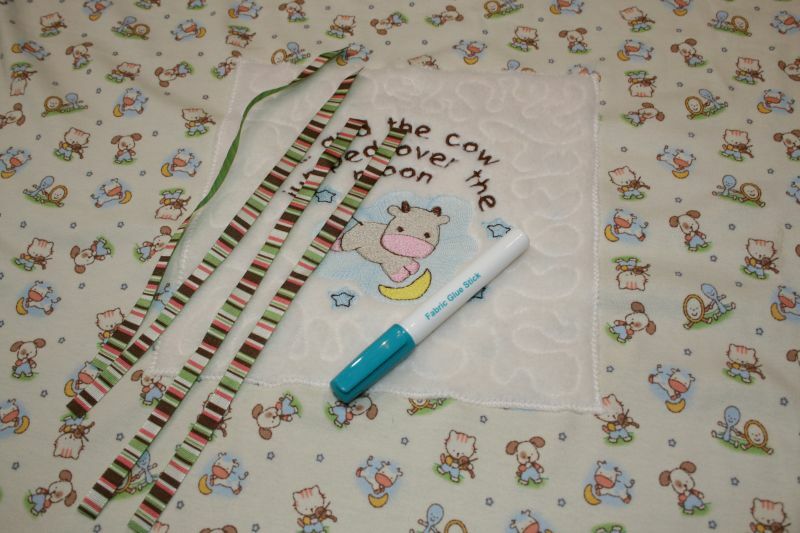 One of the sweetest gifts to sew is a baby blanket. 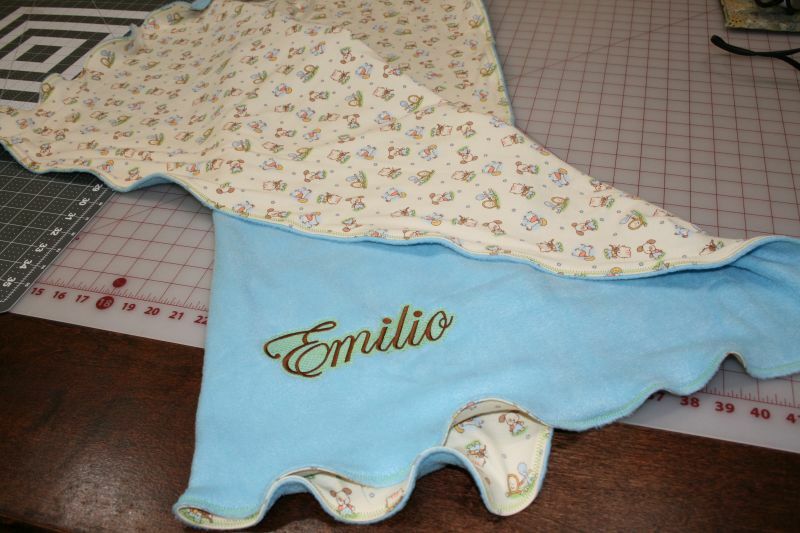 I have some friends that are brand new grandparents and once I heard about their newest edition Emilio, I knew right away what my next project would be. 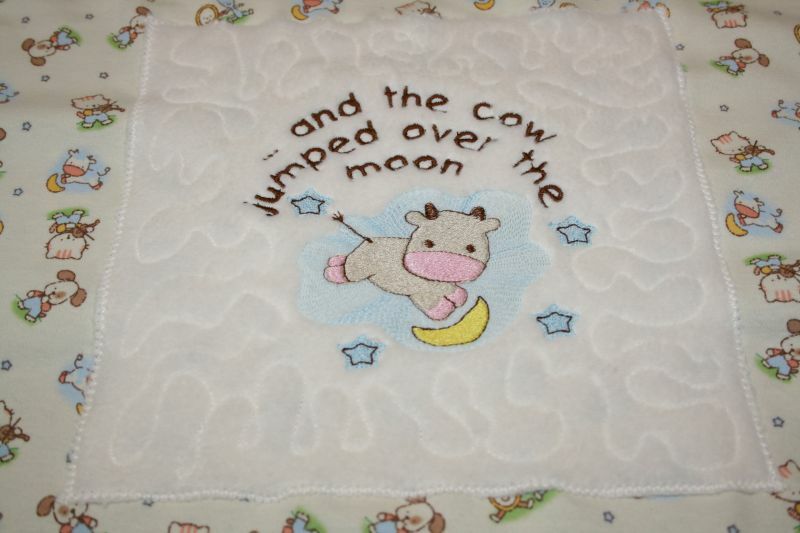 This knit fabric is so very soft and the timeless nursery rhyme theme is perfect for either a boy or girl. It would work as a receiving blanket by itself, but I wanted to add some embroidery to the front, so I added a second piece of fleece fabric to the back of it to help stabilize my design. 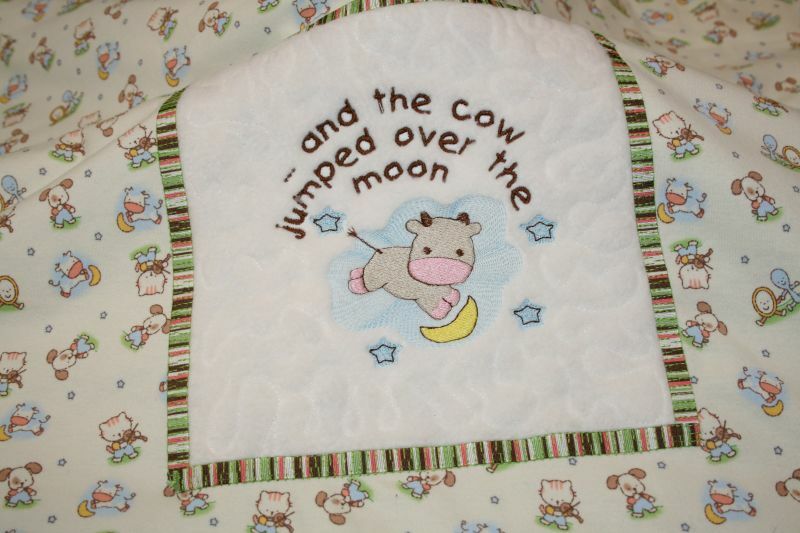 I used my embroidery software to digitize a little cow jumping over the moon to look like the fabric. 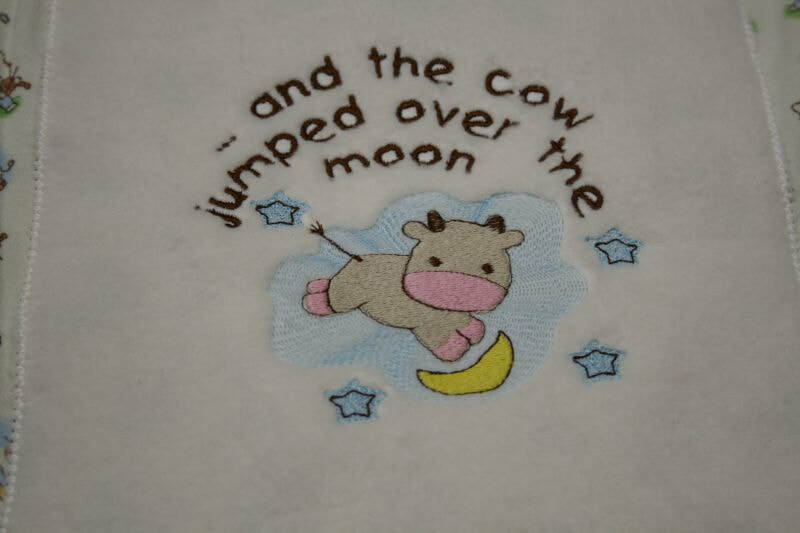 Then I added the text and embroidered it on a cream colored fleece. 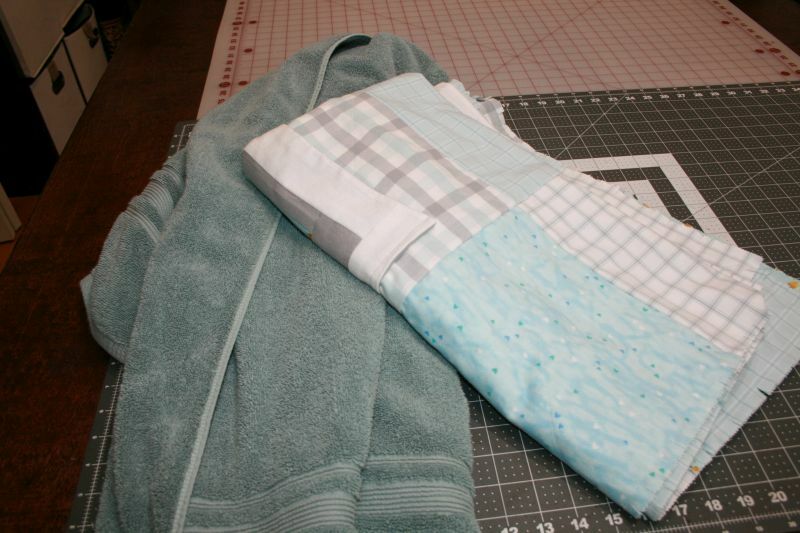 I used a zig zag stitch and attached the fleece to the middle of the printed knit fabric. Then I added some stippling all around the design to give it some dimension. It would have been very cute just like that, but I wanted to frame it out. So I looked for a coordinating ribbon. 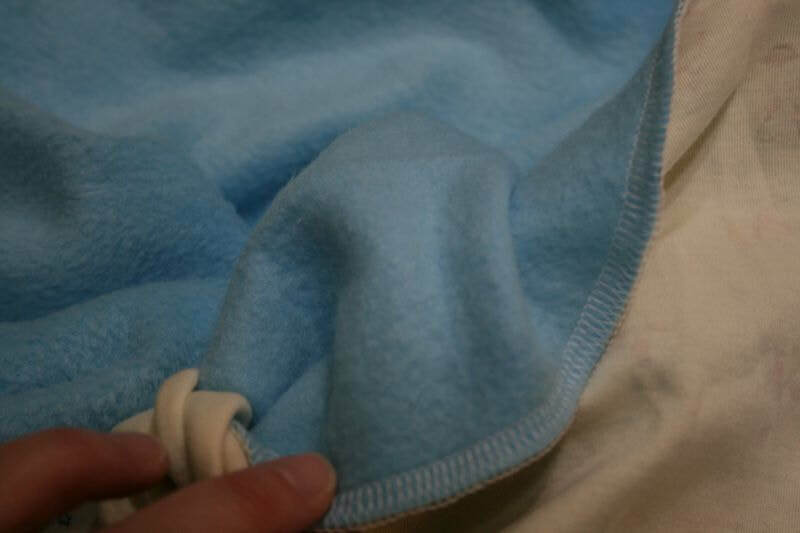 I cut four pieces to the length of each side of the fleece and with a fabric glue stick, I basted them in place. 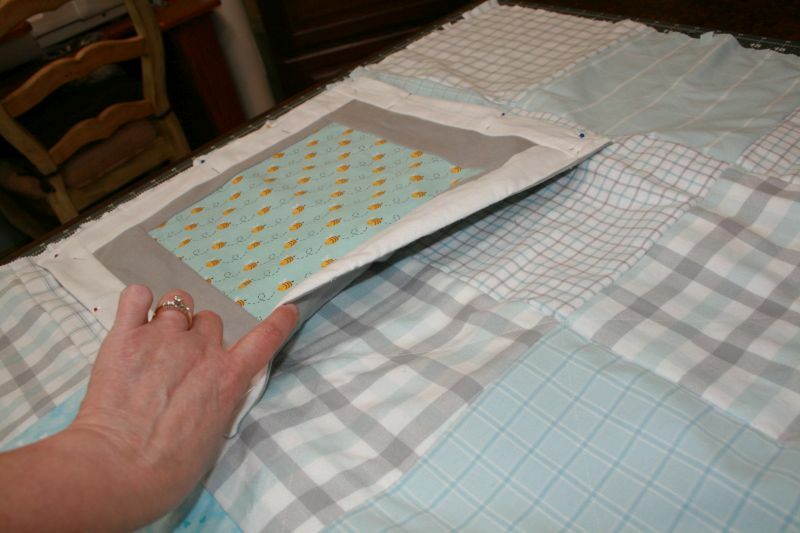 A blanket stitch around the inside and outside perimeter really gives it an extra detail. 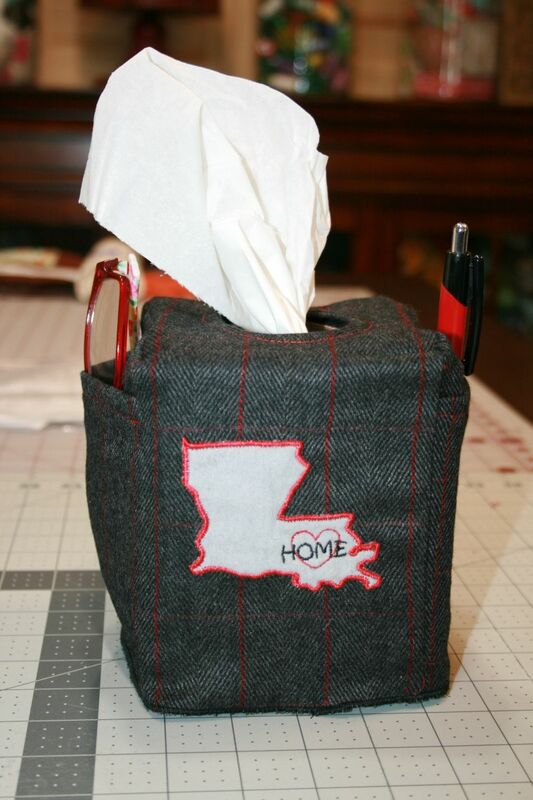 It will also help keep the ribbon attached through many washings. 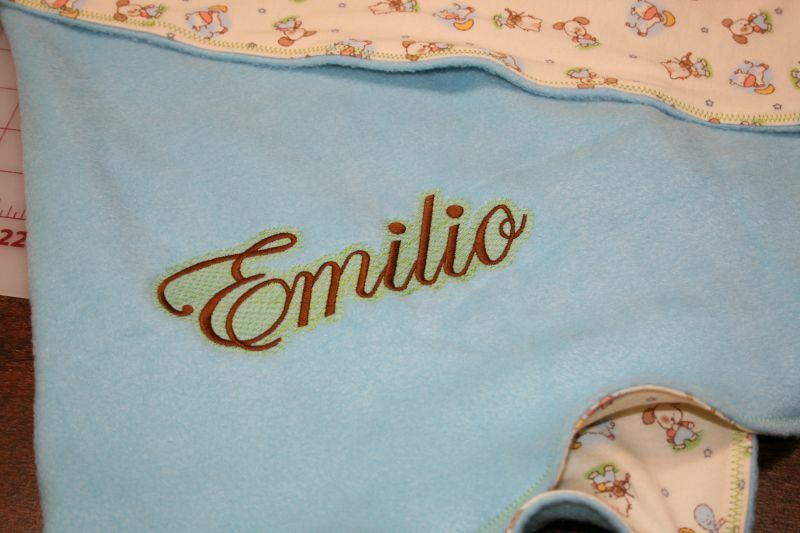 Using my software, I digitized his name along with some knockdown stitches so the pile of the fleece would not cover up the text. Next I stitched it onto the fabric and then placed both pieces right sides together so I could sew all around the outside connecting them. 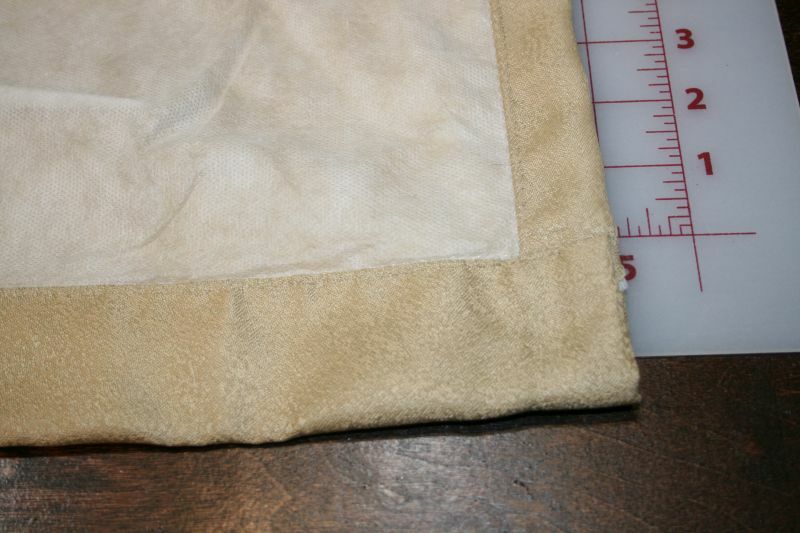 A four thread overlock stitch on a serger made it go very quick and I rounded the corners also. With a small opening on the side I was able to turn everything right side out. Little clips helped hold everything together so I could go around the edge and do a stretch zigzag seam as well as close the opening. 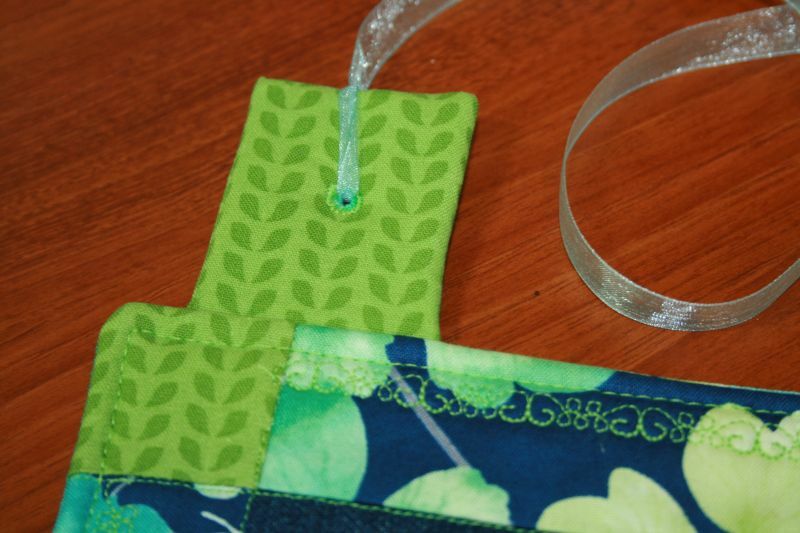 I also pulled the fabric a little as I sewed and created a lettuce edge. 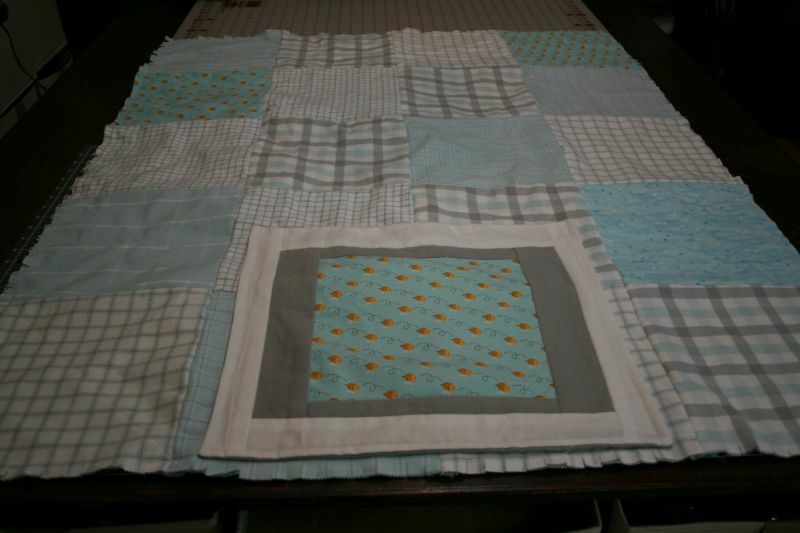 Everything on the blanket it sewn in a very sturdy way so it will be able to be washed and dried repeatedly. 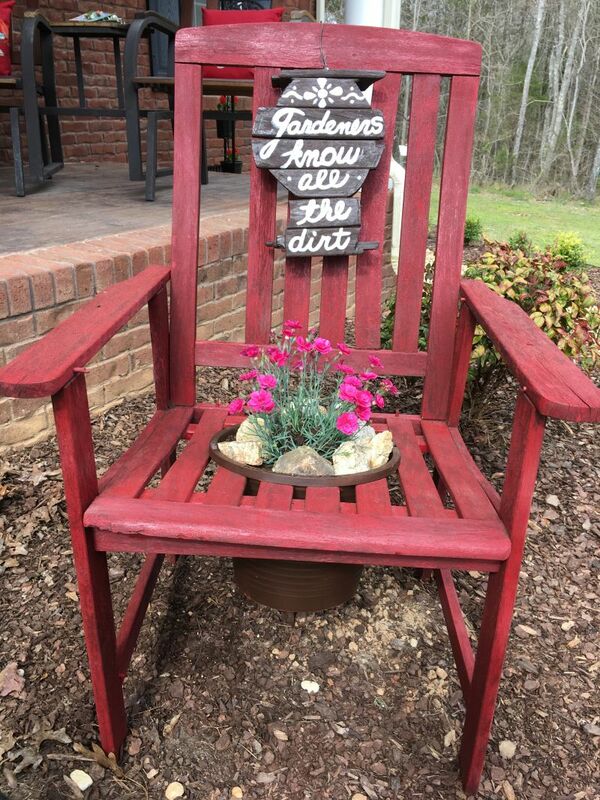 This was such a fun and easy project. 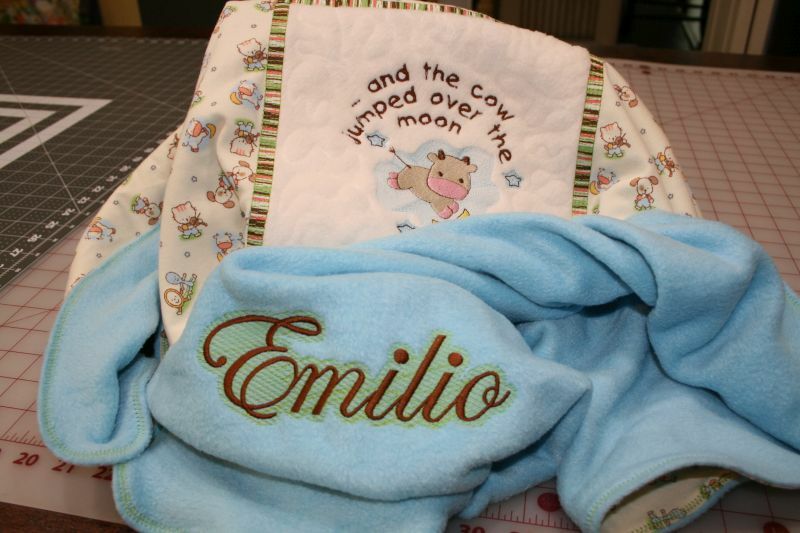 I know little Emilio will be so sweet snuggled up in this one and as I sewed it for him, those thoughts made it even more enjoyable for me to imagine his mom and dad using and loving this blanket. It really is just as fulfilling for the maker as the receiver. 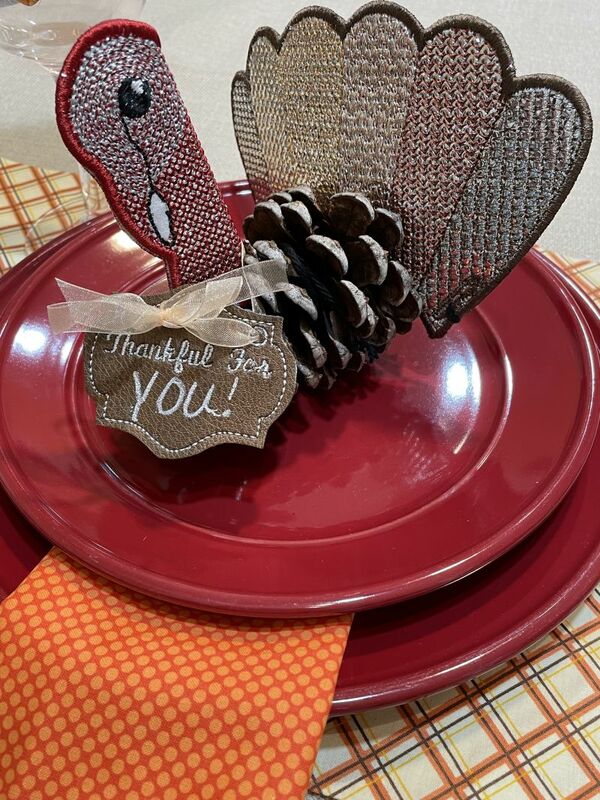 My latest project came about because the seasons are changing and it is time to pull out those in between clothing items. We have cool mornings and warmer afternoons. It makes it hard to judge what to wear. If you are like me, you probably have those few items in your closet that you will automatically go to because they either fit you well and they are most comfortable. The gray shirt above is one of those for me and since I can't find it in the store, I figured I might be able to duplicate it. 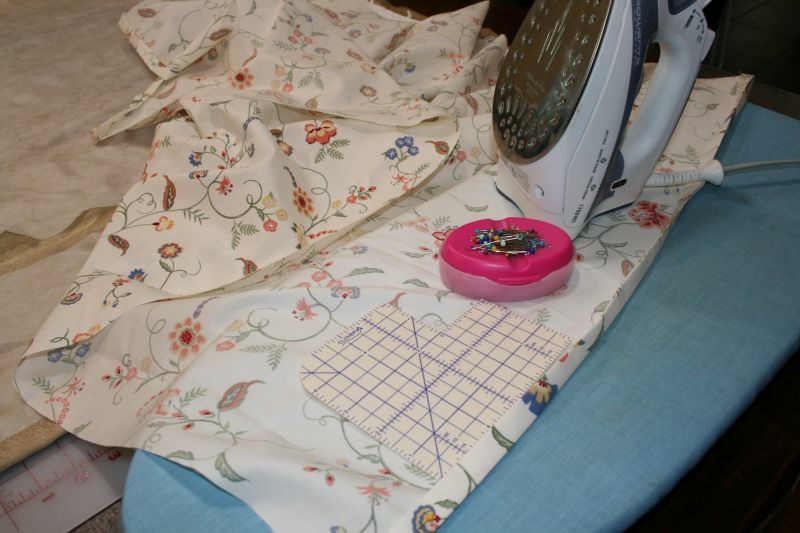 The floral shirt is just one of several I have been able to sew after drafting a pattern from the original shirt. 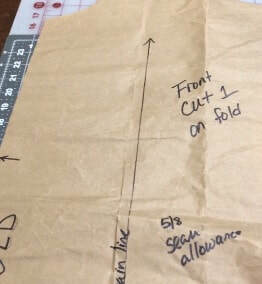 I used folding techniques, a couple of rulers and some brown paper to trace off the pattern. 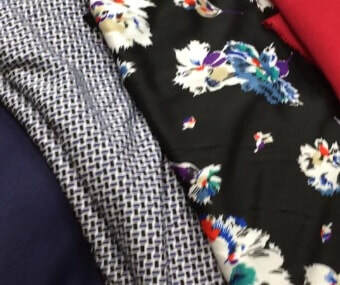 I had fun shopping for several pretty fabrics and I didn't spend a lot of money either. Here are a couple of pictures of me wearing my shirt. I think it turned out really nice and it is so very comfortable! 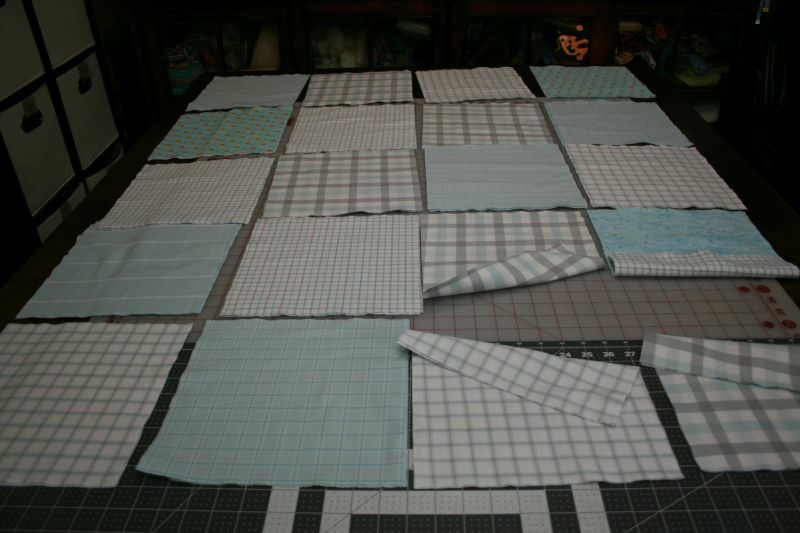 Here is a picture of part of my drafted pattern. 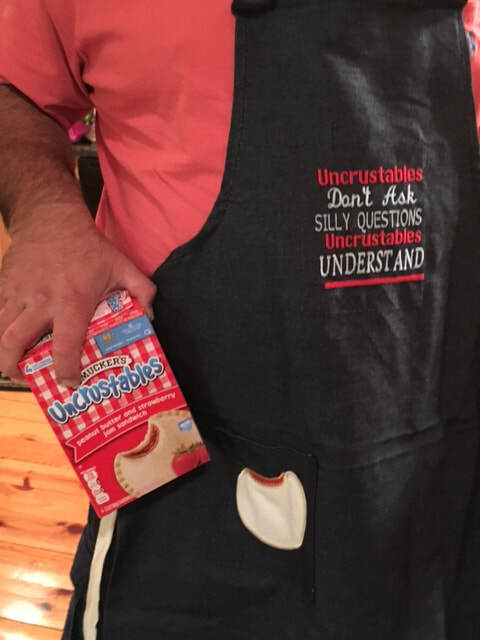 I think the secret to this one was I chose a very easy shirt to copy. If you are interested in the process, I have two you tube videos below you can watch. 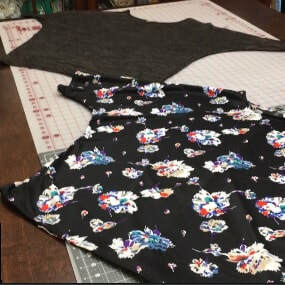 The first one goes over how I did the pattern and the second one shows me sewing the shirt with my serger and sewing machine. I hope you have enjoyed this post, share what you have learned and are generous with what you make. Someone will appreciate your hard work! Recently I made the decision to upgrade my embroidery machine. I have actually been researching different machines for about two years. 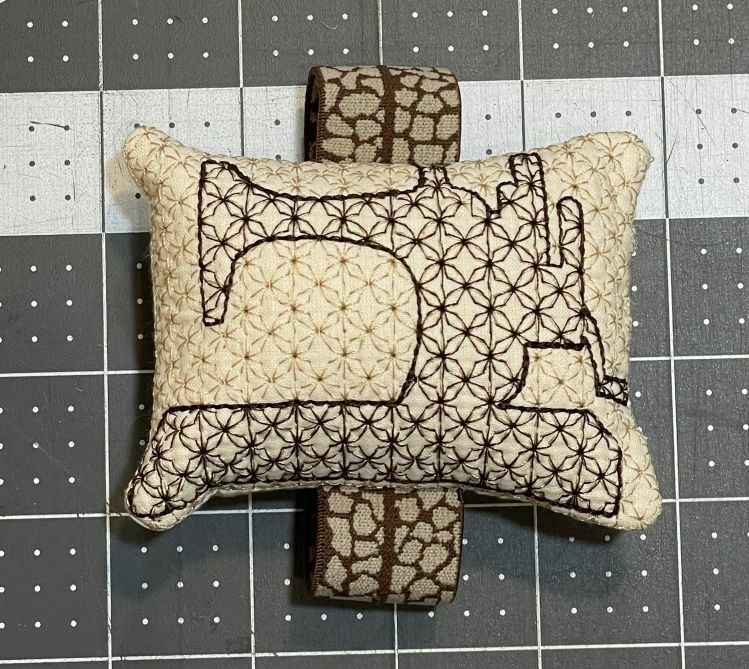 Although I love my single needle machine, I have been fascinated with the thought of putting a design on and not having to sit to change the colors. 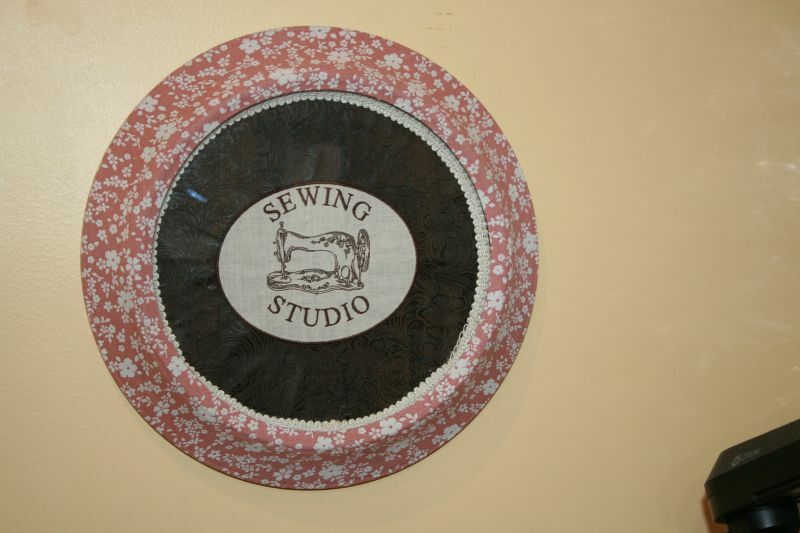 Also, the idea of having a much larger sewing area is a great option to have. 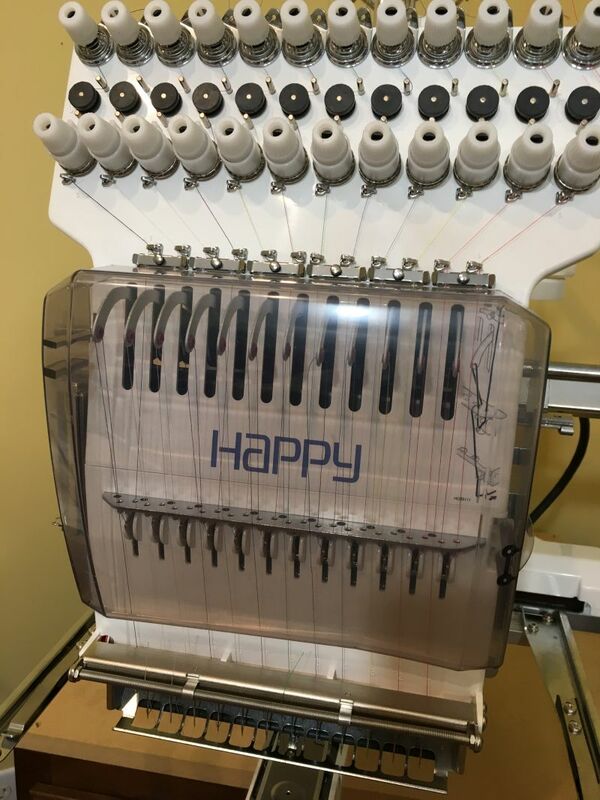 So I made the decision to purchase the Happy 12 needle machine. 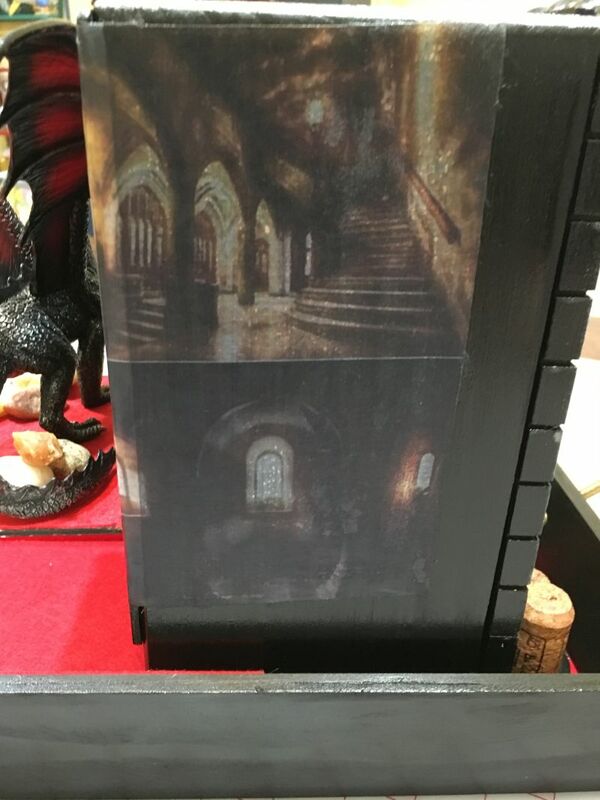 It was based on a lot of good comments from the online forums as well as looking at how the machines are made and a lot of investigating at stores and conventions. The only concern I had was could I maintain a commercial machine. There is so much more to them than what I am used to with a home machine. It has been a learning experience even with all of my research and my prior embroidery experience. I ordered the machine sight unseen and didn't have much trouble setting it up once it arrived in the crate. 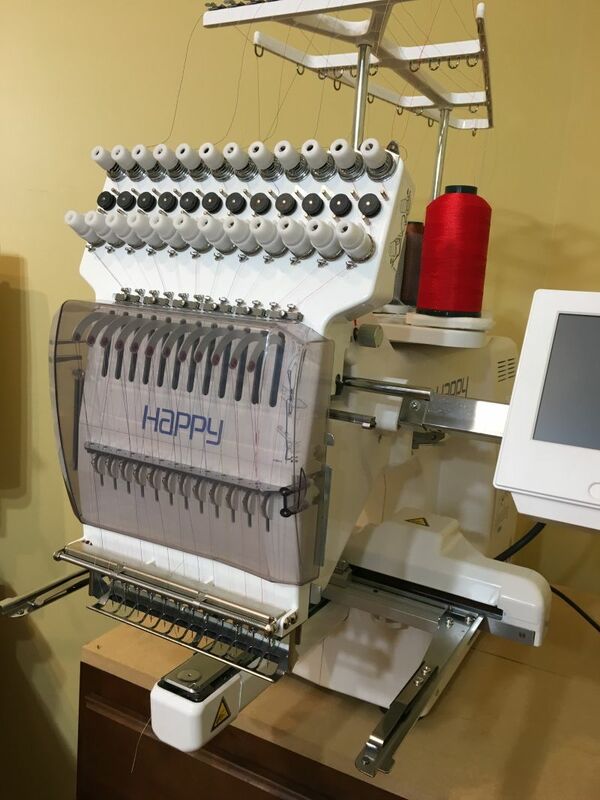 I can say the instructions that come with it are cumbersome and if you want to start embroidering right away, you may have better luck going to the location where you are purchasing and getting a crash course. 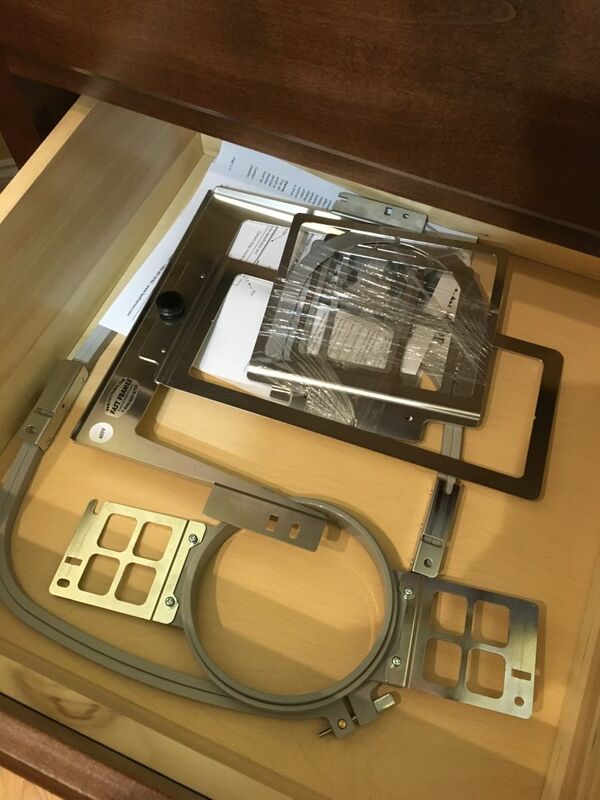 I put the machine on a cabinet from the hardware store so it would be nice and stable. If you are considering purchasing one, keep in mind that they are much taller than the home based machines. 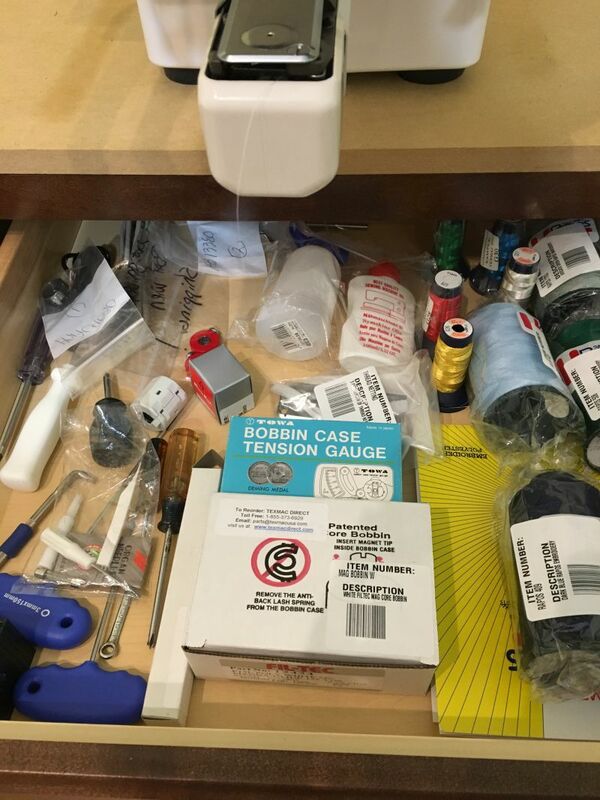 This cabinet holds all of the hoops I have purchased so far really well and it is very sturdy although the machine does not move around as much as I thought it would. 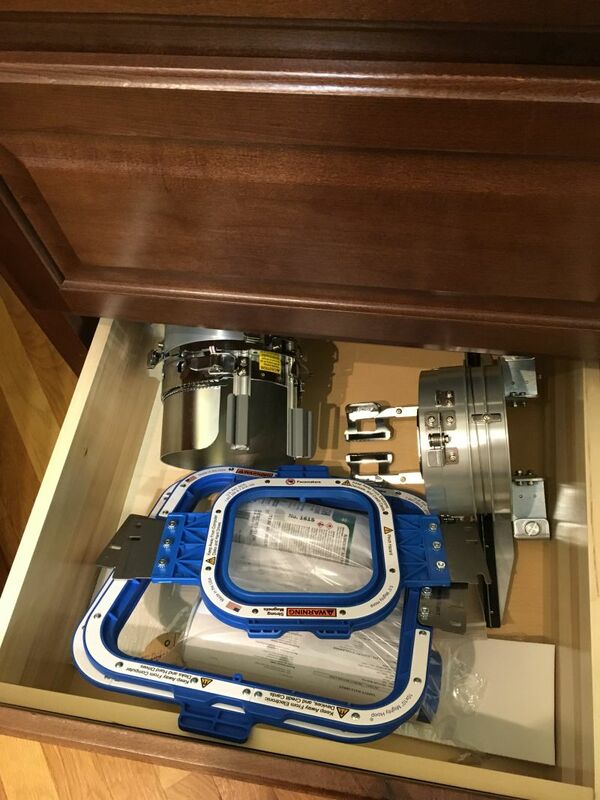 There are a lot of tools to keep up with and maintenance procedures so make sure you really look into it before you make your final decision. As with most things in my studio, I want to know how they work so I don't have to depend on anyone unless I absolutely have to. With this machine, I did have problems getting the tensions set up right. I just could not get it together. Then one day it clicked after I had just about given up. If you are interested in seeing what I did to figure it out, I have uploaded a video to my youtube channel here. I hope you have enjoyed this post, share what you have learned and are generous with what you make. Someone will appreciate your hard work. 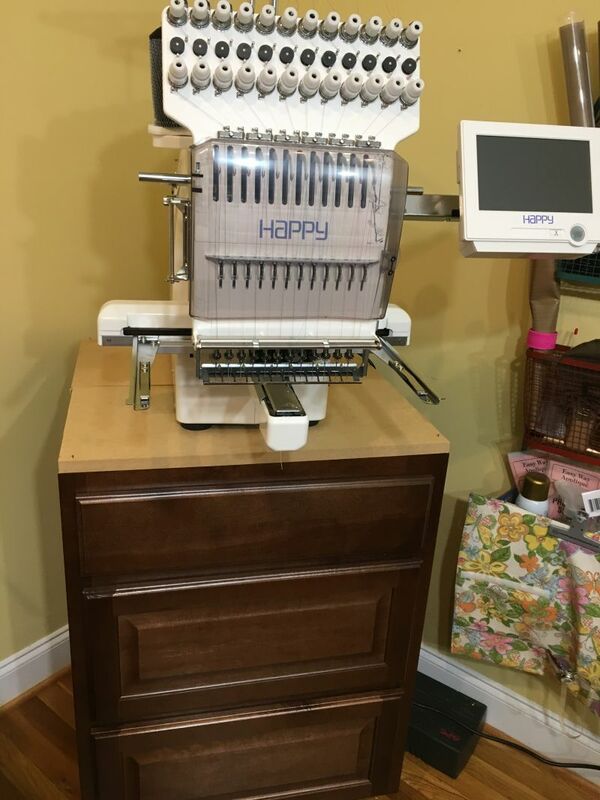 If you are in the market for a multi needle machine, they are wonderful to sew on. Once you do your research, go for it. Happy sewing! My latest project has truly been a labor of love. 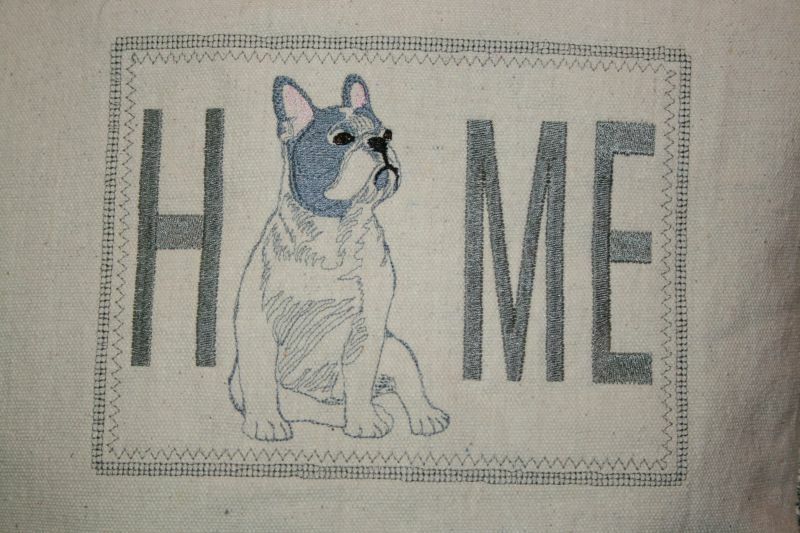 I brought two things together that make me very happy: sewing and French Bulldogs. 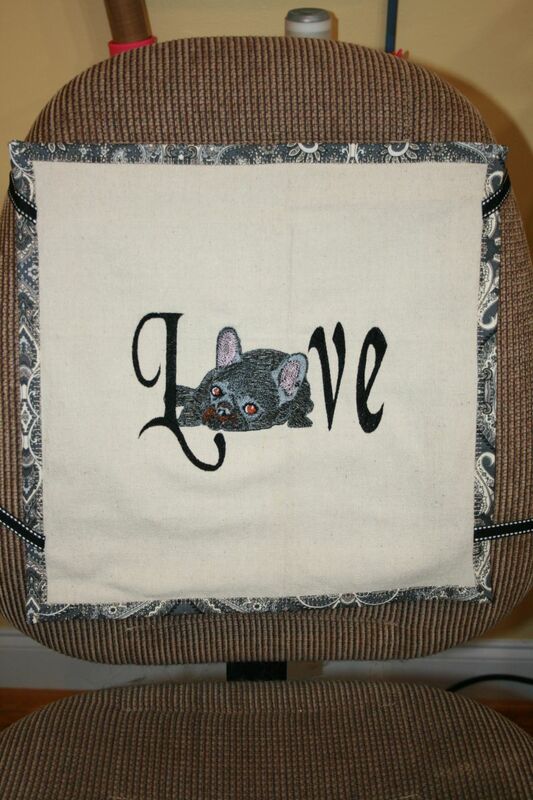 If you have read any of my previous posts, you know that I am learning how to digitize in my embroidery software. Although it has been a journey, I think I am starting to see some success. 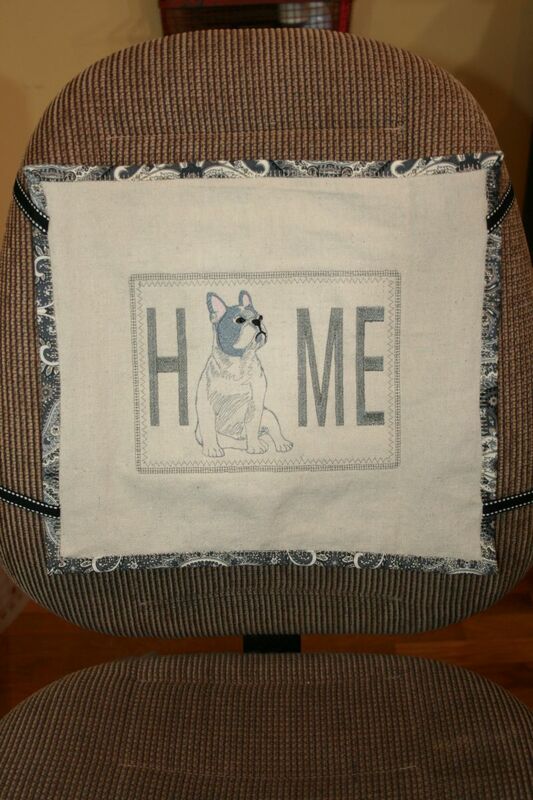 For these projects, I started with a picture of a French bulldog that I got from the internet. I made sure I used one that was free for use from the public domain. I pulled it into my software and hand digitized the image. If you have done any digitizing you know that any design can be challenging, but animals are unique because of their fur. I did a second French bulldog that resembles Jean Luc. Once I had both dog images the way I liked them, I added other elements and text around. I decided to embroider both designs on duck fabric. I was really pleased with how they turned out. 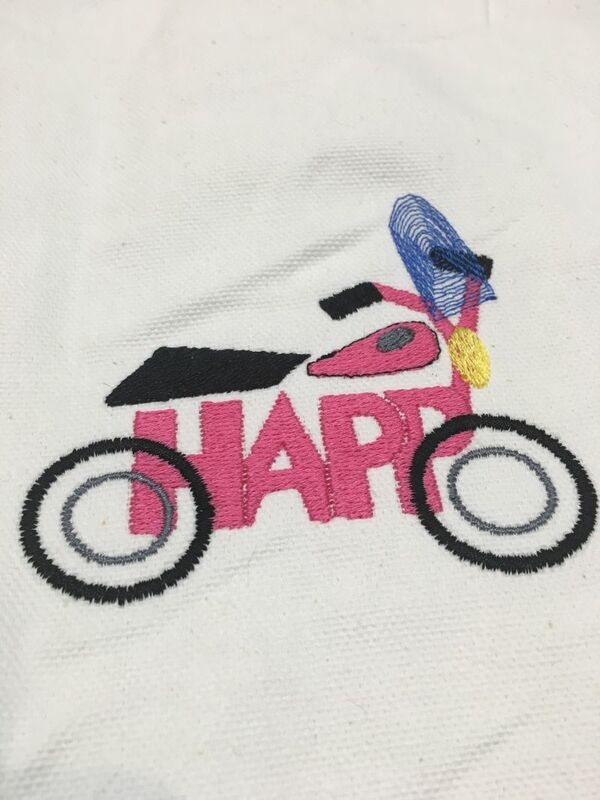 In the digitizing, I wanted to see if I could reduce the amount of jump stitches and keep the density down so the sewn out designs would stay soft. It has become kind of like a game to see if you can retain the best qualities of the design while reducing stiches and time to complete. 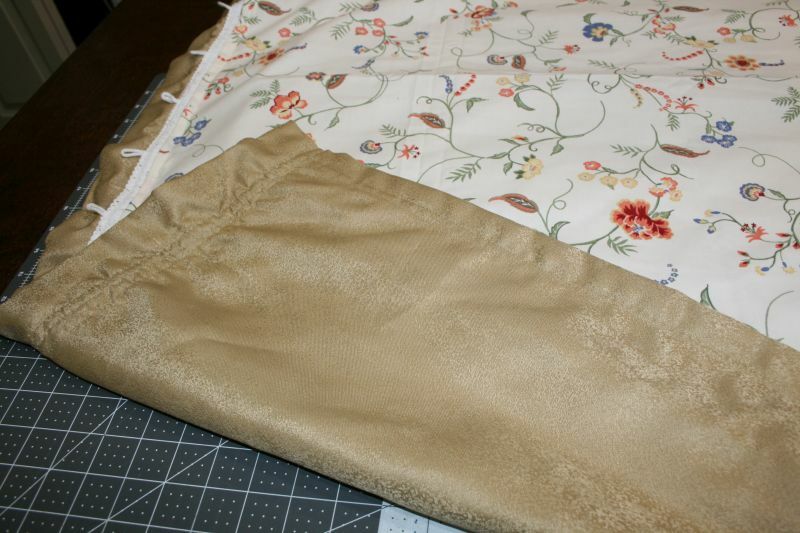 I had some beautiful decorator weight fabric and ribbon that helped complete the pillow wraps. 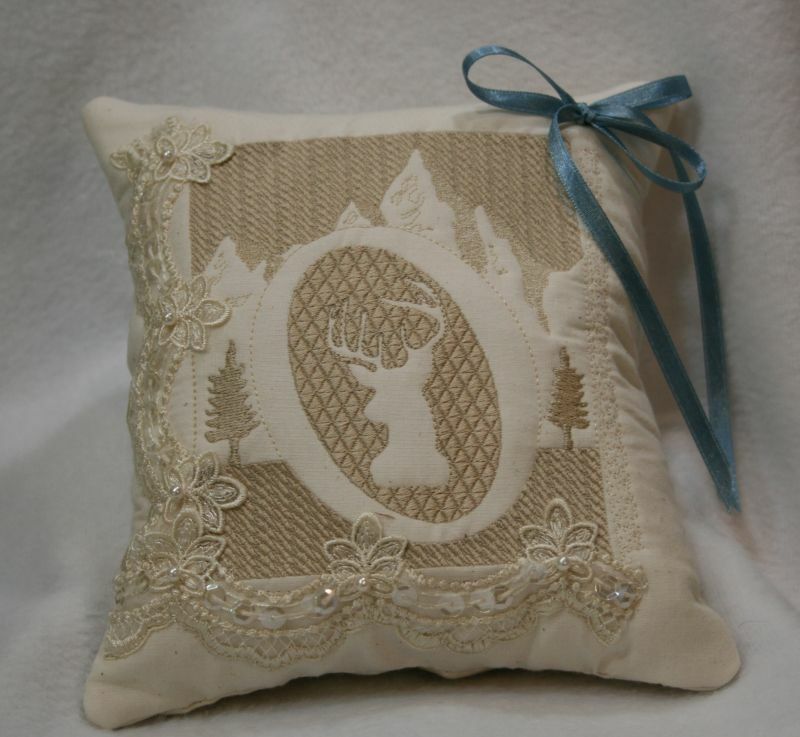 These are a really great way to change the look of a pillow for seasons. I cut the decorator fabric about 2 inches larger than the embroidered front, tacked the ribbons to the front with a basting stitch and then wrapped the decorator fabric toward the front with a 1/2 inch bound edge mitering the corners. 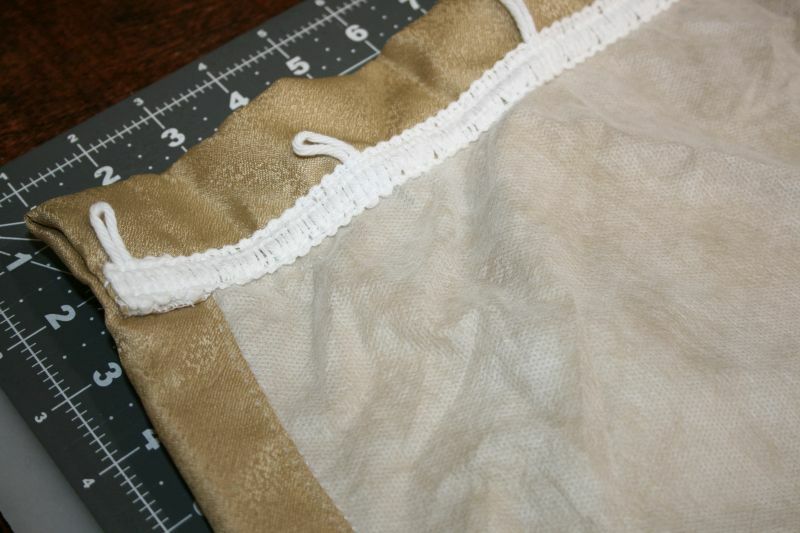 Then I sewed an overcast stitch all around the perimeter of the wrapped edge. 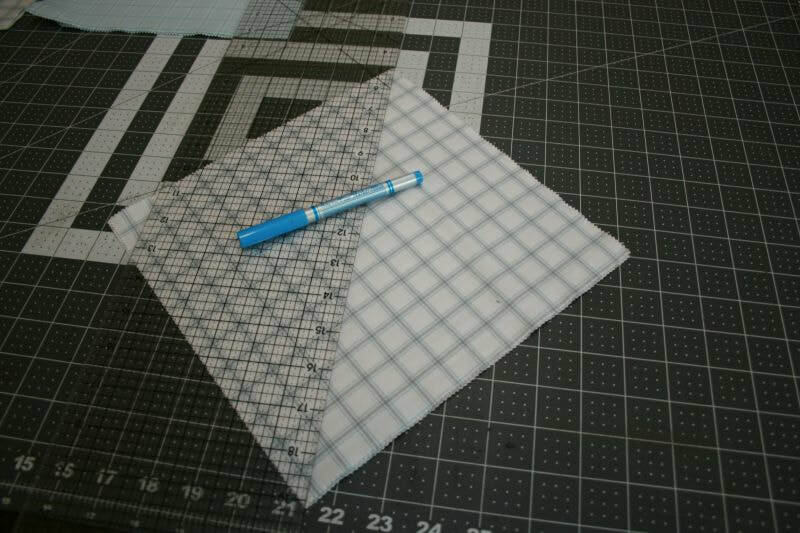 For a 14 inch square finished pillow wrap, the decorator fabric was cut 16 inches square. 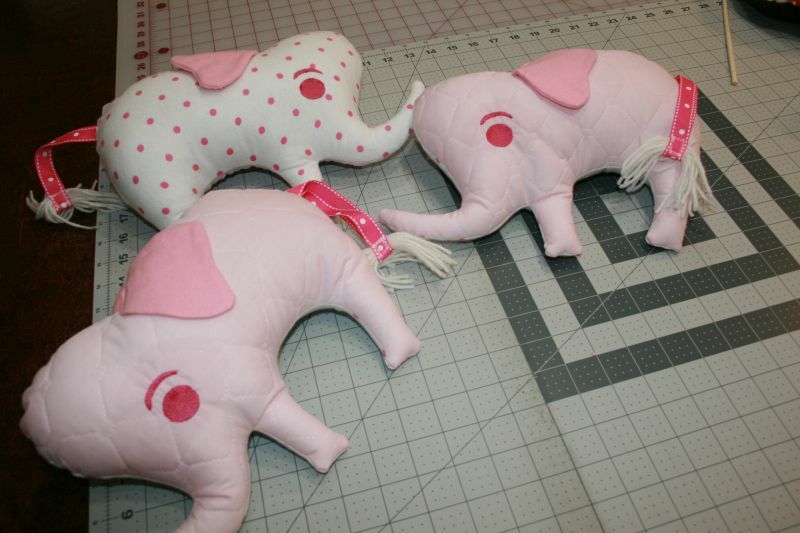 I also made sure that my ribbons would be long enough to go around larger pillows so each one of them was cut to 24 inches. 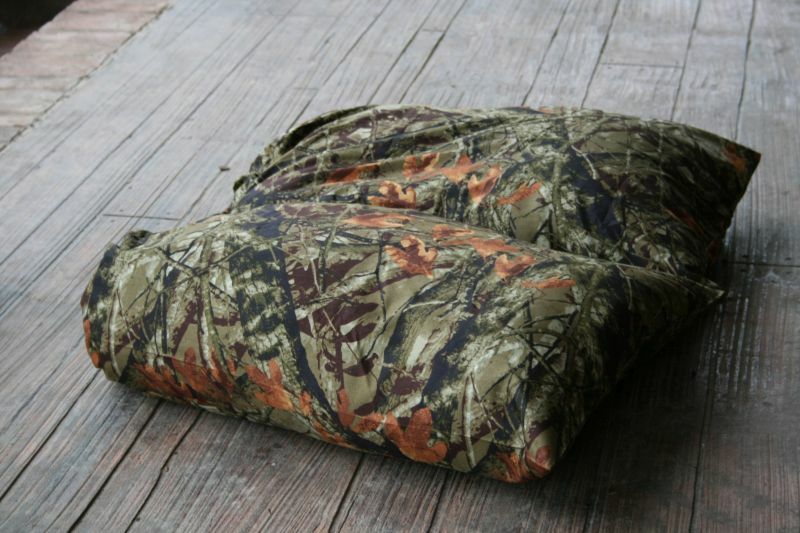 That means the pillow wraps could also be used on a chair back. 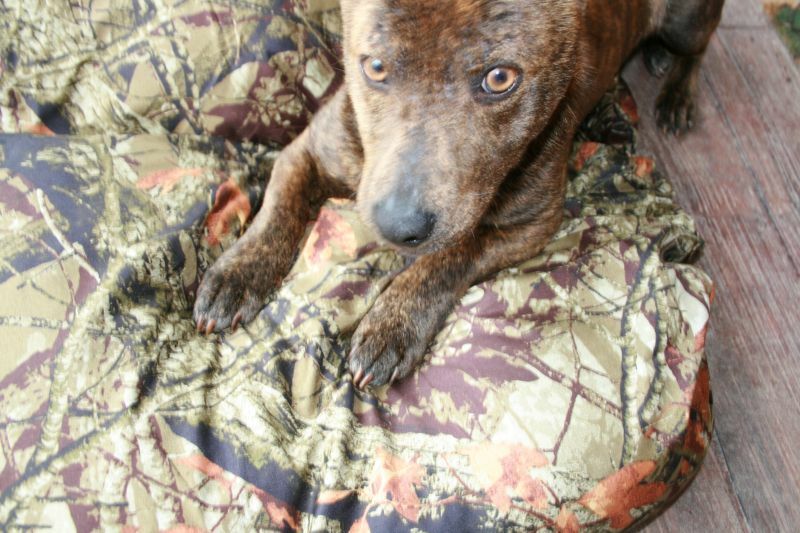 This picture shows one of them on my sewing chair. 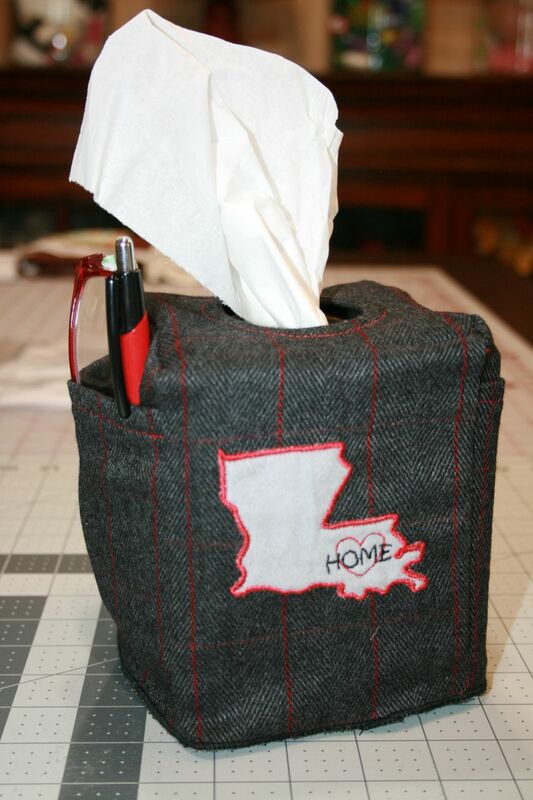 This would be a great gift for someone in an office that wanted to have a little personalization. 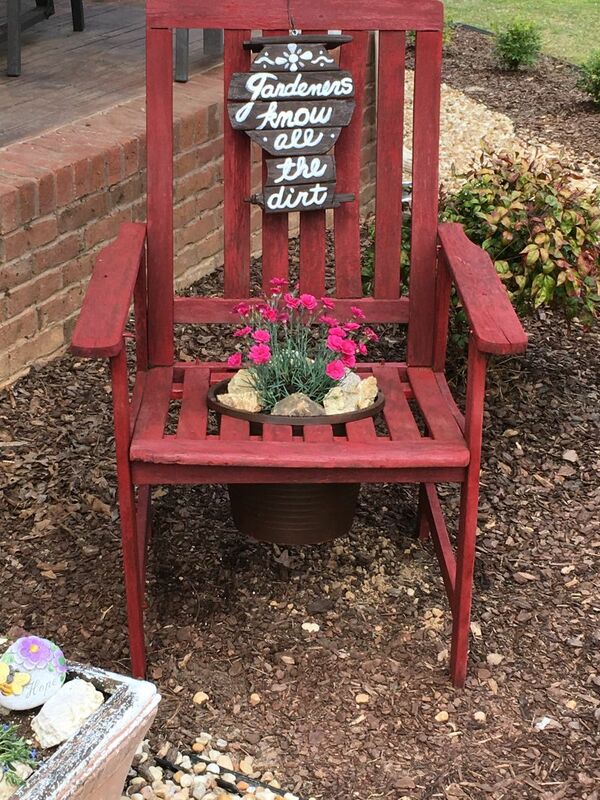 You could also use something like these on your dining chairs. 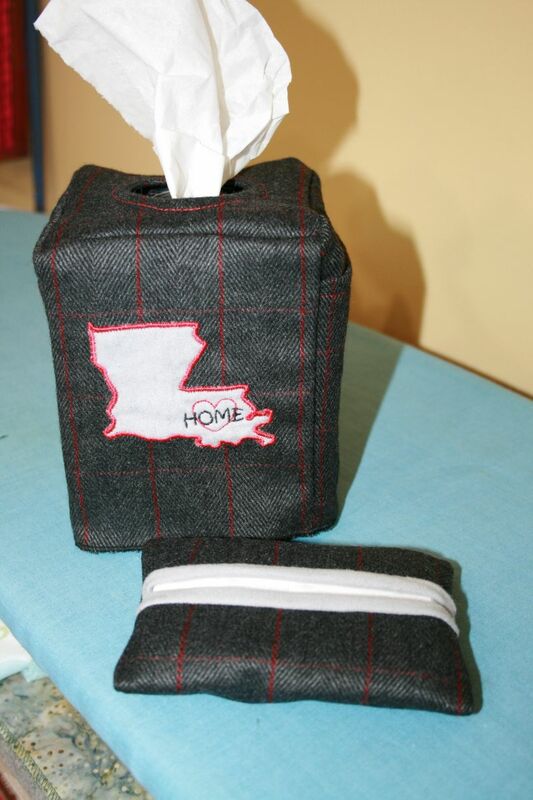 These pillow wraps were not difficult to put together and the possibilities are endless. 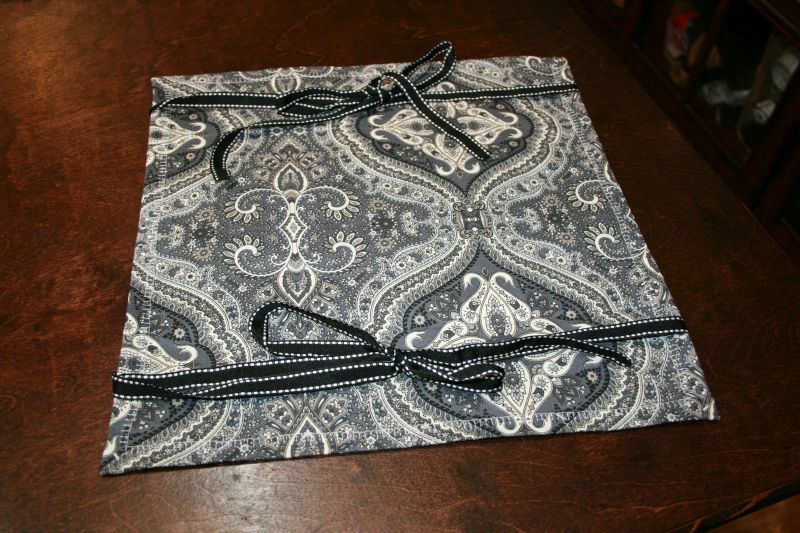 With the decorator fabric on the back and the way the ribbons are sewn into the seams, they are completely reversible. I hope you have enjoyed this post, share what you have learned and are generous with what you make. Someone will appreciate your hard work. 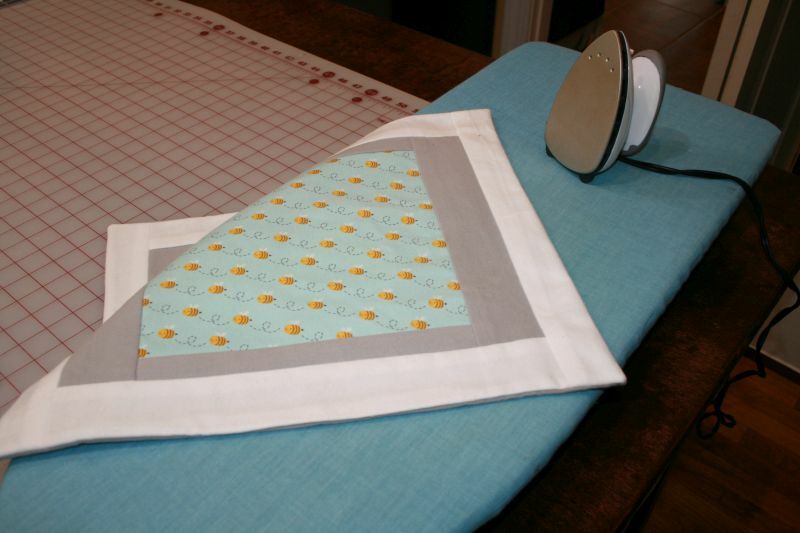 Sometimes, you just want to sew with no plan in mind and see where it takes you. 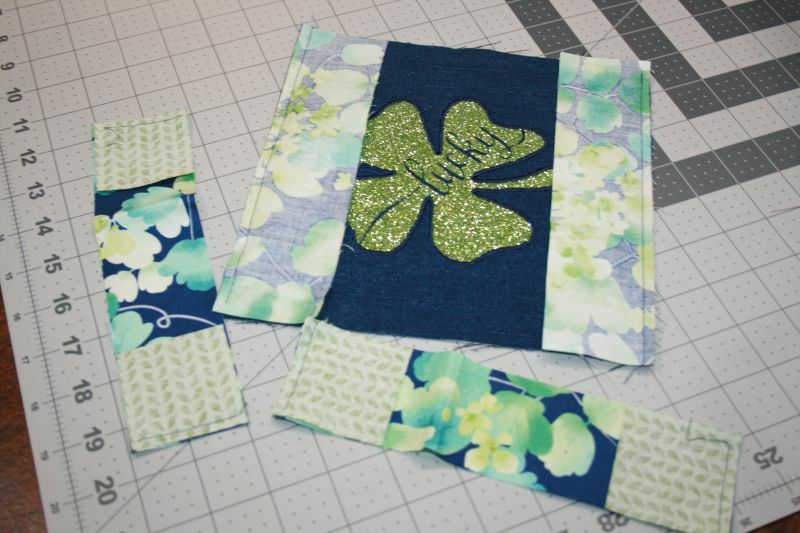 When I made this shamrock block, I wasn't sure what the finished product might be but I really enjoyed the process. One of my new tools in my studio is an electronic cutter. 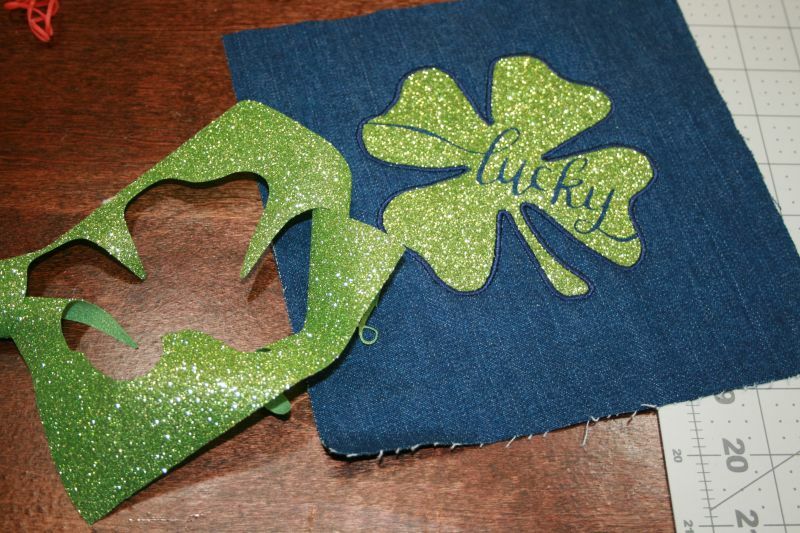 I had some glitter Heat Transfer Vinyl and I thought a shamrock would be an easy object to cut out with it. 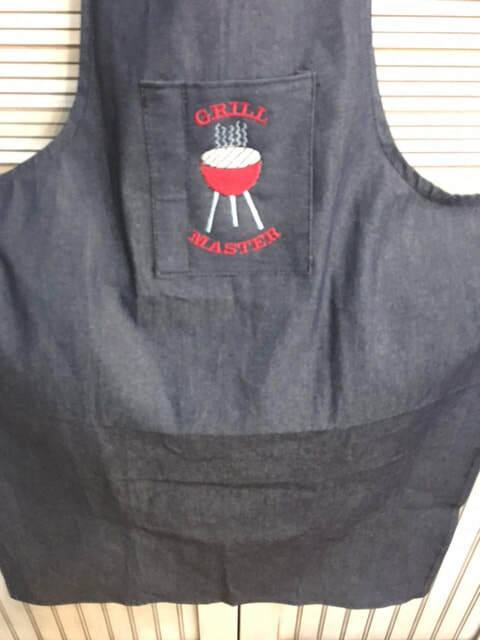 I used my cutter software and my embroidery software to create the cutting line as well as the placement line so I could applique the vinyl to a piece of denim. If you are thinking about purchasing an electronic cutter or if you already have one but are afraid to use it, take a close look at the text. That is not embroidery. It is the fabric background from the text being cut from the vinyl. This is so precise if you have a good blade and all of the correct settings. 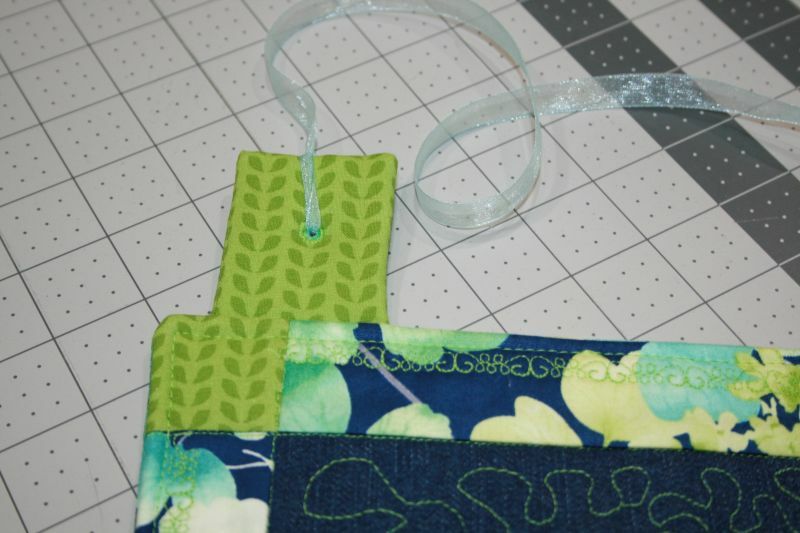 Once I had it cut out, I embroidered a placement line, put it exactly where I wanted on the fabric and then tacked it down with a zig-zag stitch. 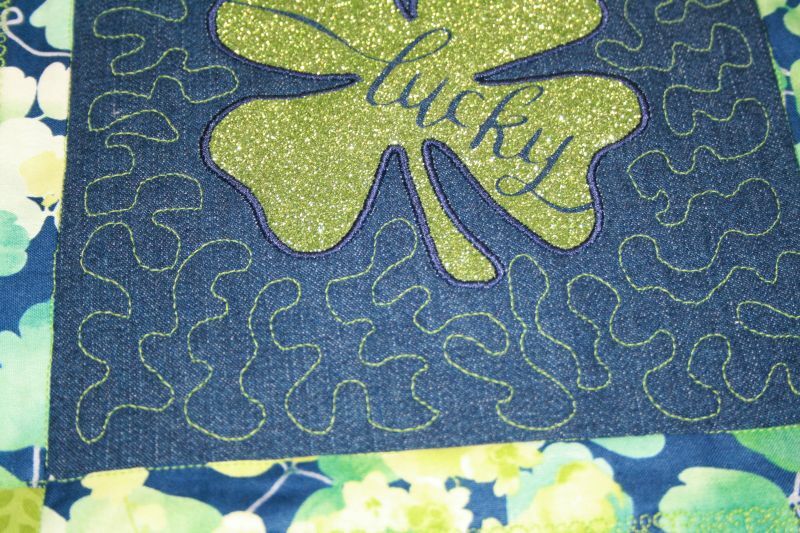 A warm iron applied on the vinyl secured it to the fabric and finally the outline stitched around the shamrock. At this point it looked so pretty I knew I wanted to make something that could be displayed. So I went into my fabric stash and found the floral quilting print. I recently attended a seminar at my local quilt shop and the floral was part of a free sample. I only had one piece so I knew I had to do something on the small side. 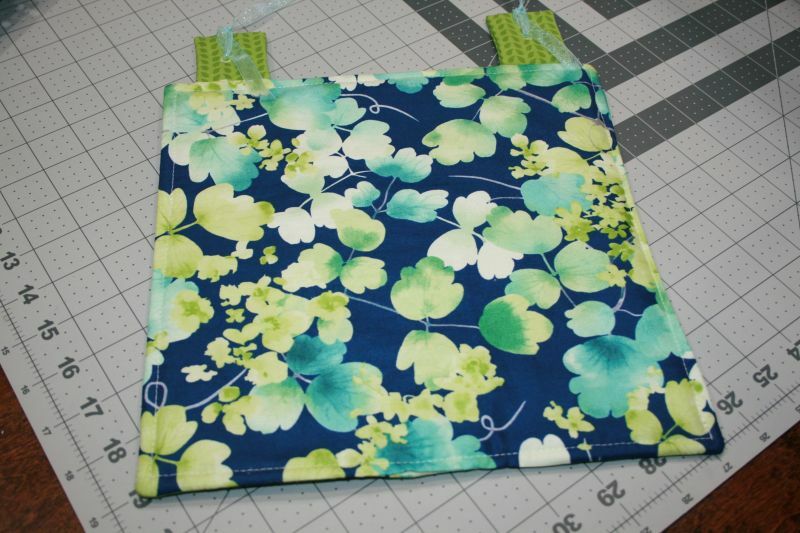 I cut the center fabric to 8 x 8 inches. 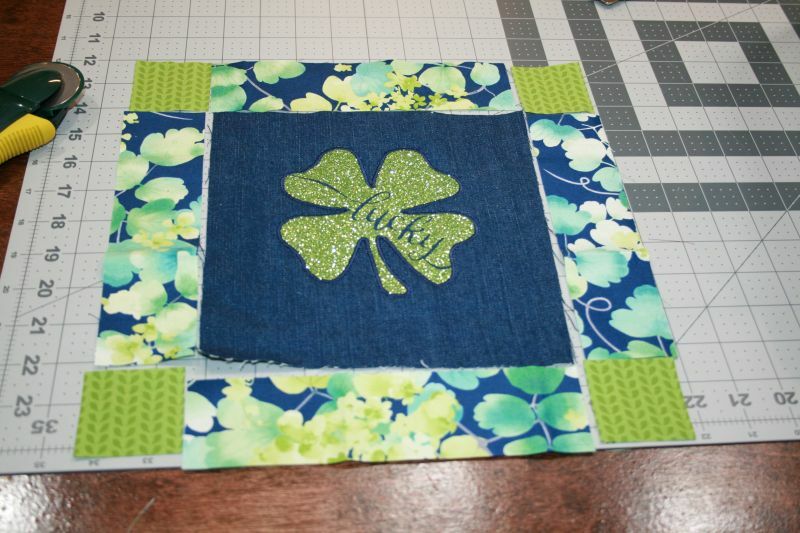 Then I cut four 2x2 squares for the corners and four 2X8 pieces of the floral. I pieced everything together and ironed the seams. 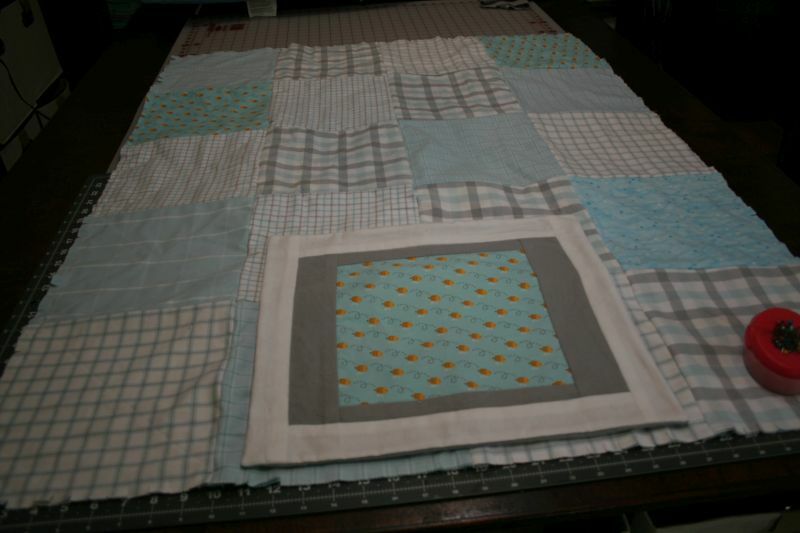 Next I added a piece of quilt batting behind the pieced front and started playing with several stitches on my machine. 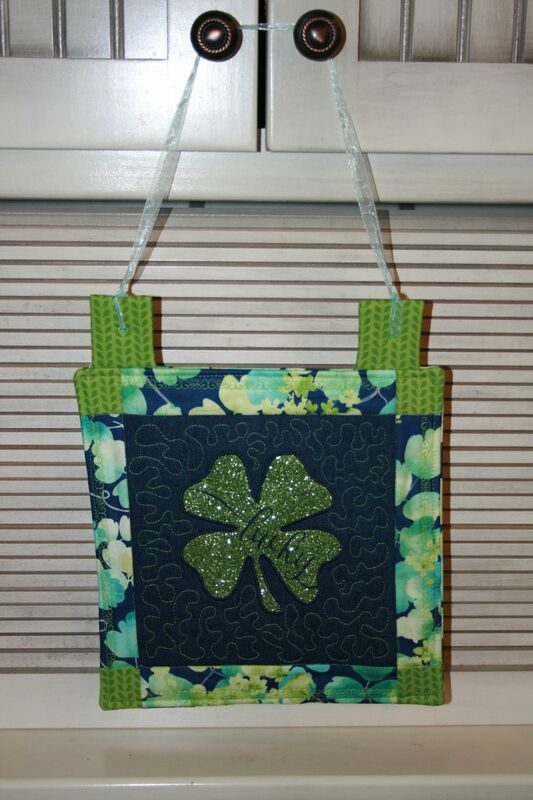 I tried a decorative stitch along all four sides and also quilted in the ditch. 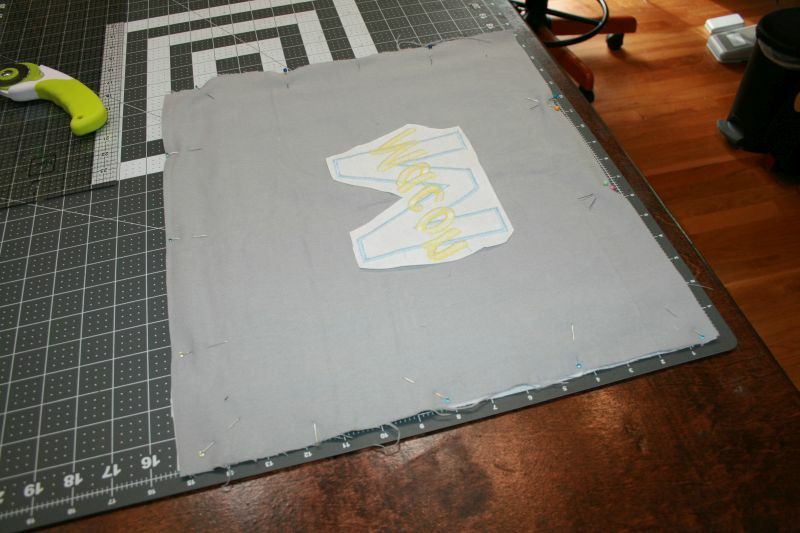 I used heavy duty interfacing and made a couple of tabs so I could hang it like a sign. My sewing machine has a decorative stitch that sews a circle. This was perfect to pass some organza ribbon though. 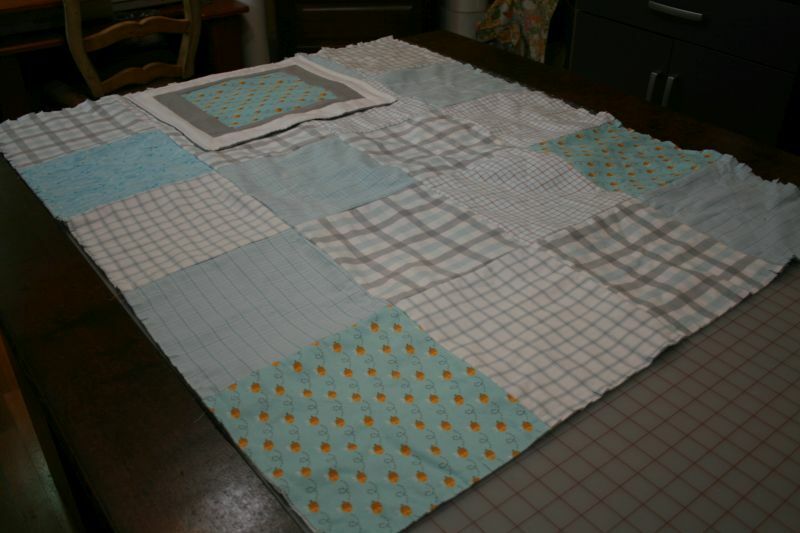 I used the remainder of the floral print for the back without any quilting. 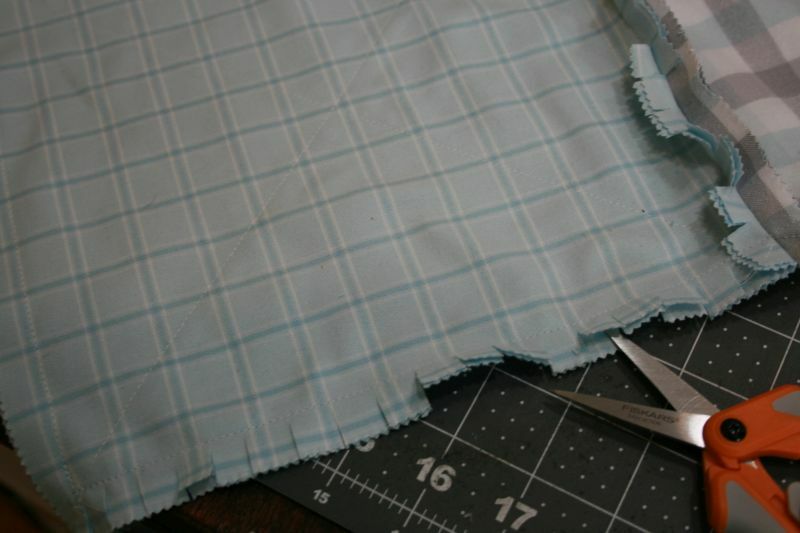 So it was a simple sew around three sides turn and then topstitch the perimeter. This was a very relaxing way to bring a project together. I just kind of played with materials I had on hand and I used the tools in my studio. 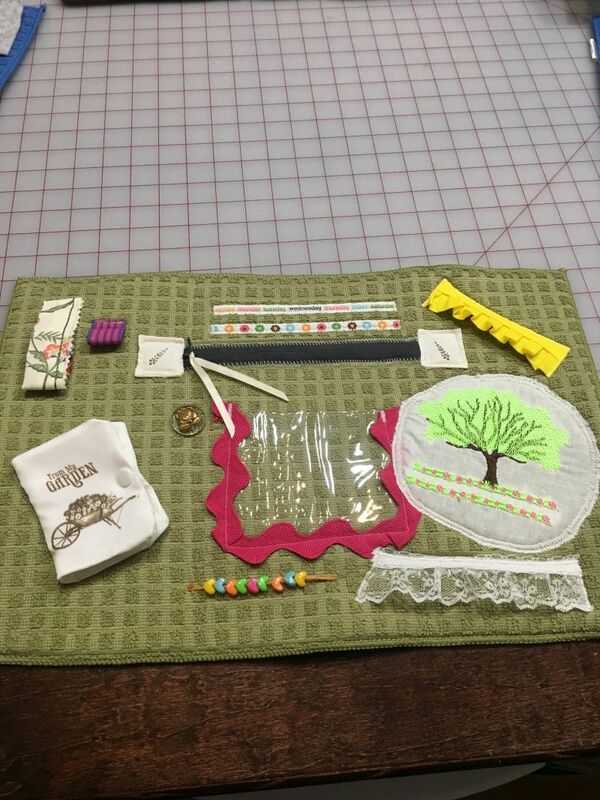 I hope you have enjoyed this post and that it inspires you to sew for relaxation once in a while. Share what you have learned and be generous with what you make. Someone will appreciate your hard work. We have a new furry buddy "Rambo" and he likes to chew and drag everything. So much that he has already gone through two beds. 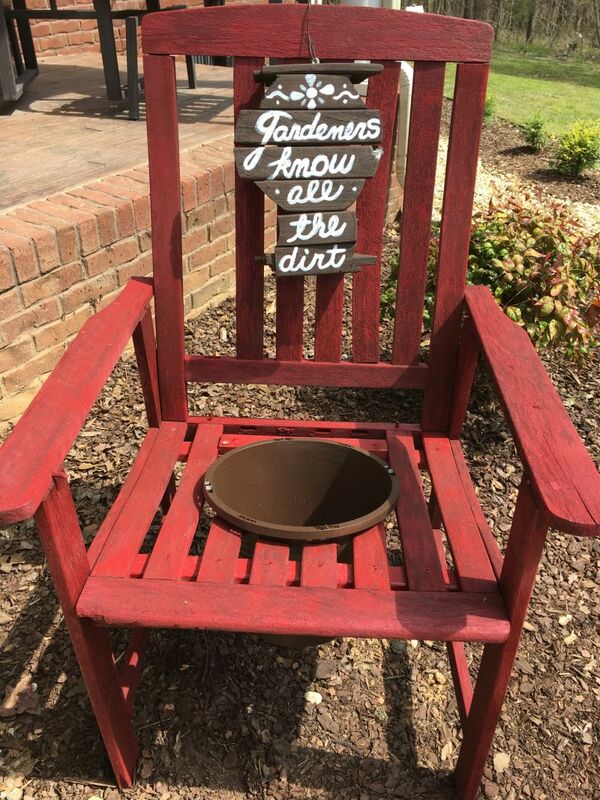 Luckily they were older beds that we had already. 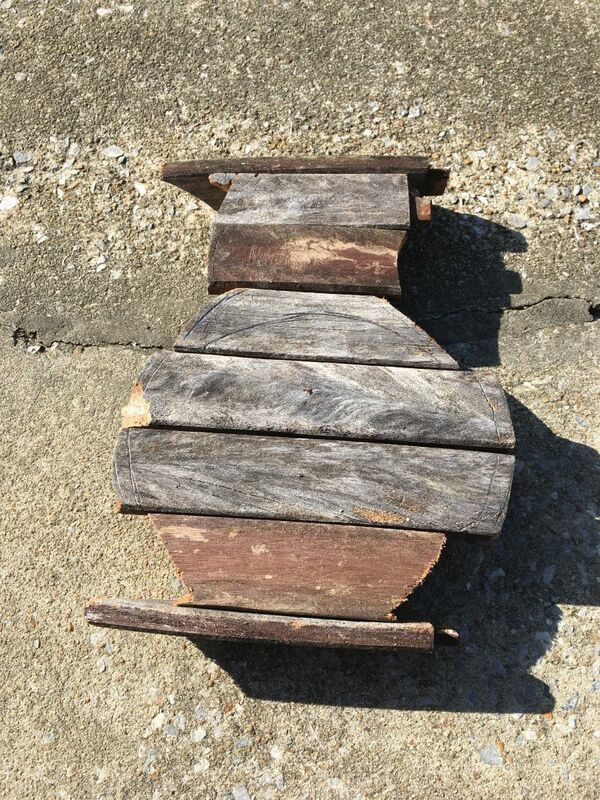 Instead of purchasing a new bed, we decided to make one that wouldn't be a great loss if it too went to the trash. 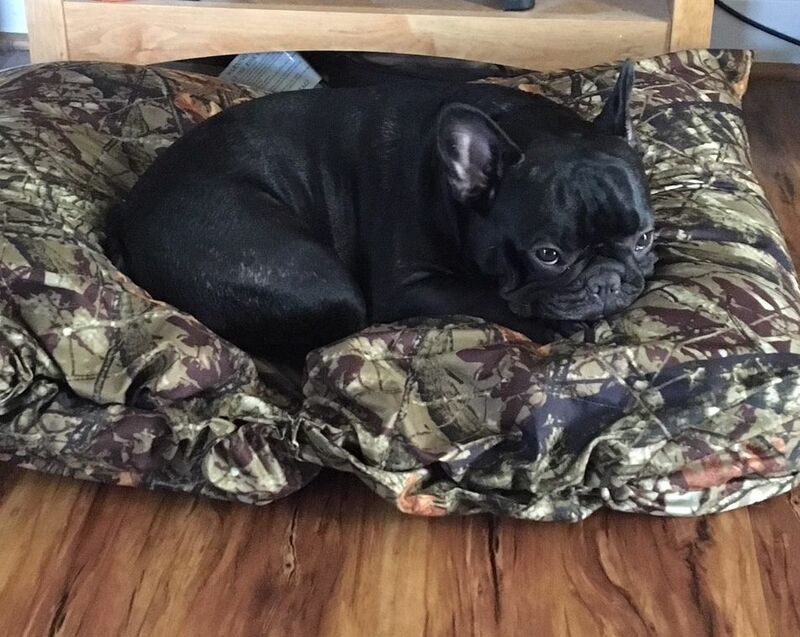 Here he is enjoying the new bed. 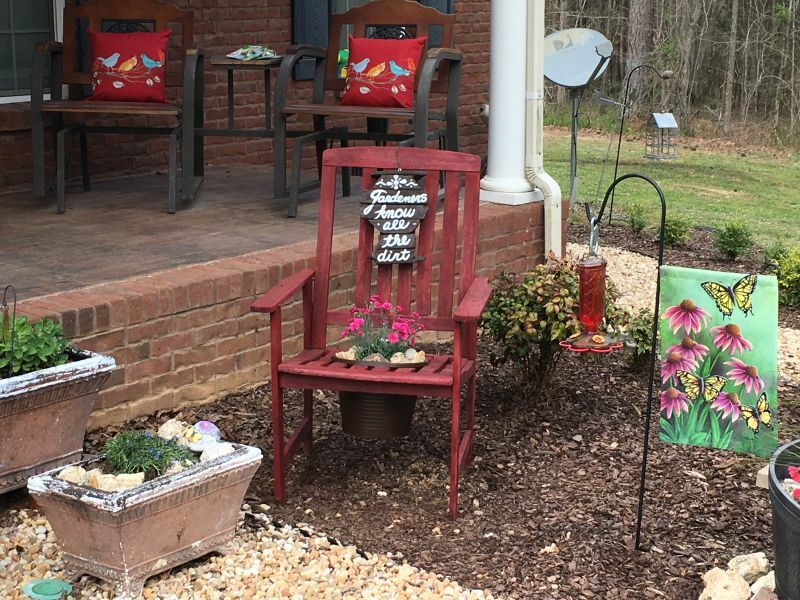 The project was very easy and the addition of elastic helps keep it looking neat while hopefully deterring him from pulling the pillows out. He really was excited to have a new place to call his own and so far it is working out great. Of course we made one for Jean Luc as well. He looks so content here. 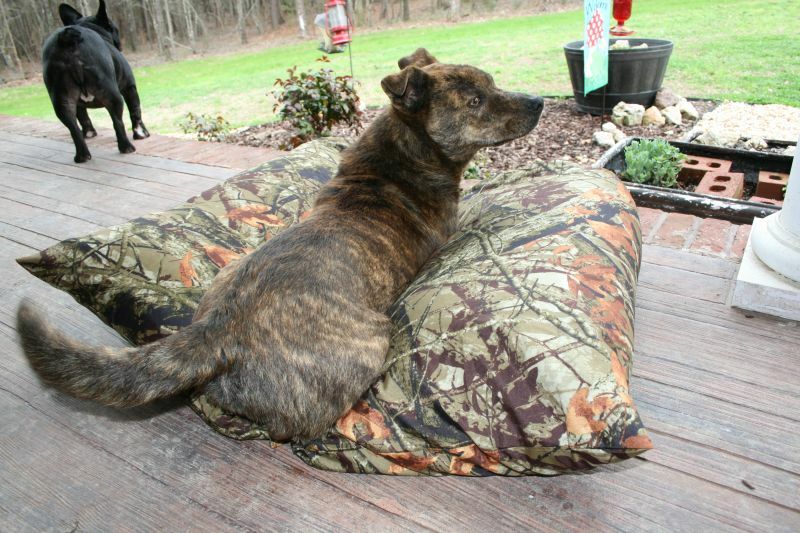 If you are interested in making a pet pillow, download the pattern below. We hope you have enjoyed this post, share what you have learned and are generous with what you make. Someone will appreciate your hard work! 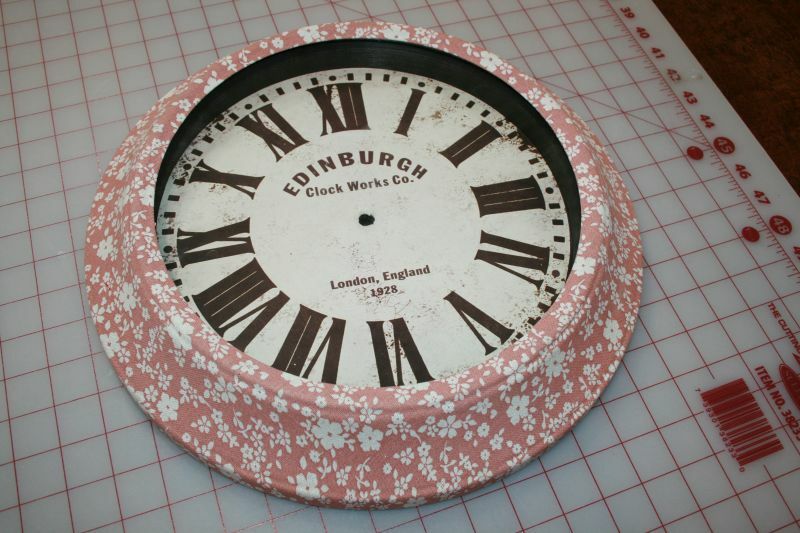 If you are a crafter, you are probably like me always on the hunt for free projects. 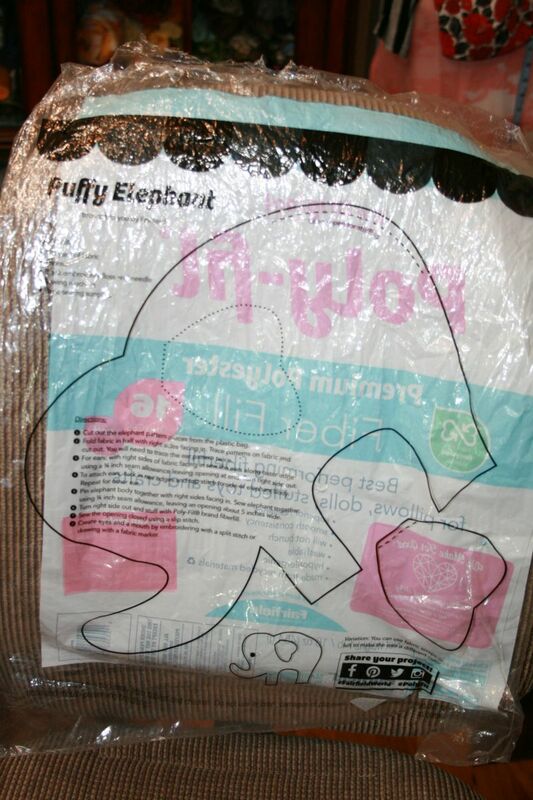 I use fiberfill all of the time and there is a pattern on the back of the Poly-fil bags. As you can see from the photo above, it is a stuffed elephant. I was curious to see how it would turn out. It was an easy project and could be completed within a couple of hours. 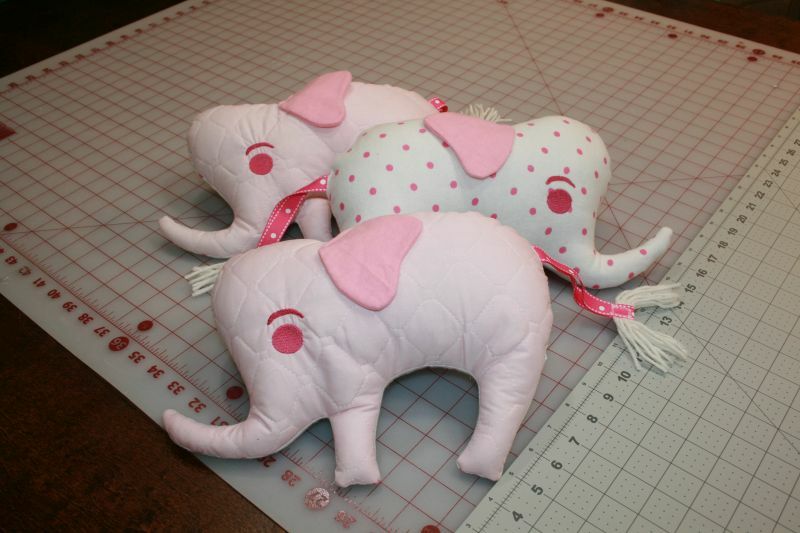 I decided to make three elephants. 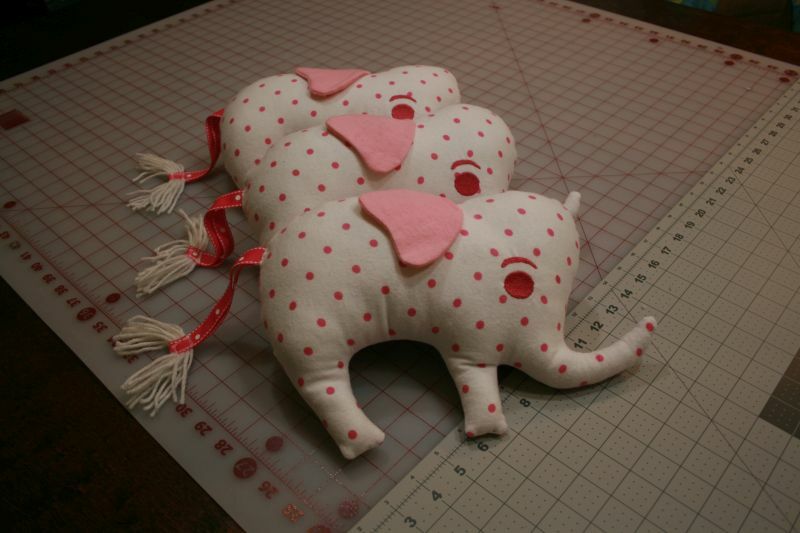 They were going to be a gift for three different children in the same household, so I made them exactly the same. You could do a monogram on the rump area which would be very sweet. I also chose to use two different fabrics. Convertible toys are a unique gift item and will add to the imaginative play. The original pattern did not include a tail, but I thought it would be an easy addition by using ribbon and yarn. 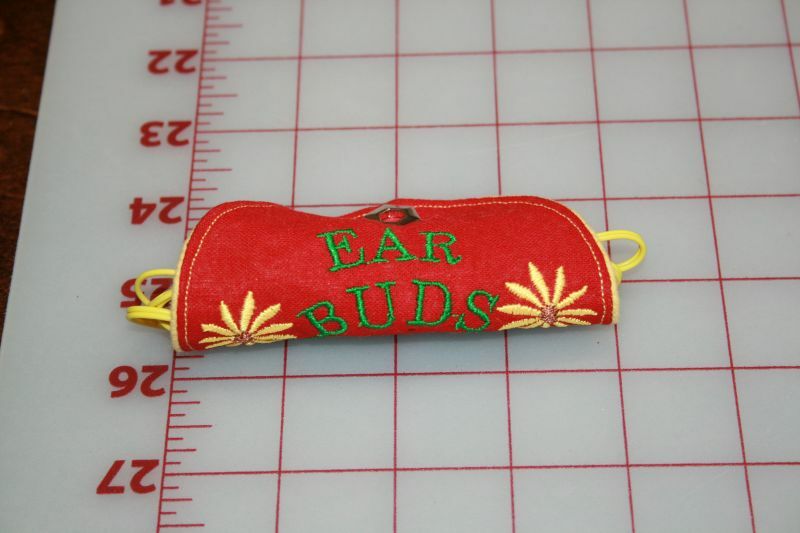 You can really customize these as much as you want. 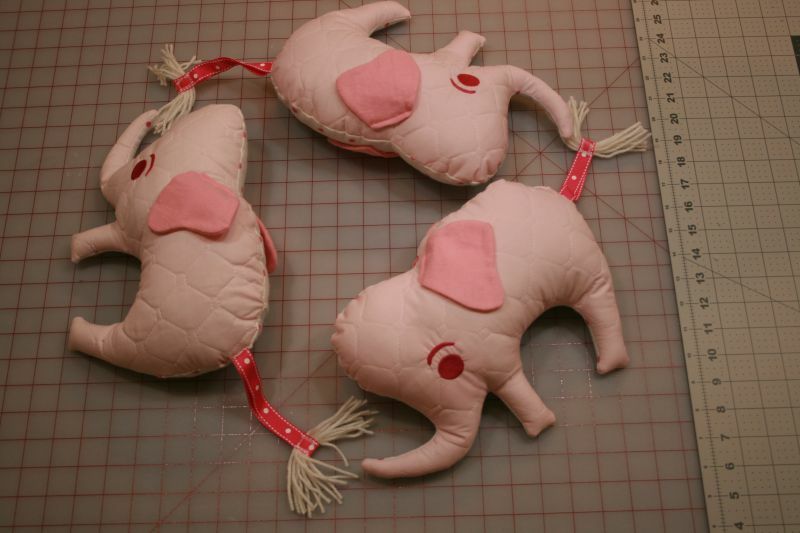 The eye for my elephants was done with an embroidery machine. 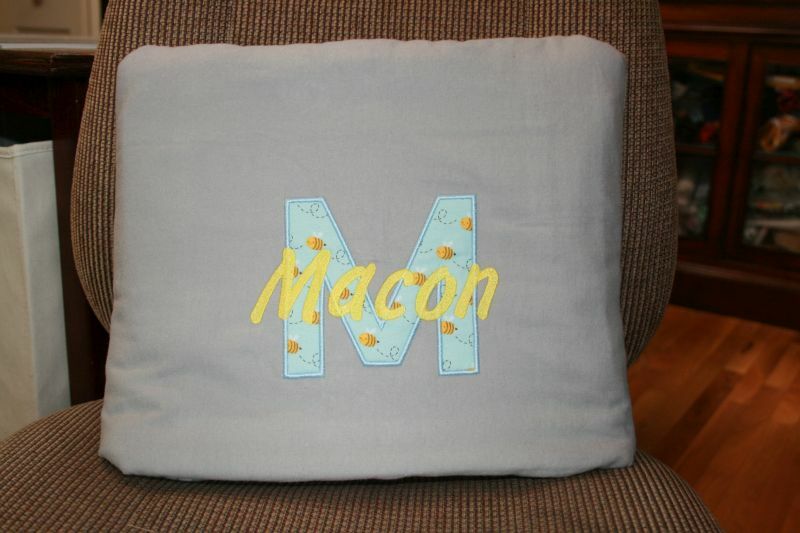 You could hand embroider or use buttons, ribbon or paint. 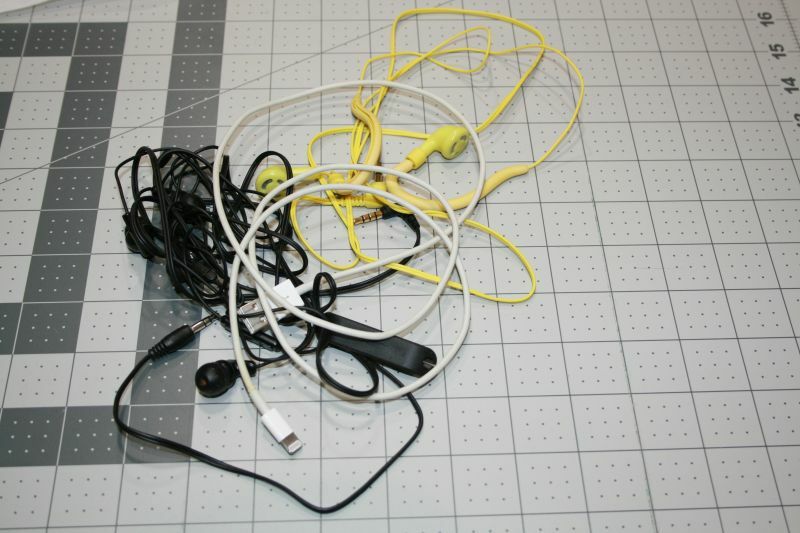 Just be mindful of the receiver and be safe with things that might be a choke hazard. 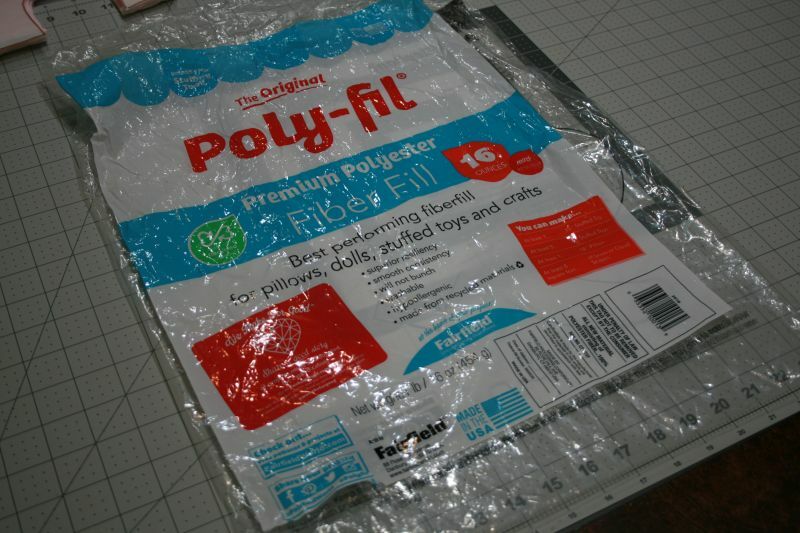 The Poly-fil brand is very common and I use it a lot because it is the brand my local stores carry(*No affiliation*). They also have a website that has many more project ideas. You can click here to be redirected. I have a download below with more detailed instructions than what are printed on the bags. There are color pictures and my process. I also have a download below for the embroidery file of the eye. This was digitized by me and you are free to use it for any projects. 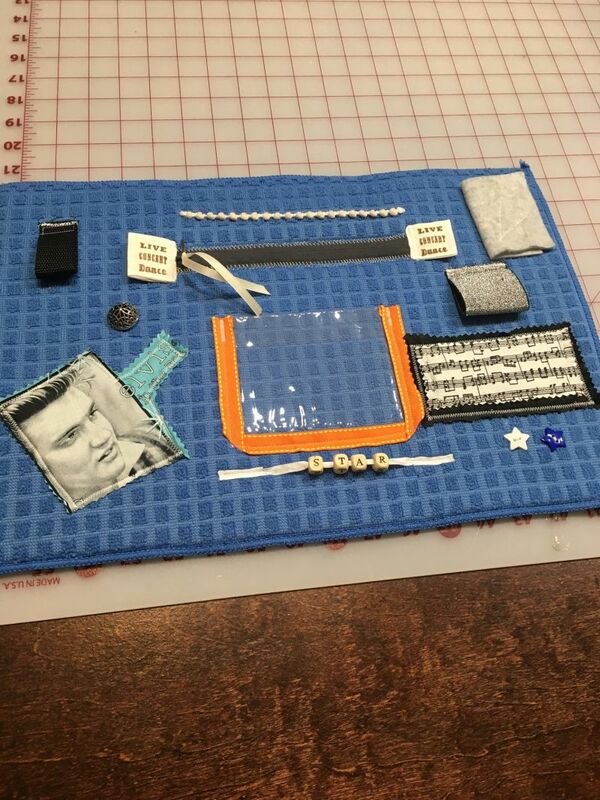 There should be several different file types in the zipped file so I am hoping you will be able to use it on any embroidery machine with a 4x4 hoop size. If you use the file for any projects, I'd love to hear about it. Let me know through the comments below or on my contact page. I hope you have enjoyed this post, share what you have learned and are generous with what you make. Someone will appreciate your hard work.